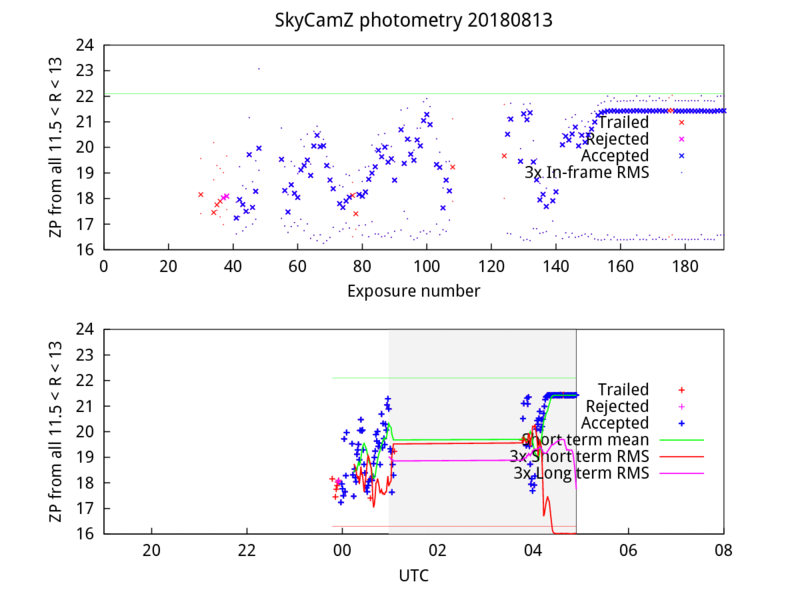 In the tables below, Observing, Weather and Technical refer to time spent observing, time lost to bad weather, and time lost because of technical problems. 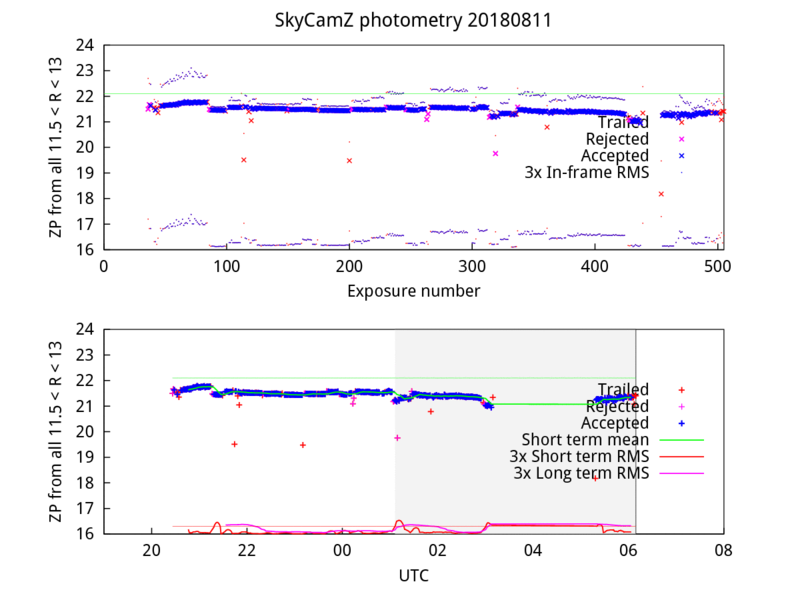 Note that Observing includes time spent on calibration observations and, occasionally, scheduled on-sky test observations; Technical does not include scheduled downtime (e.g. for planned engineering work). 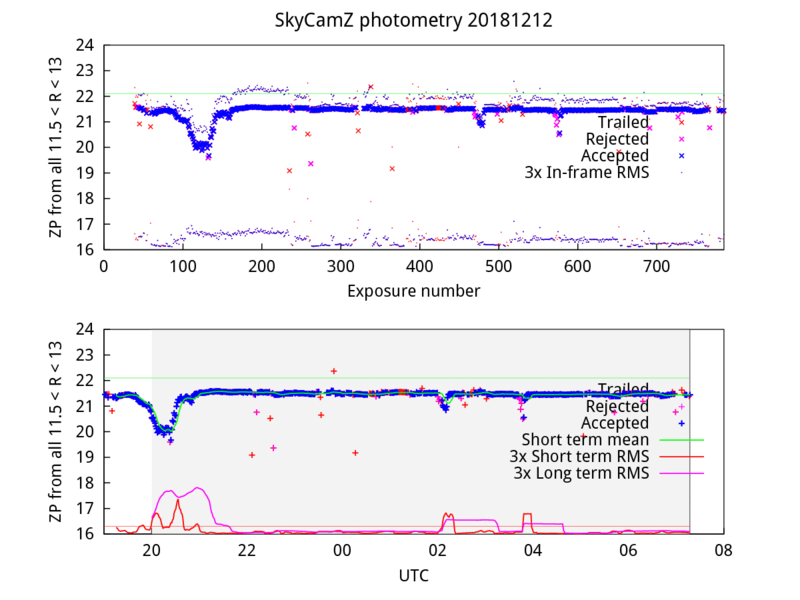 The Night Duty Officer estimates whether the night was photometric or non-photometric (spectroscopic) based on satellite imagery and SkyCam data obtained through the night. 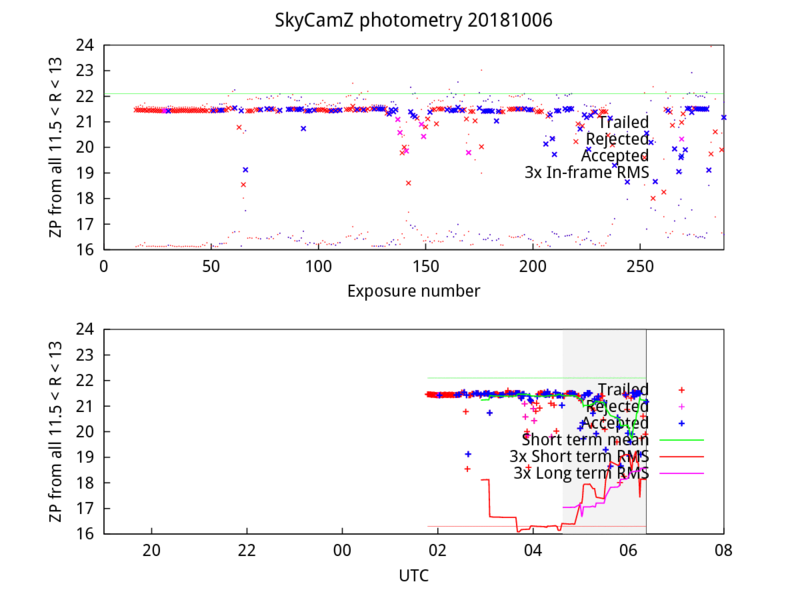 This is a qualitative assessment only and may not always be entirely accurate. 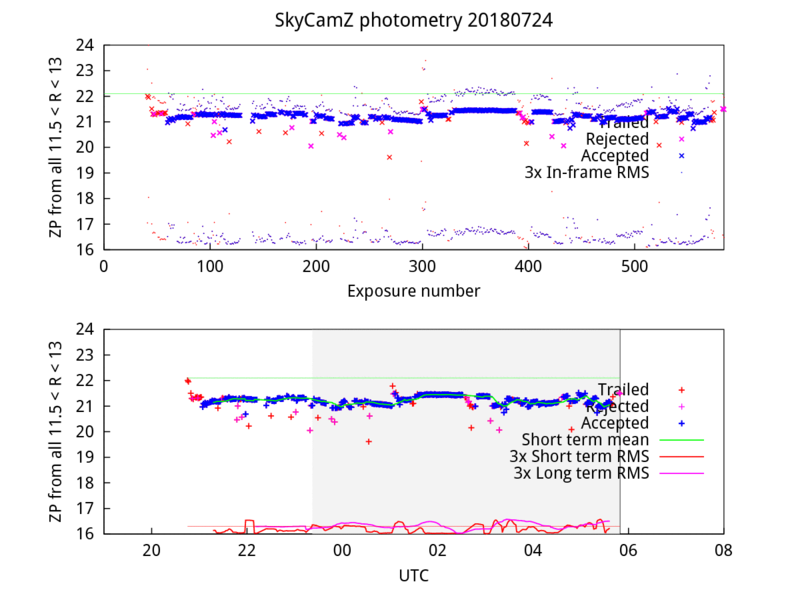 IT IS POSSIBLE THAT, ON OCCASION, OBSERVATIONS REQUIRING PHOTOMETRIC CONDITIONS ARE ACQUIRED IN NON-PHOTOMETRIC CONDITIONS. 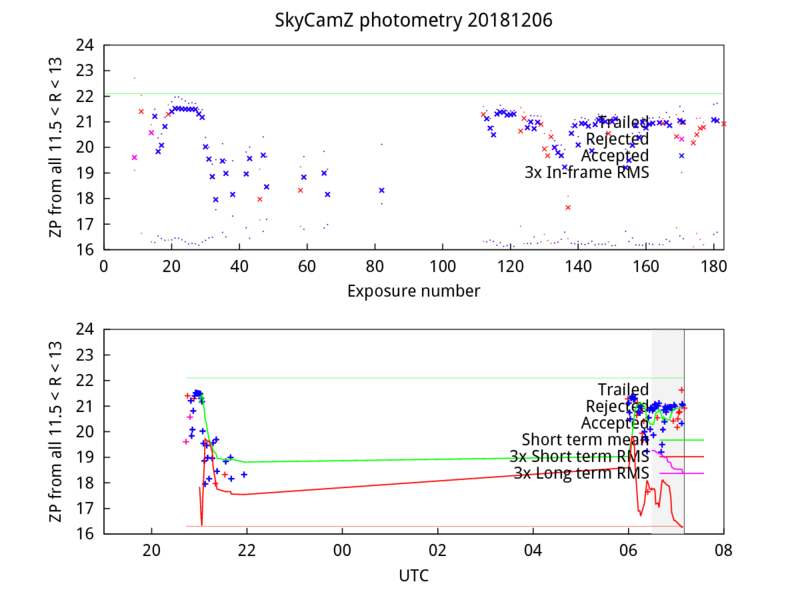 Users should check the quality of their data carefully. 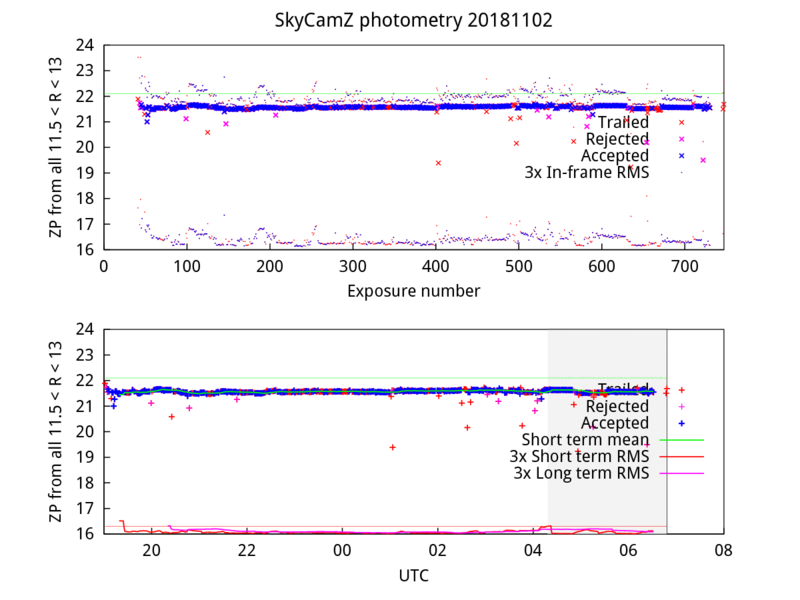 Good, average and poor seeing refers to inferred zenith seeing of < 1.0 arcsec, 1.0-2.0 arcsec, and > 2.0 arcsec, respectively. 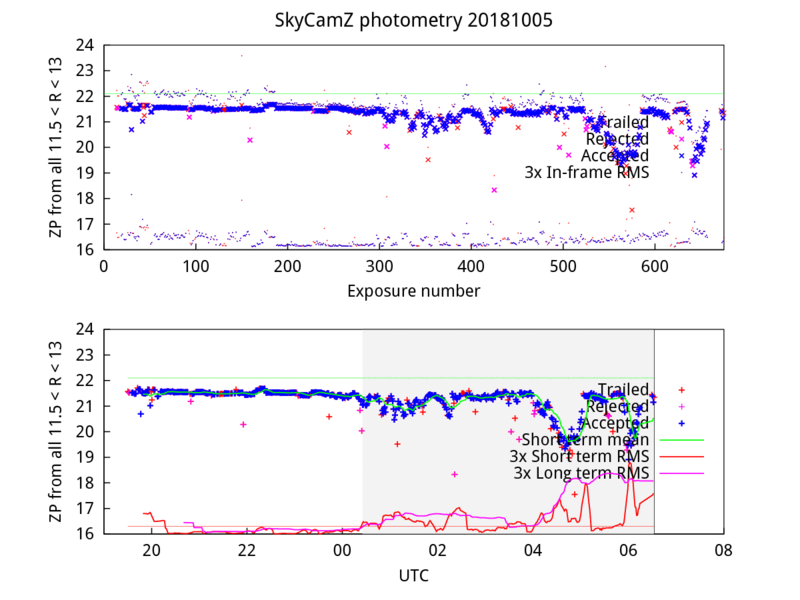 Calima refers to a warm wind that occasionally blows over from the Sahara and brings a lot of fine dust forcing a shutdown to protect the optics. 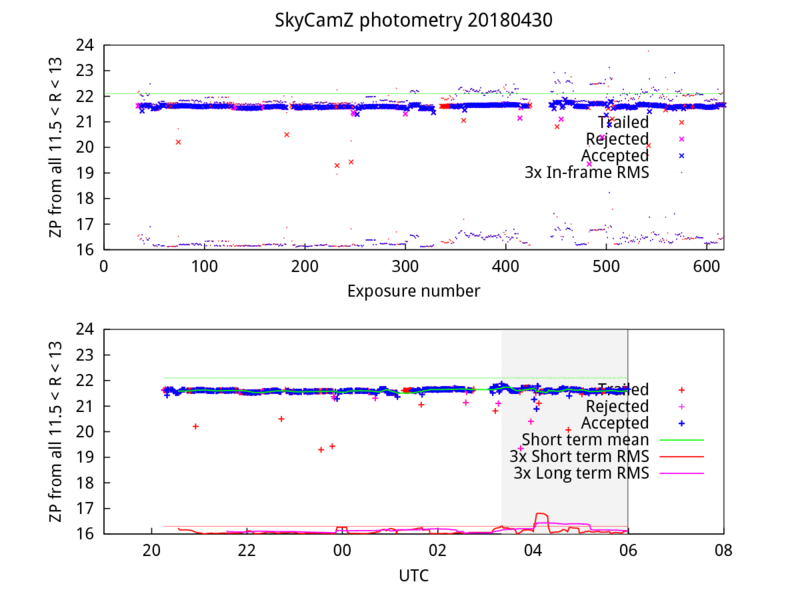 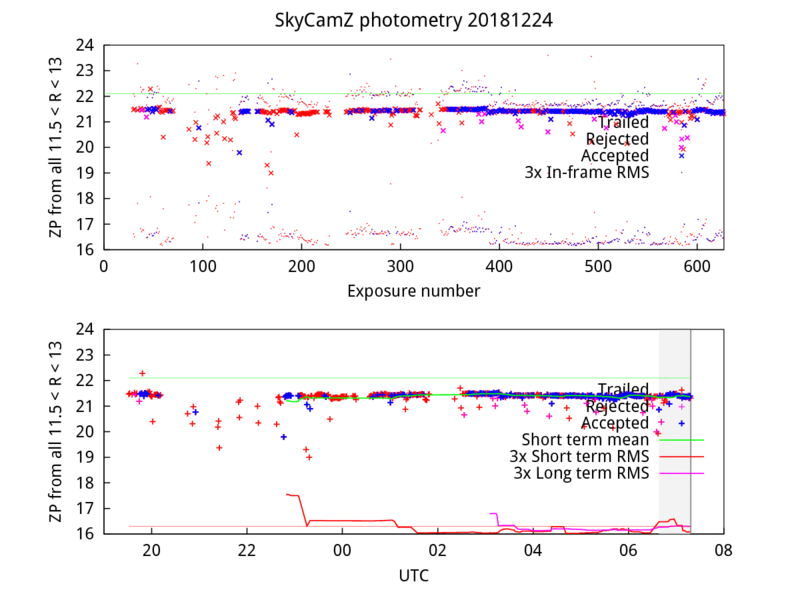 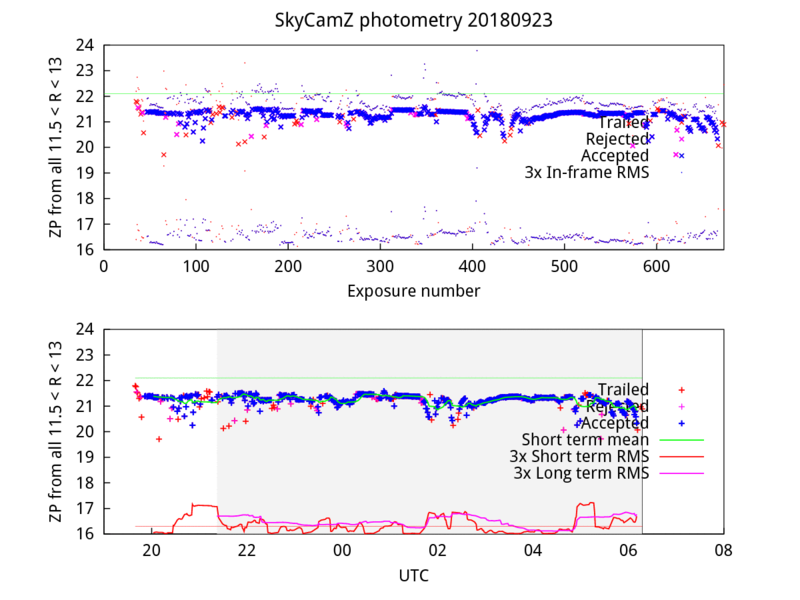 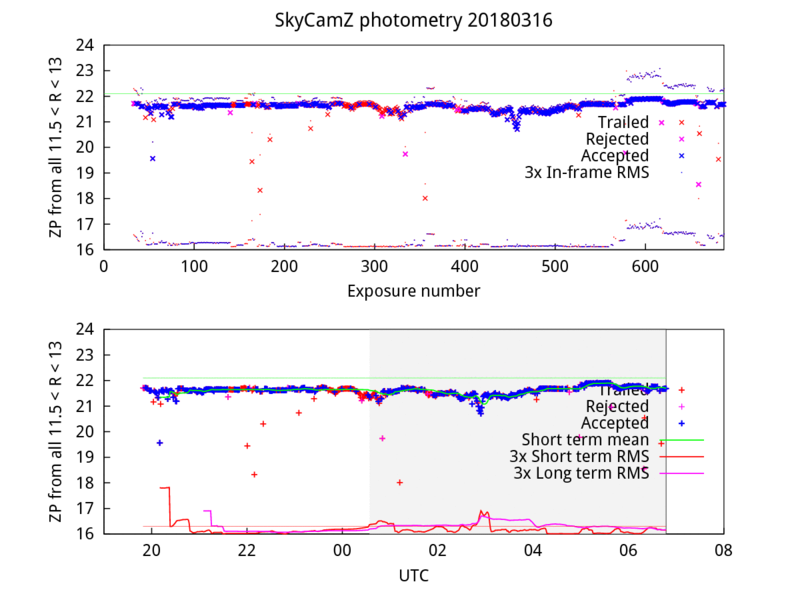 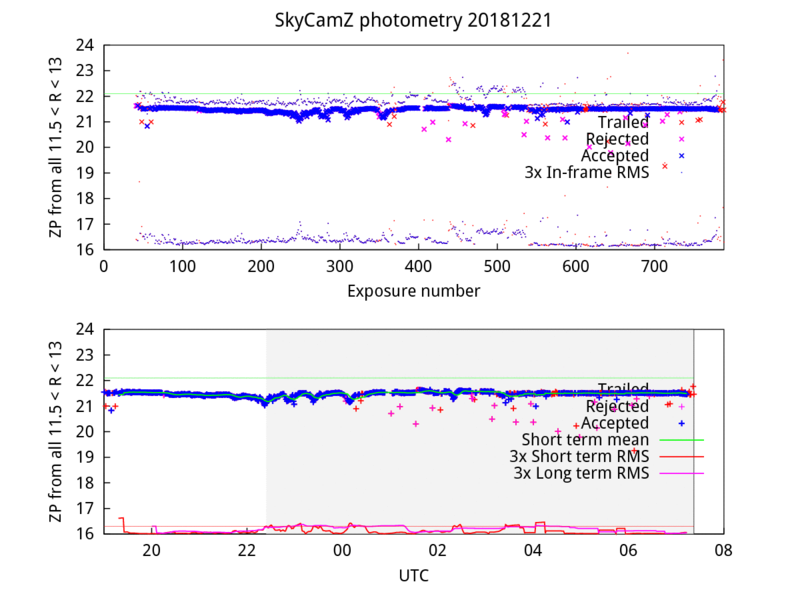 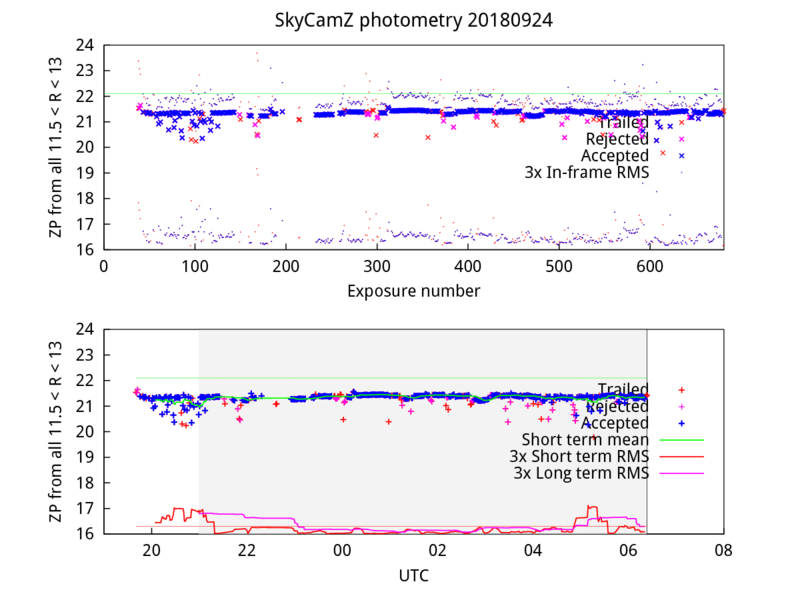 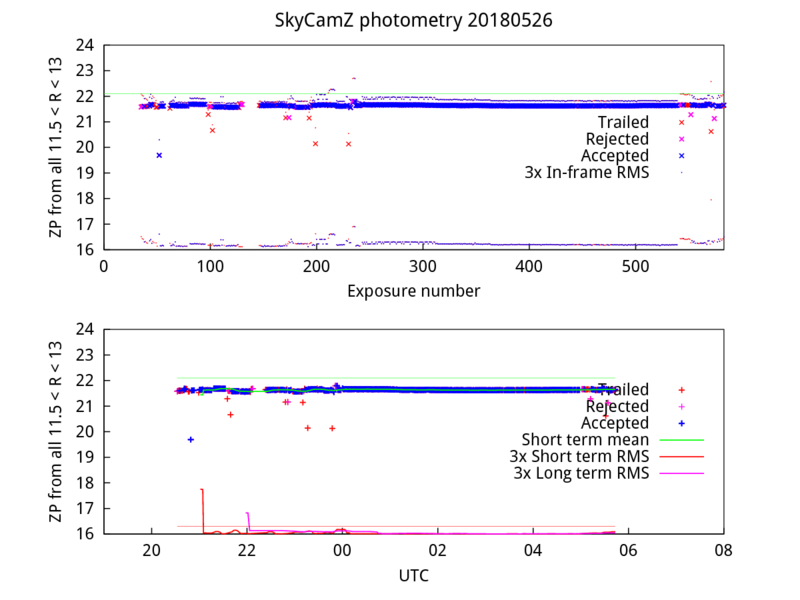 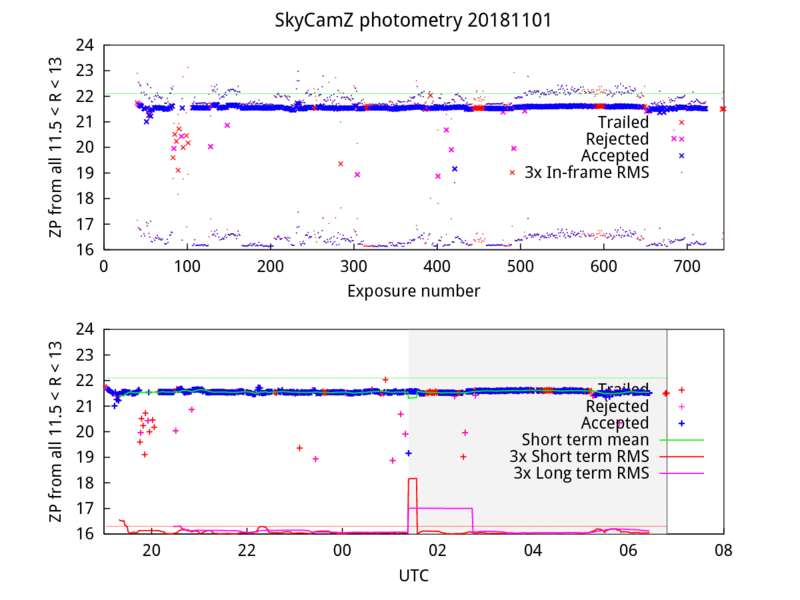 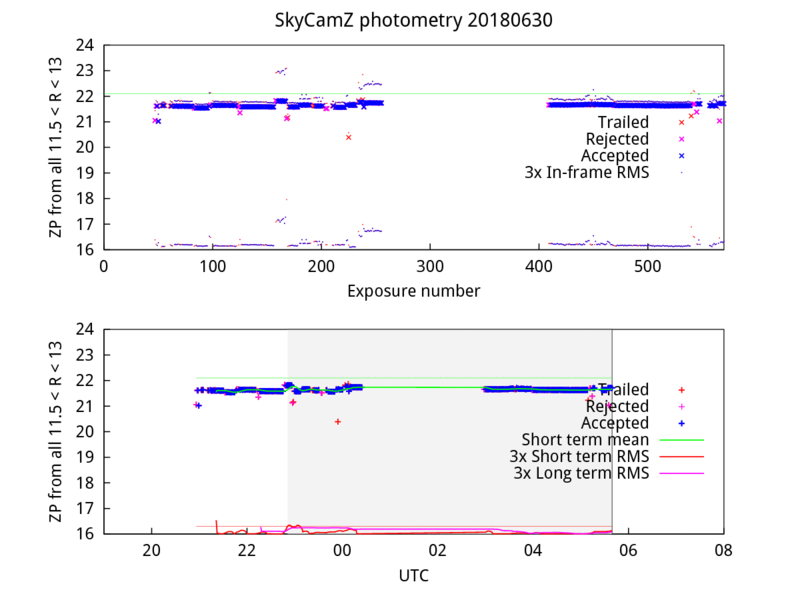 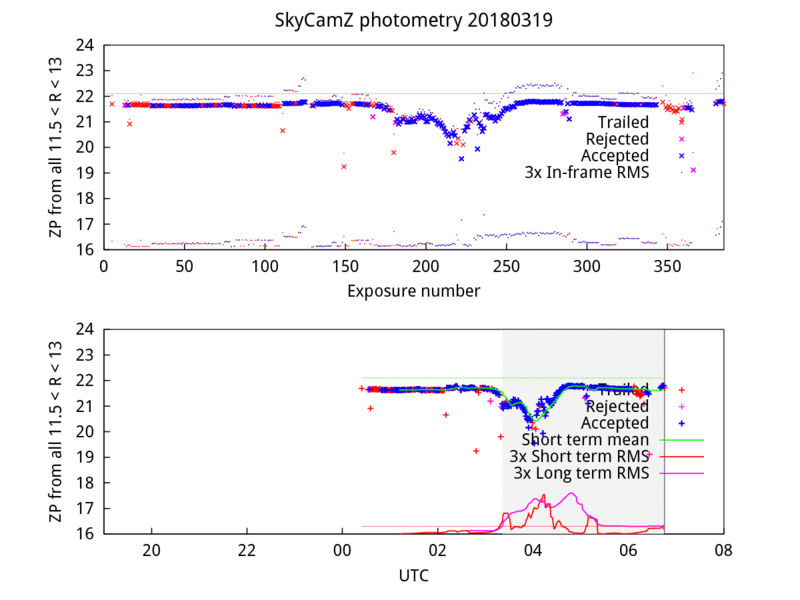 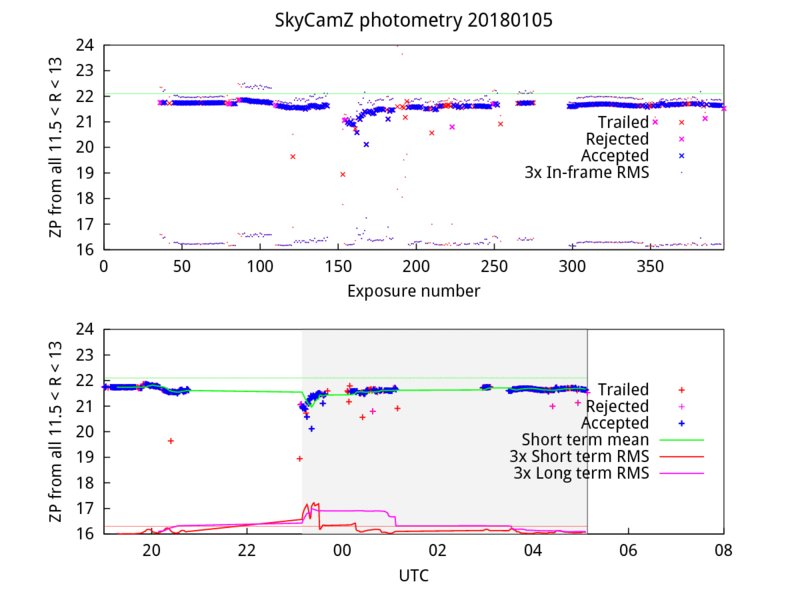 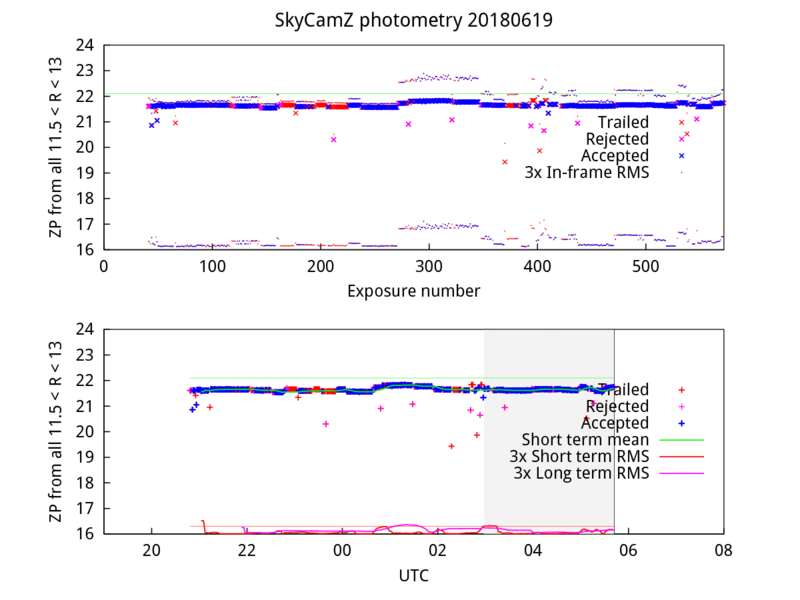 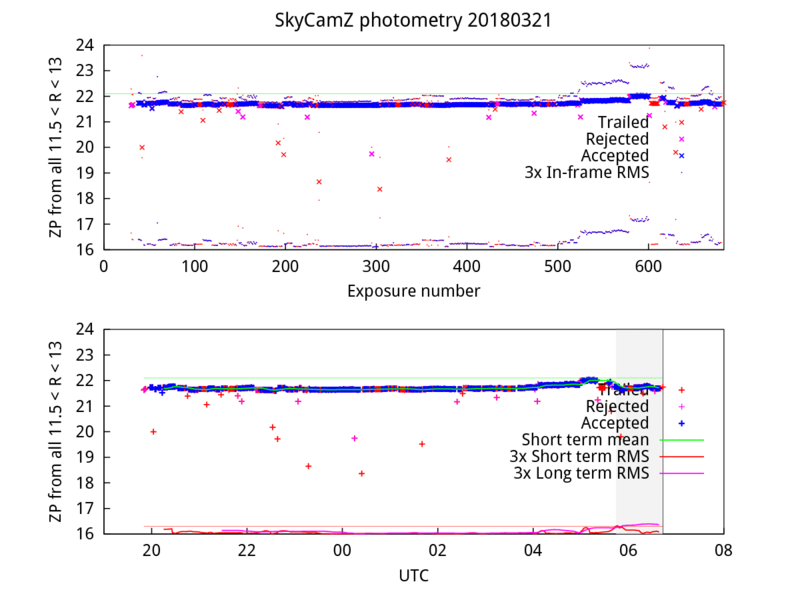 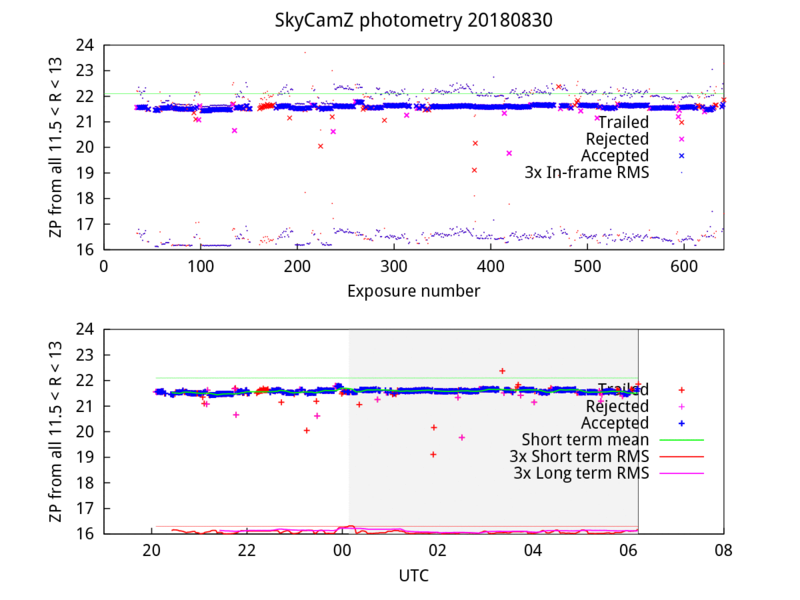 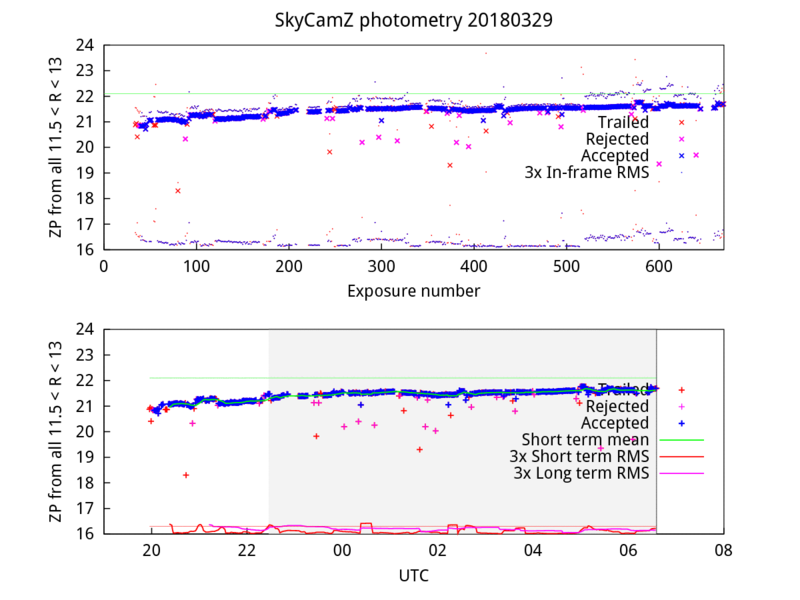 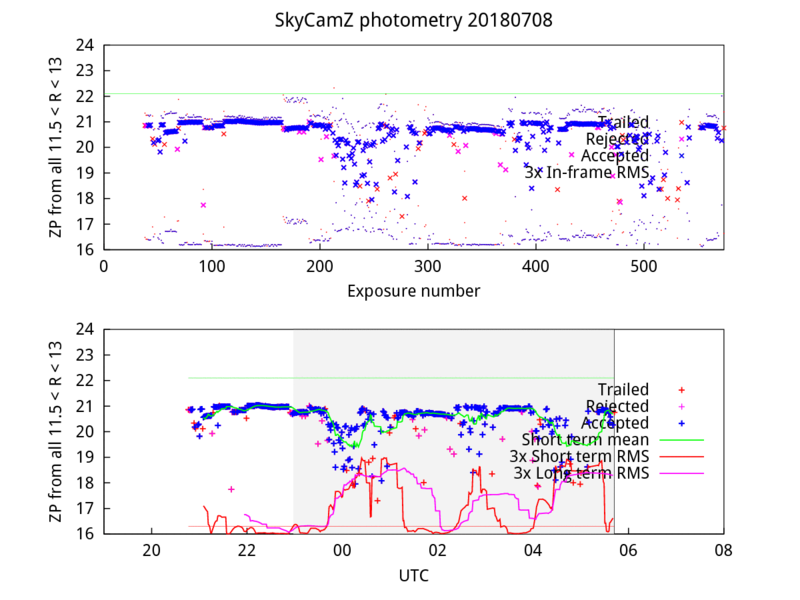 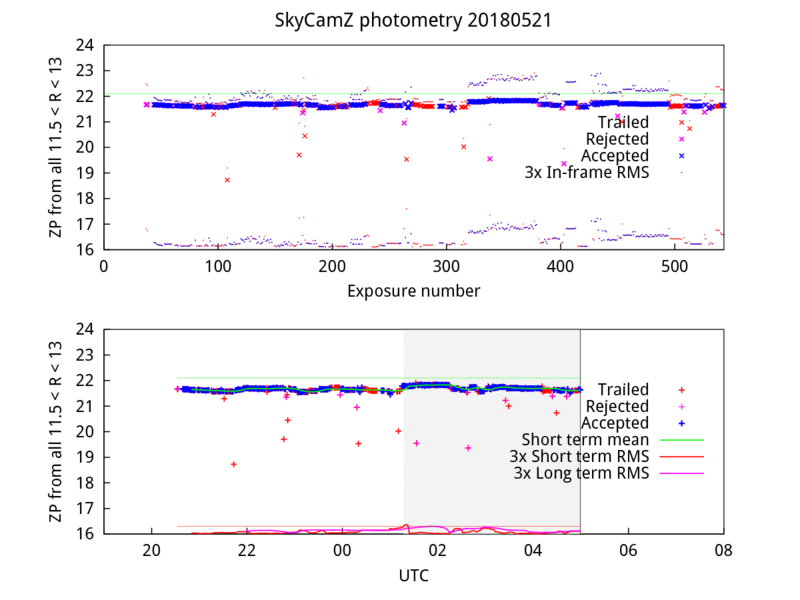 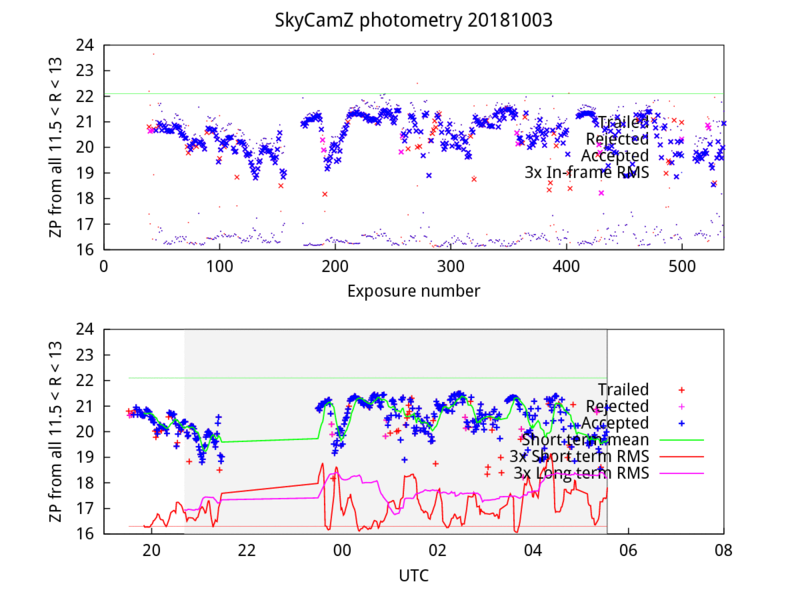 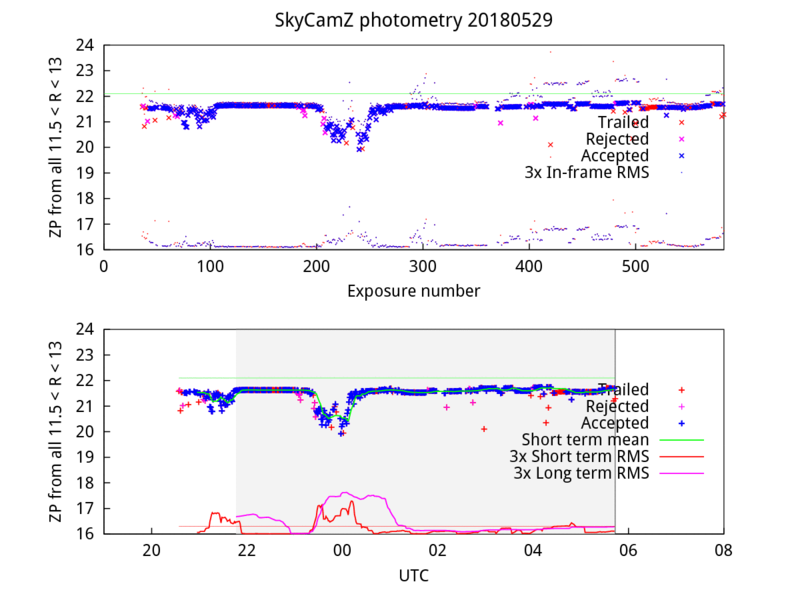 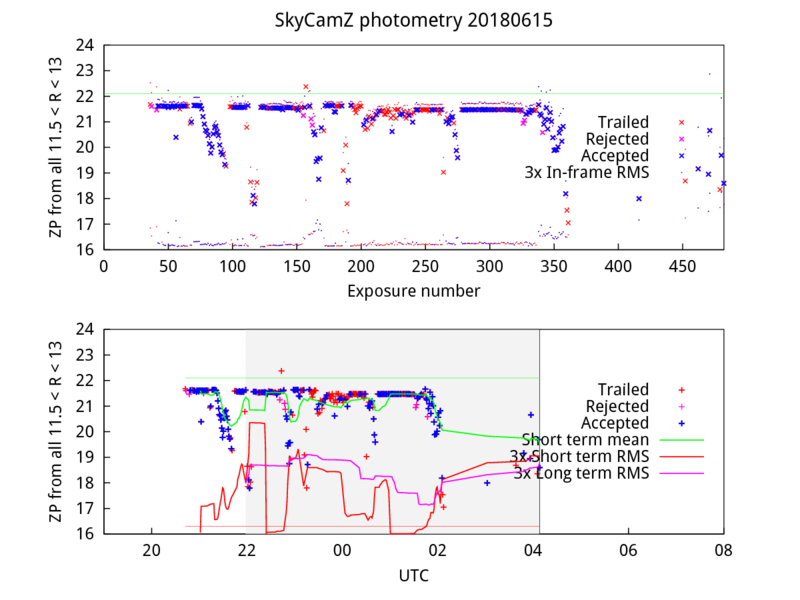 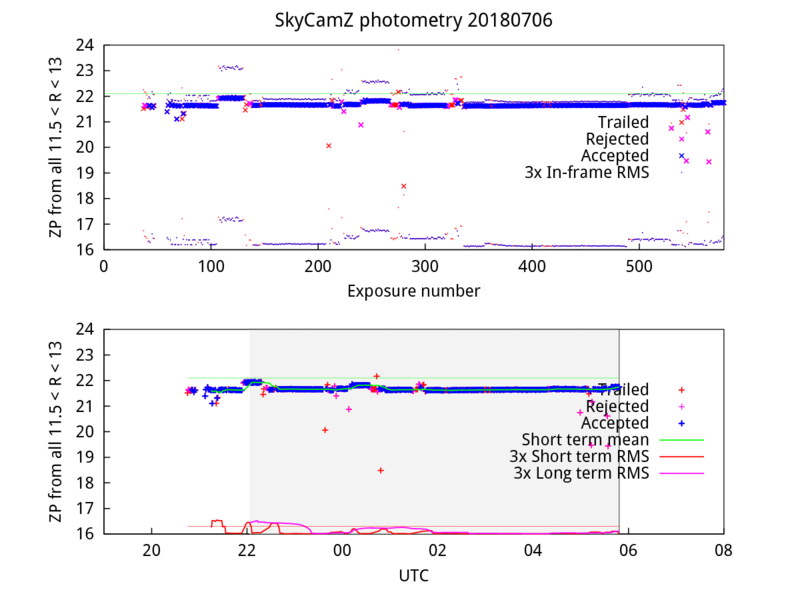 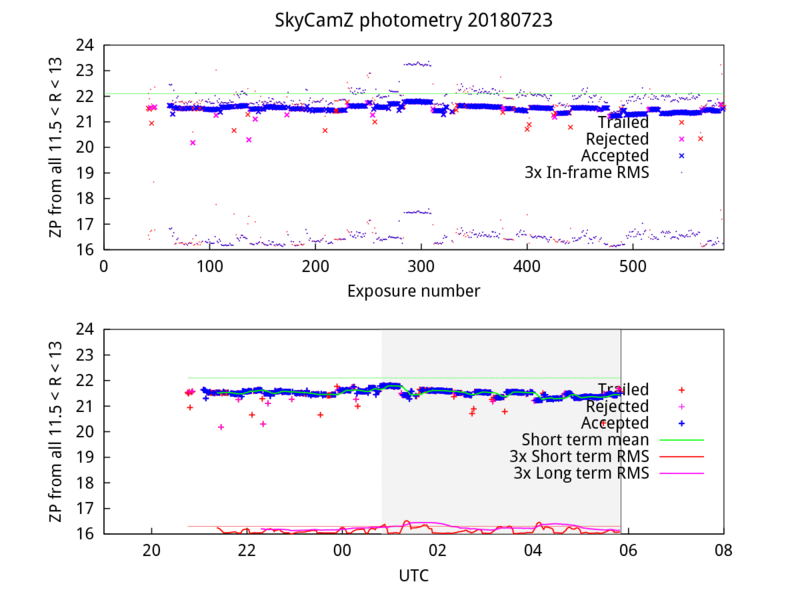 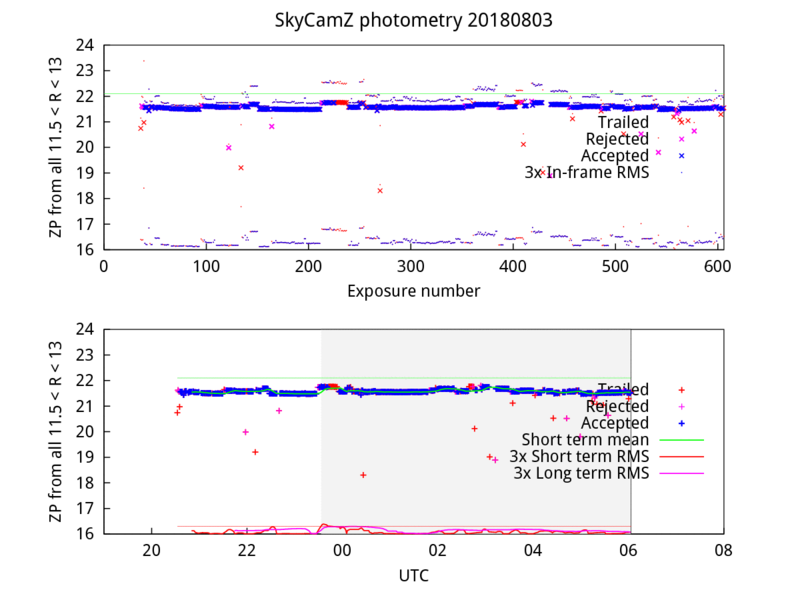 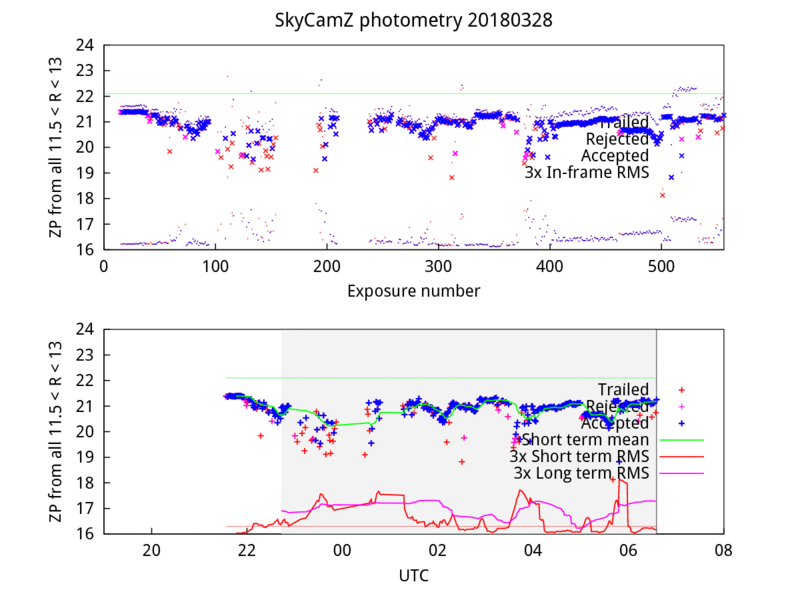 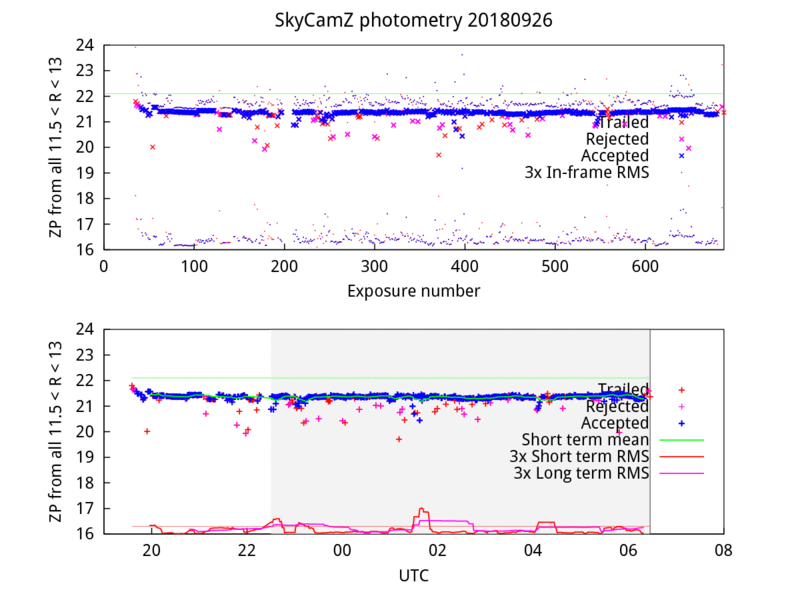 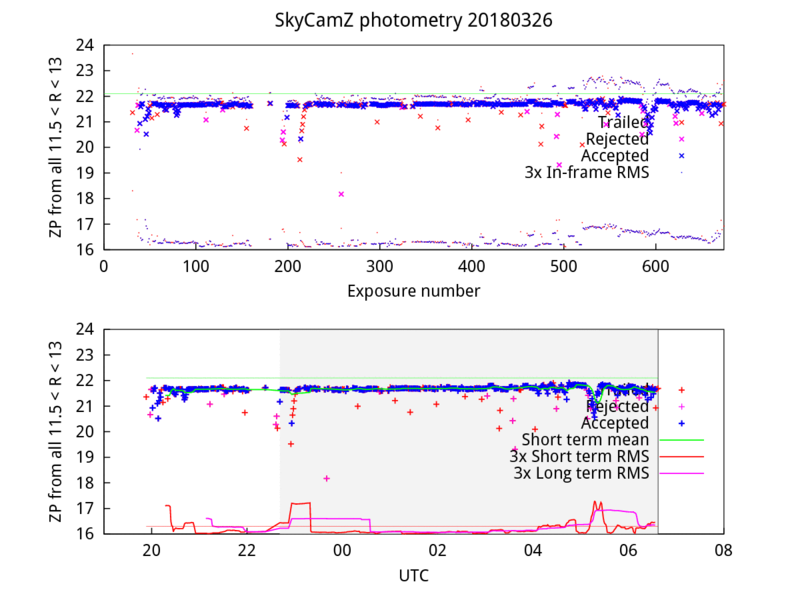 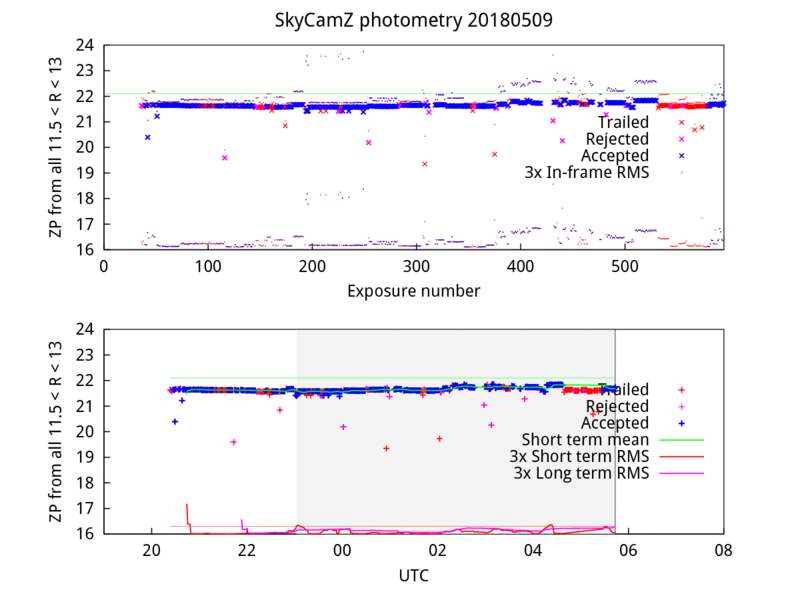 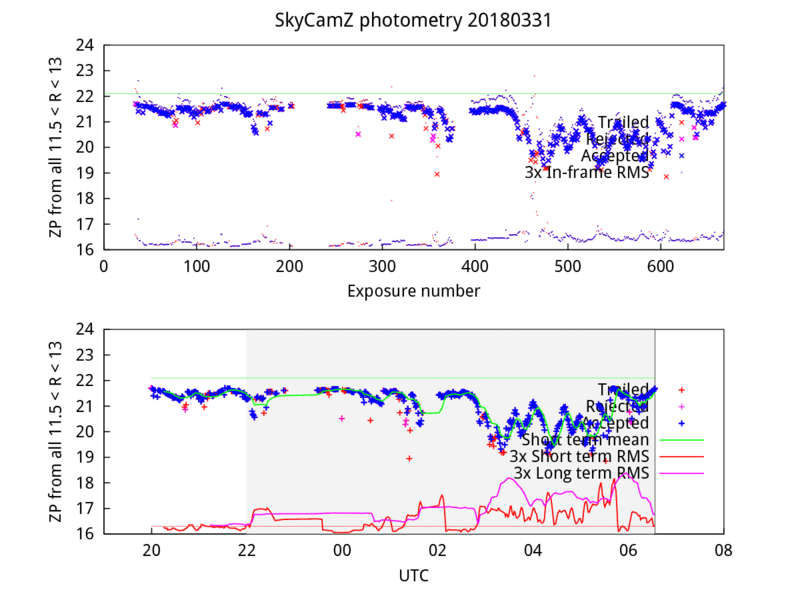 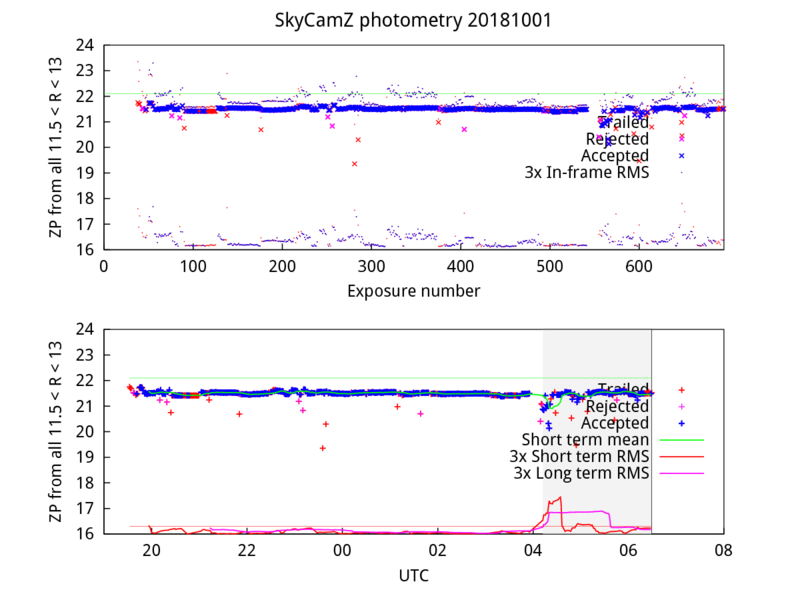 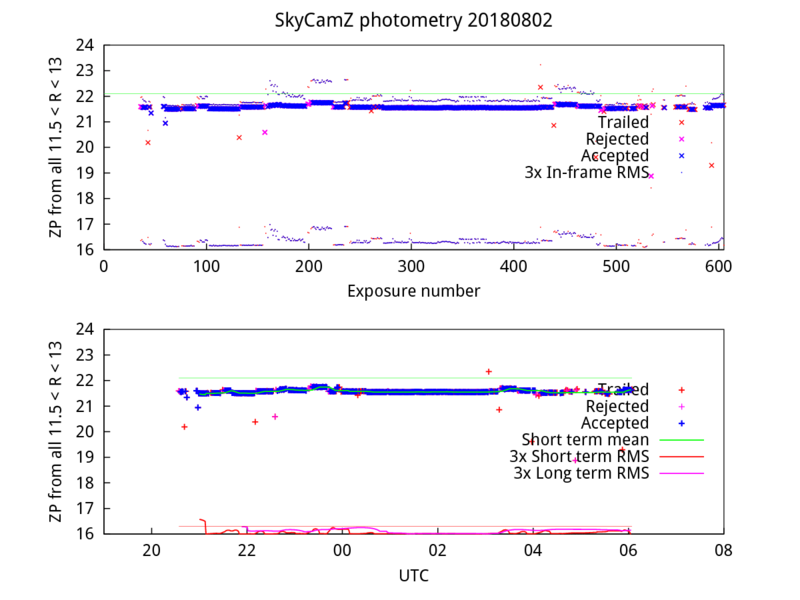 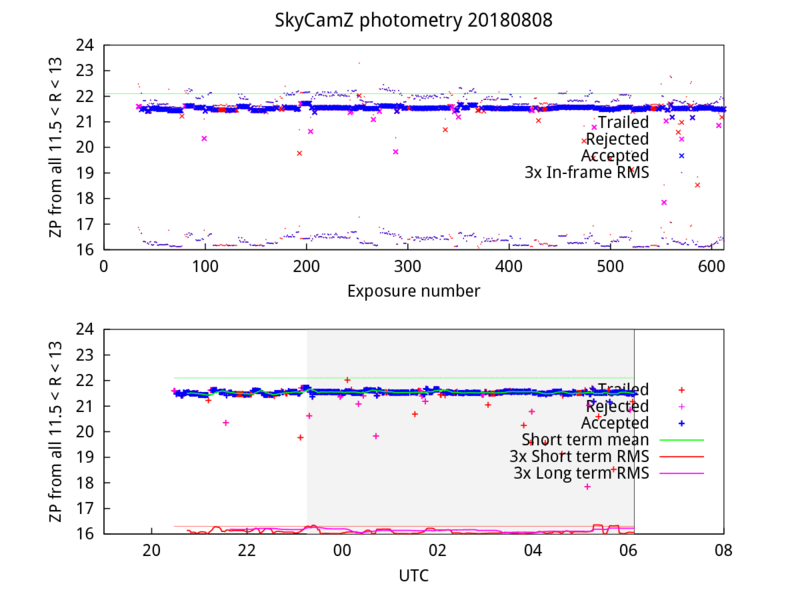 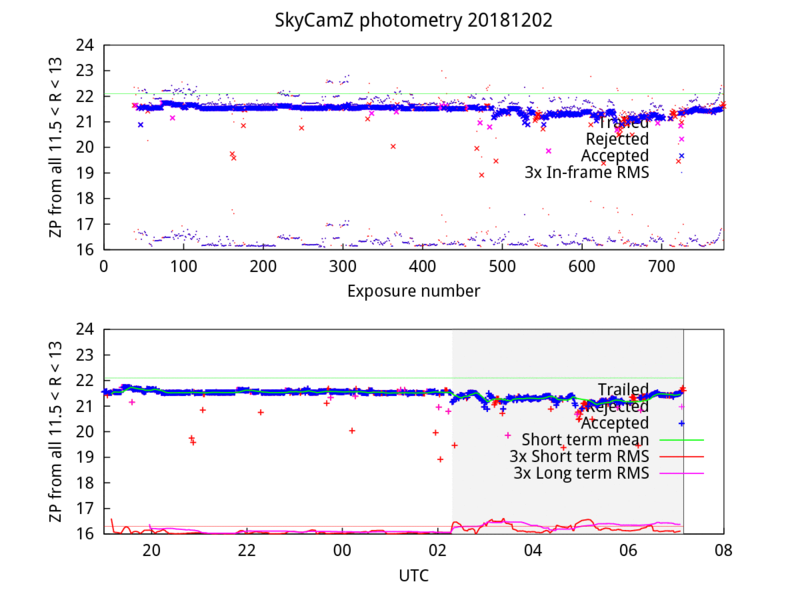 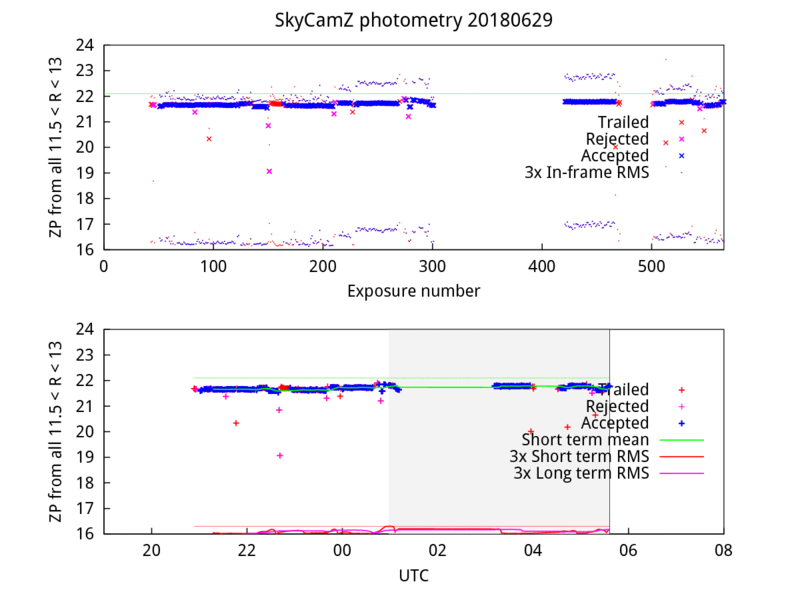 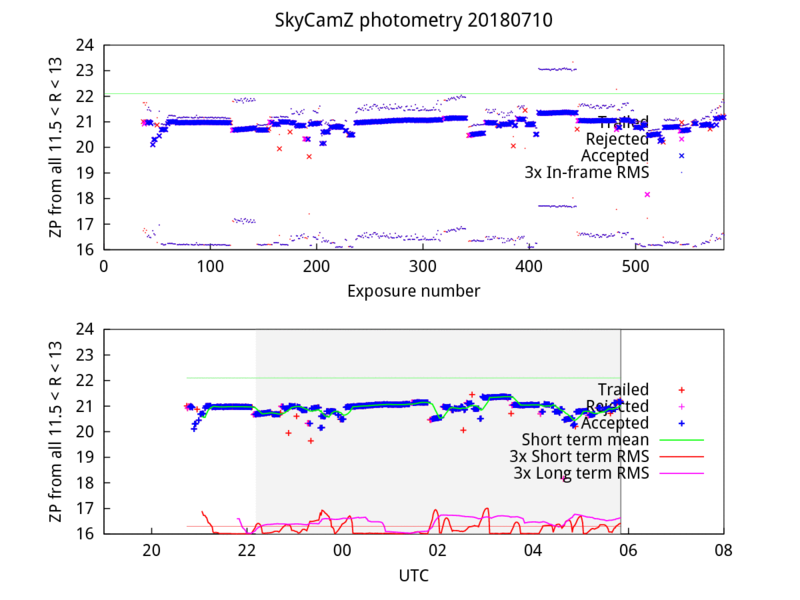 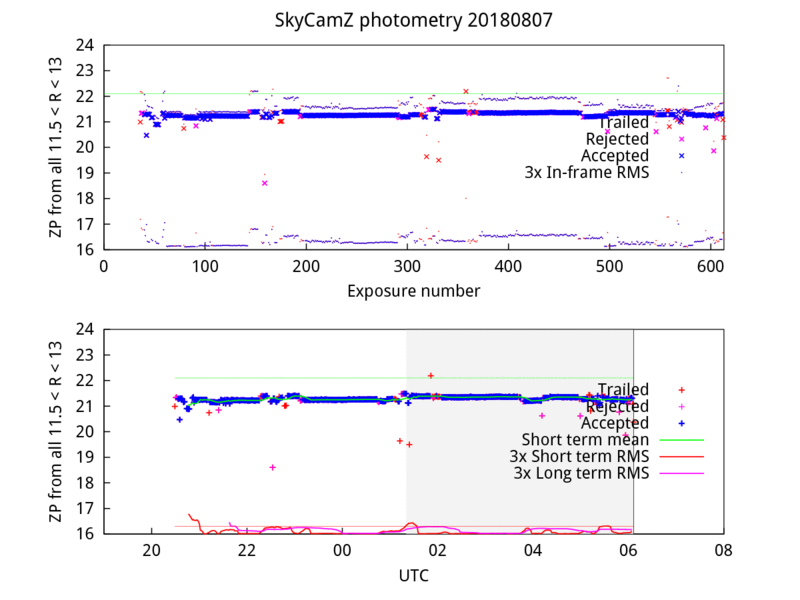 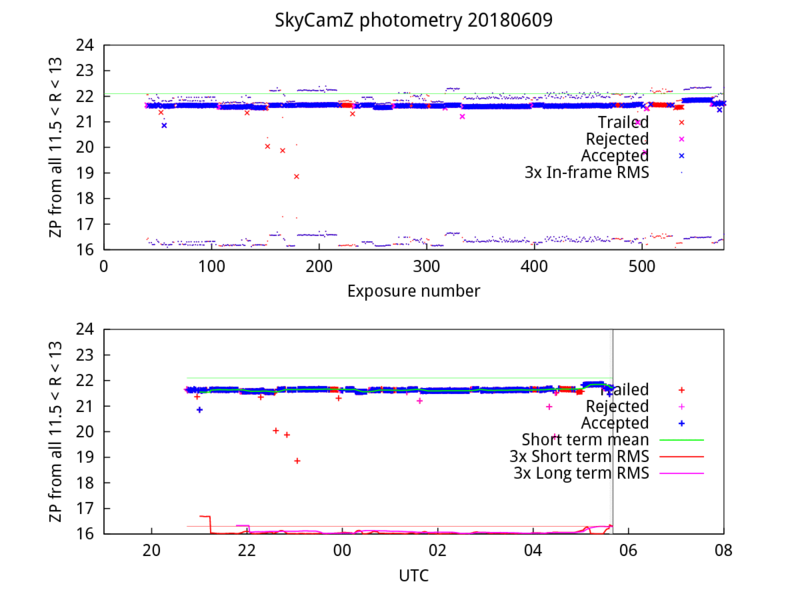 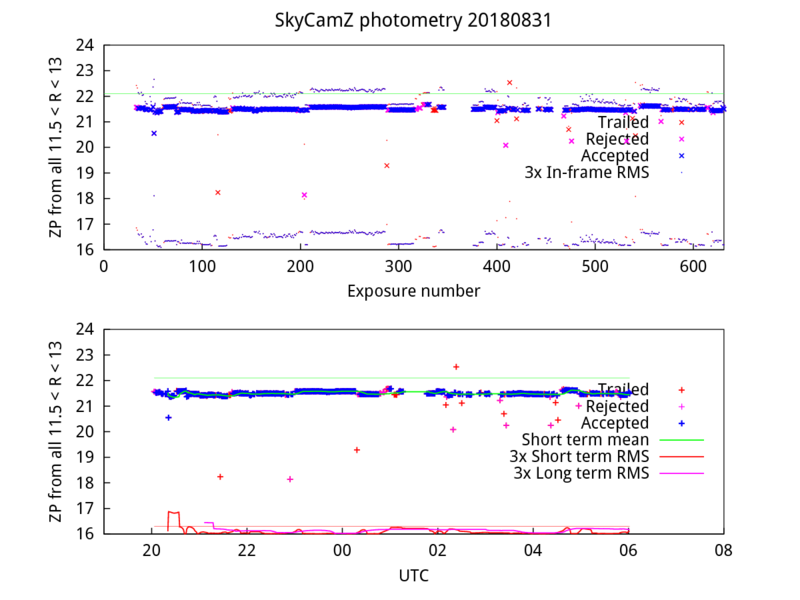 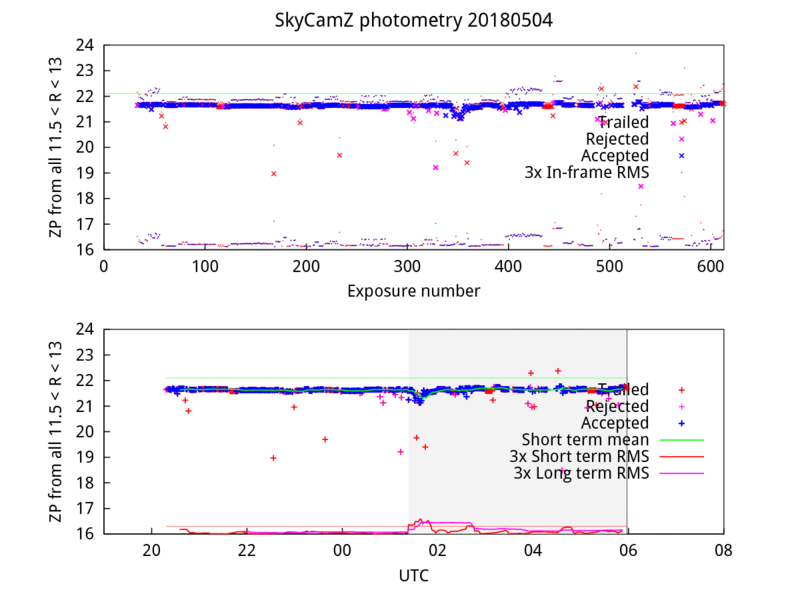 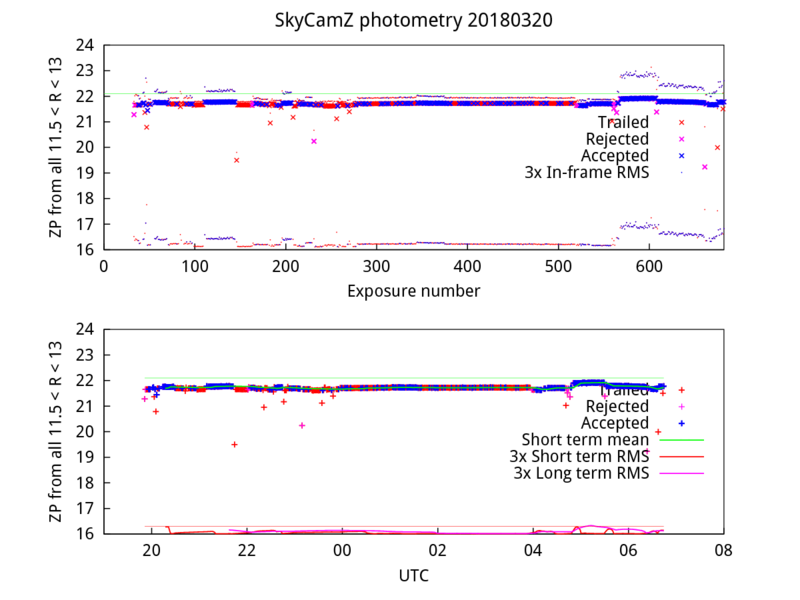 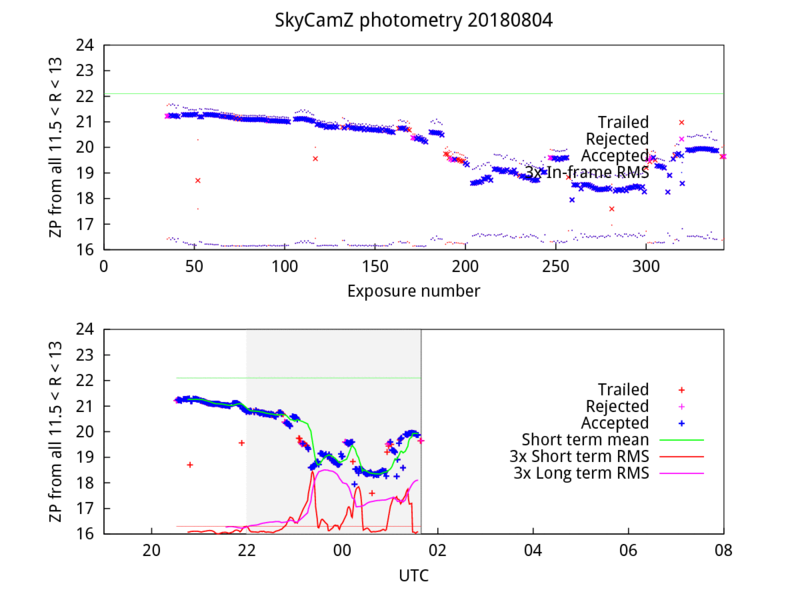 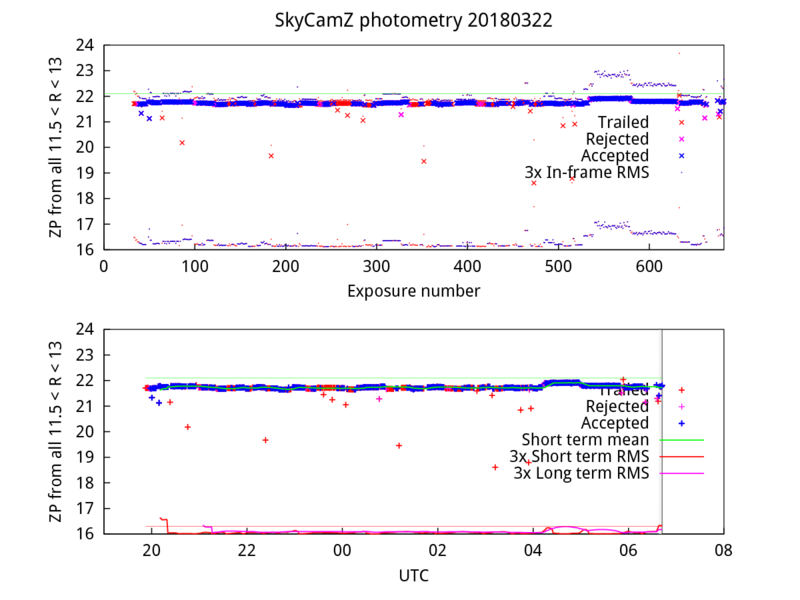 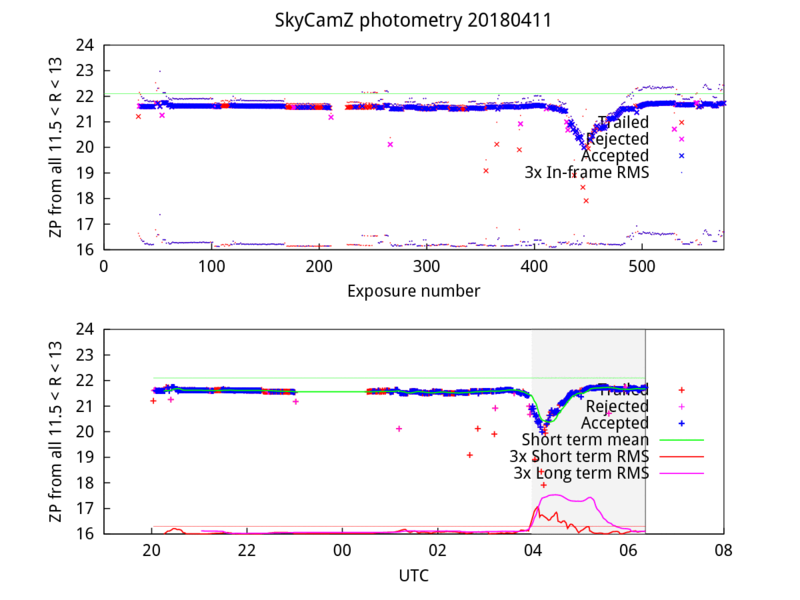 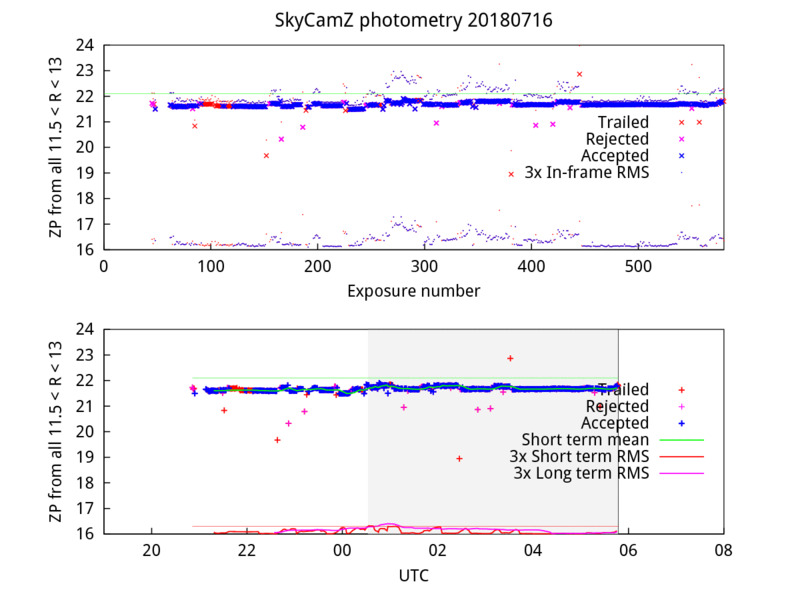 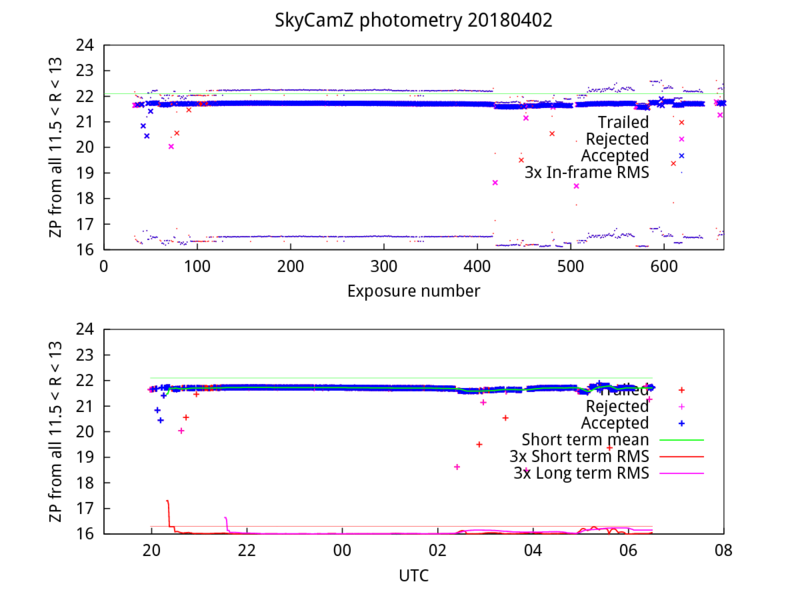 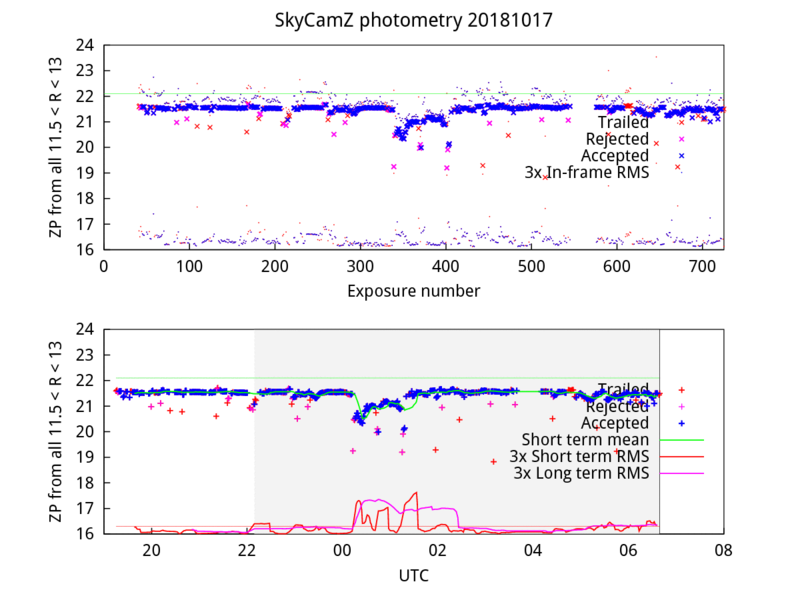 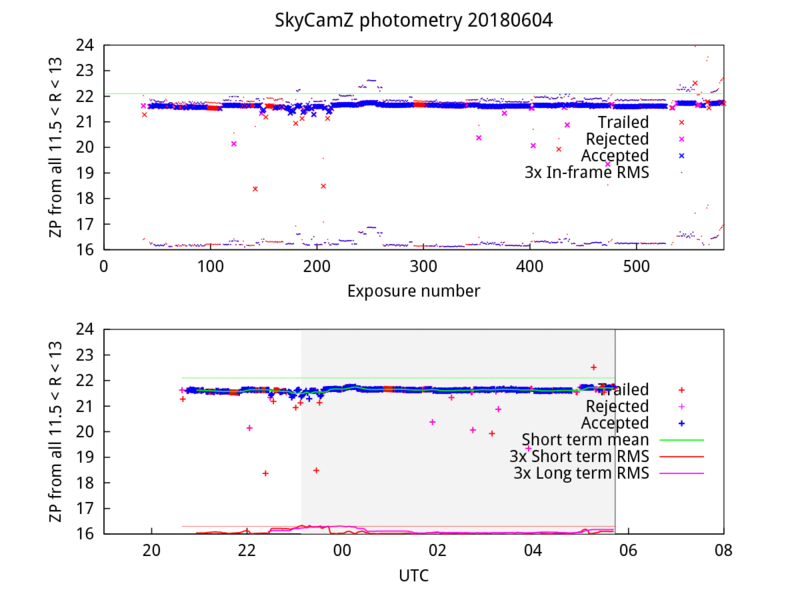 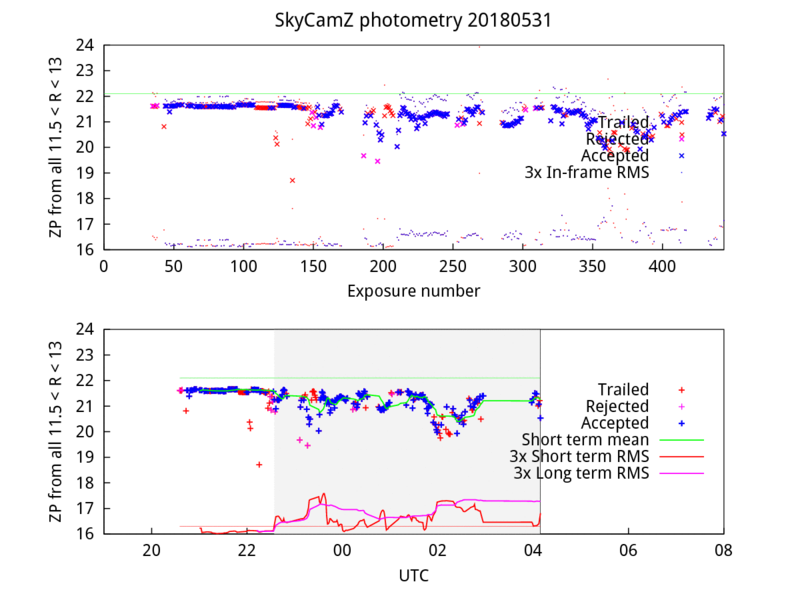 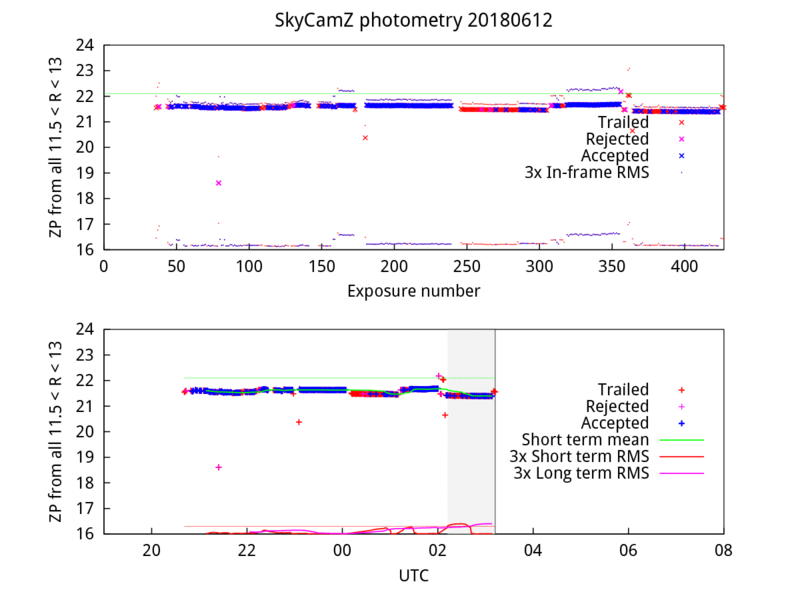 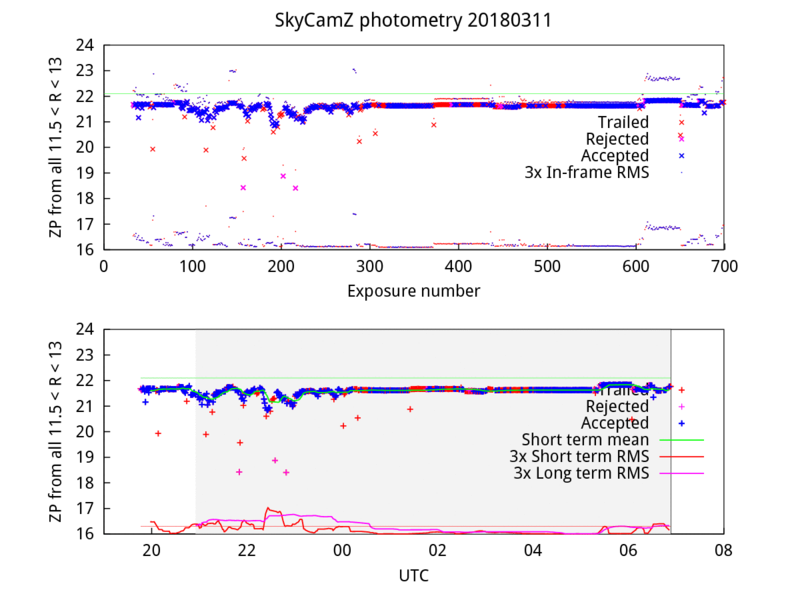 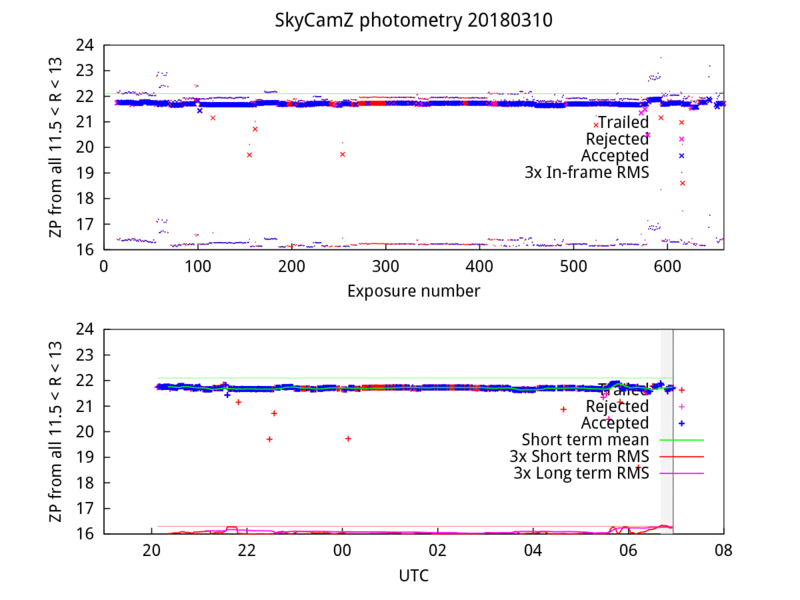 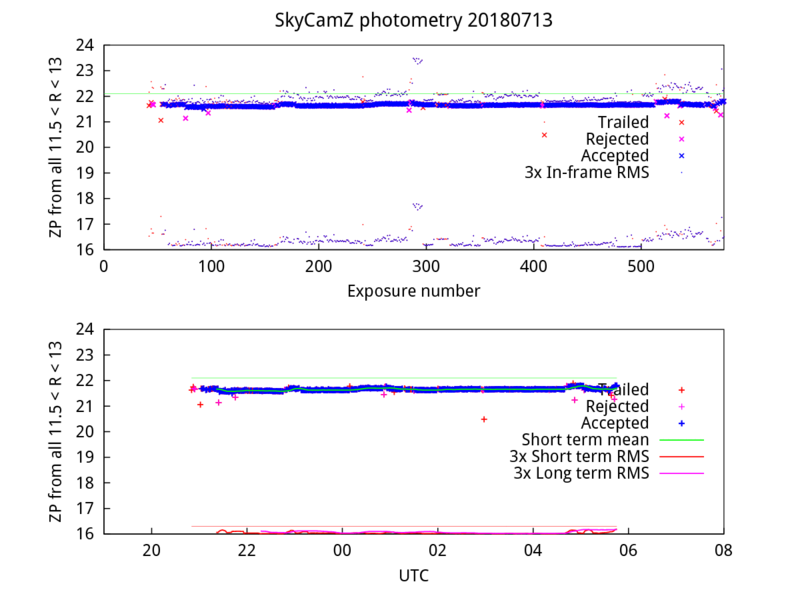 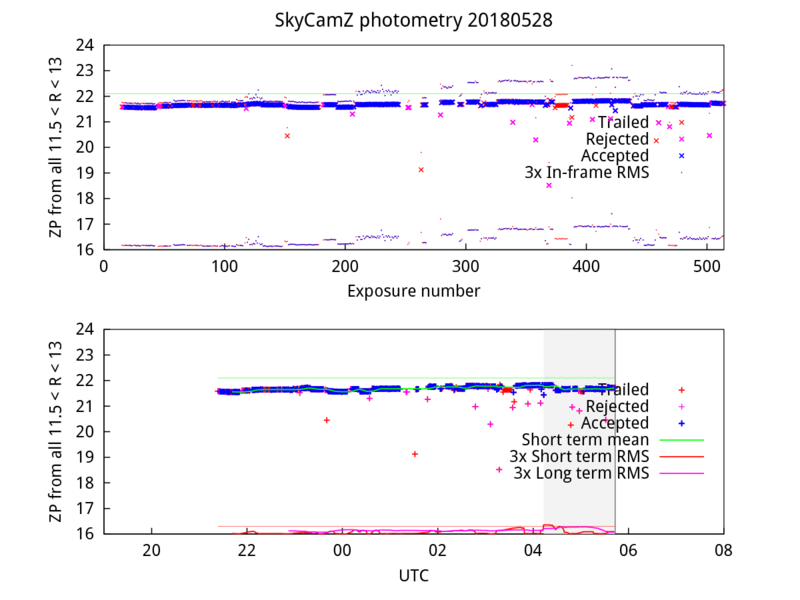 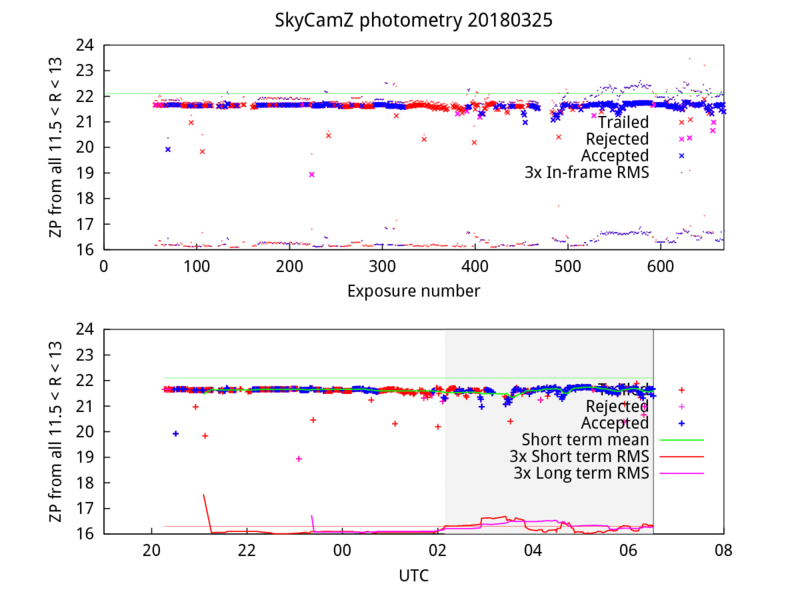 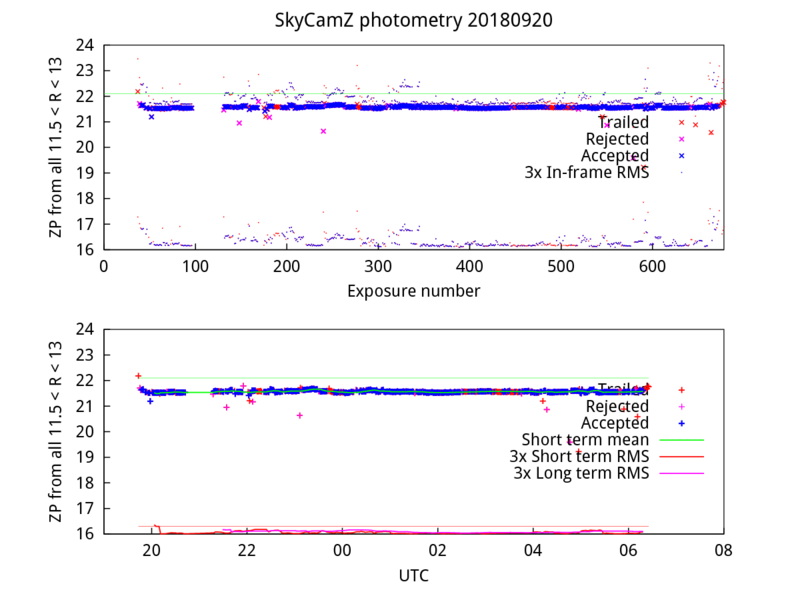 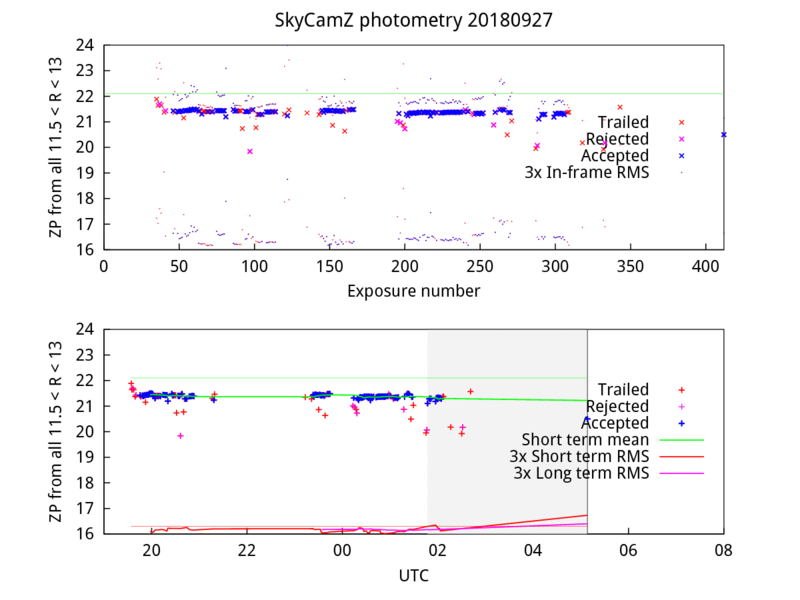 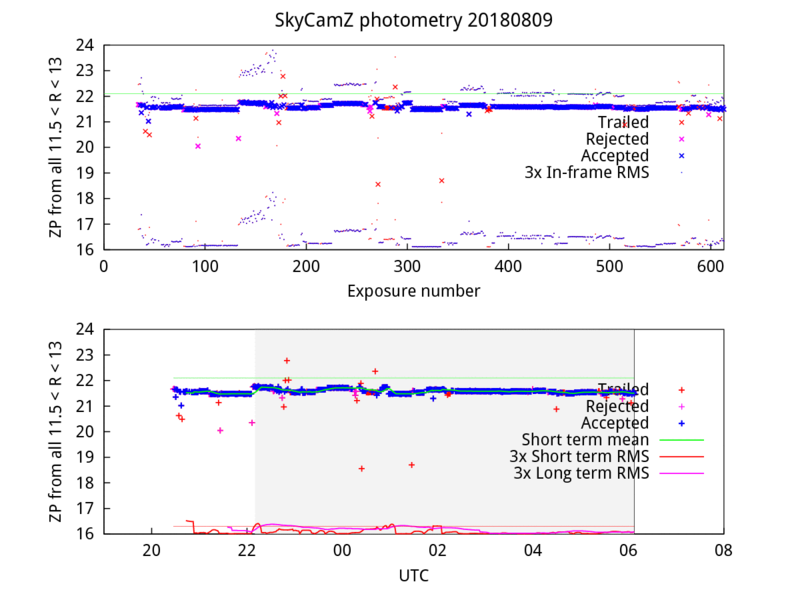 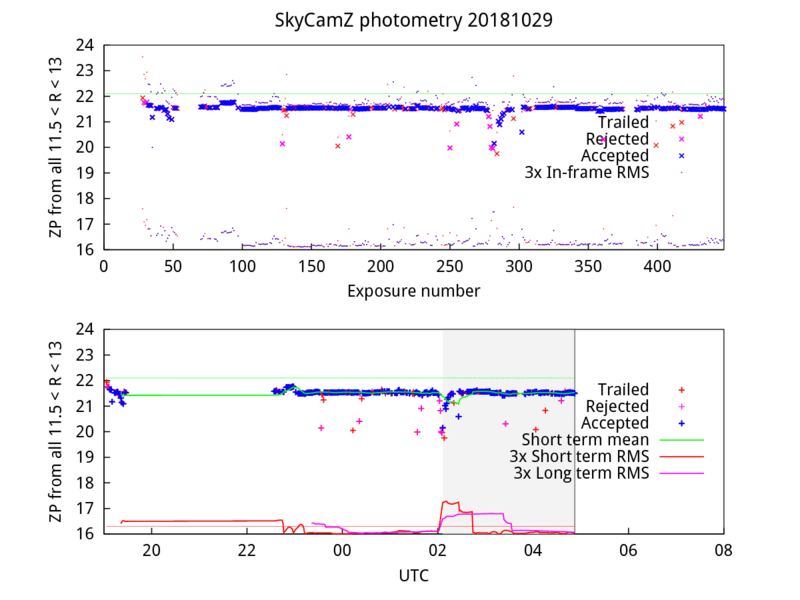 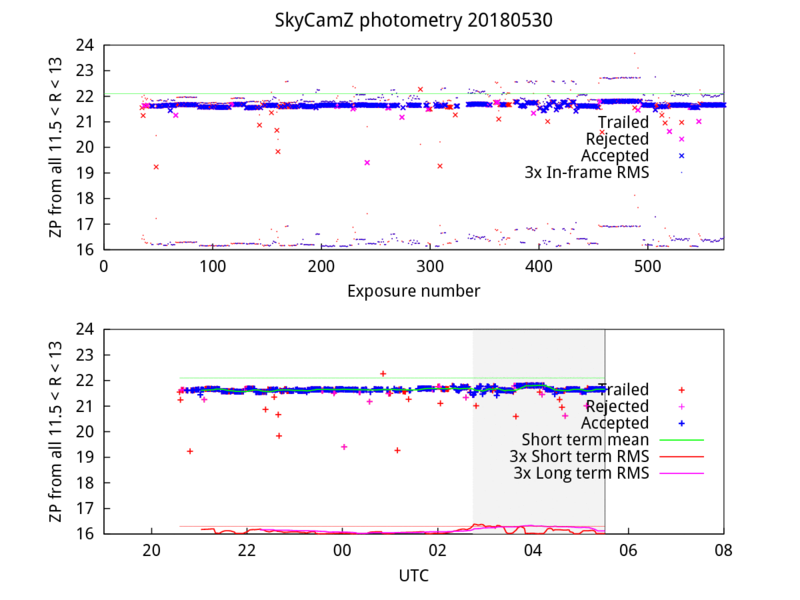 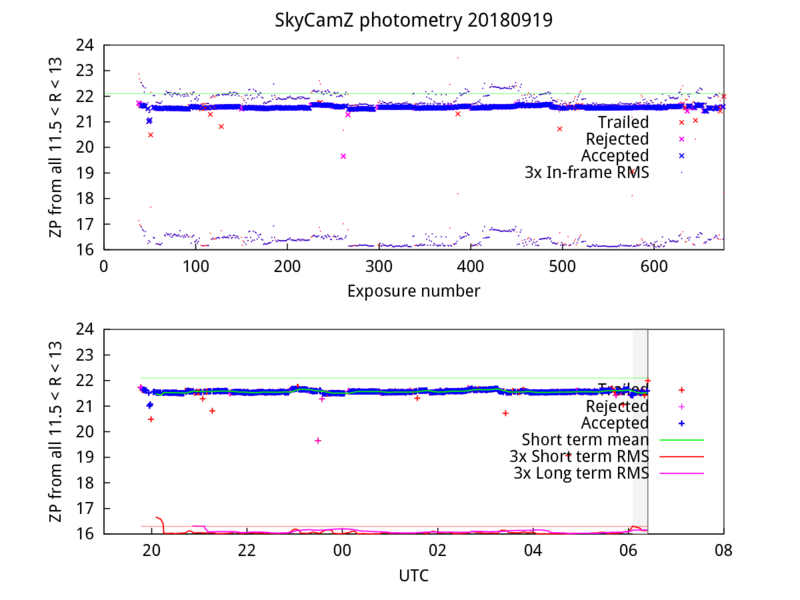 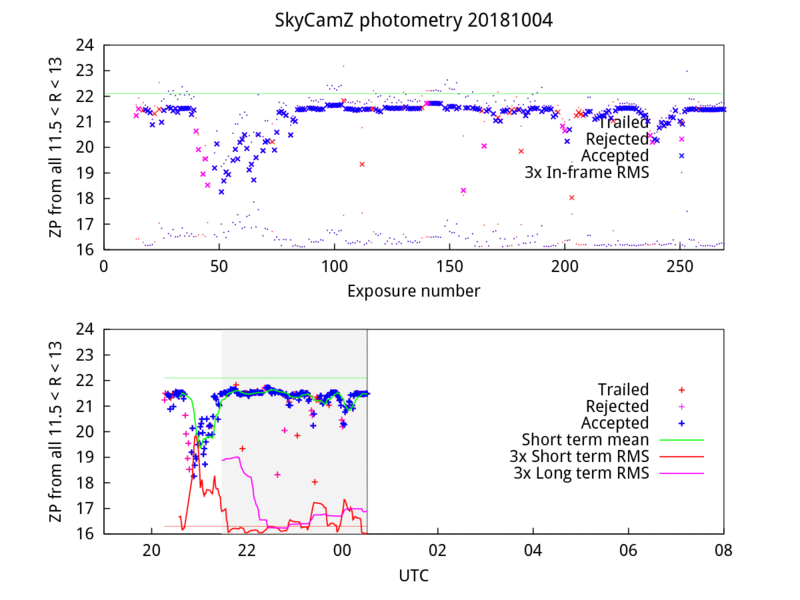 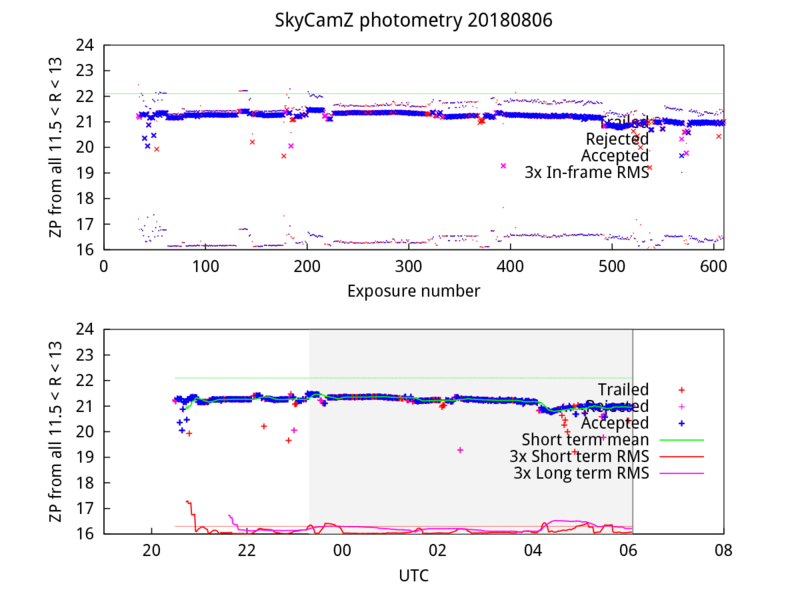 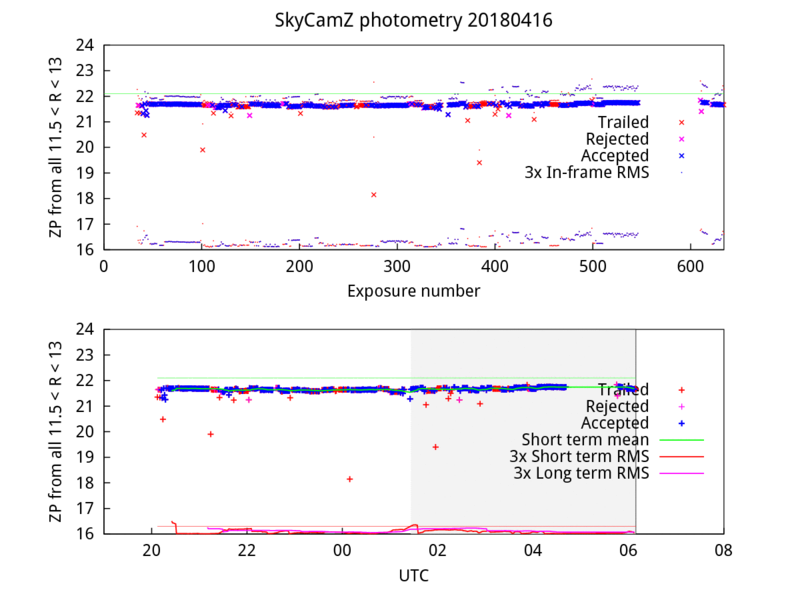 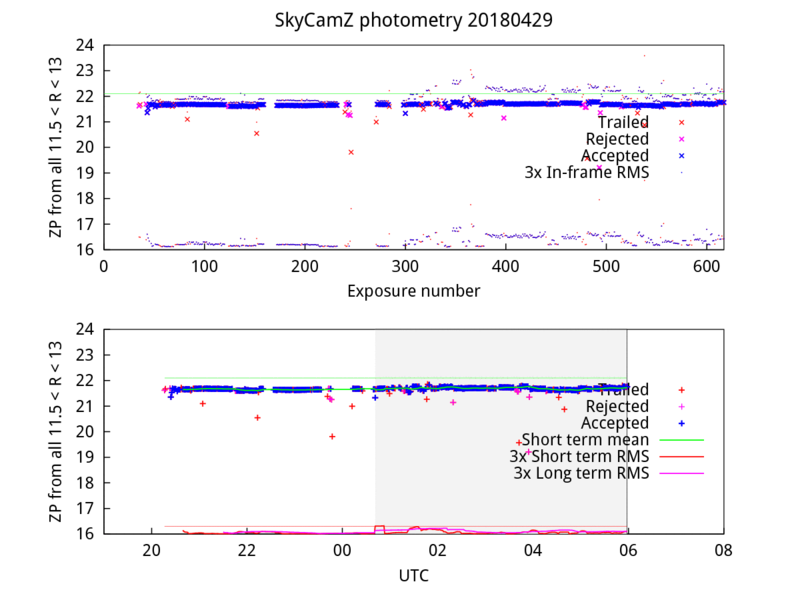 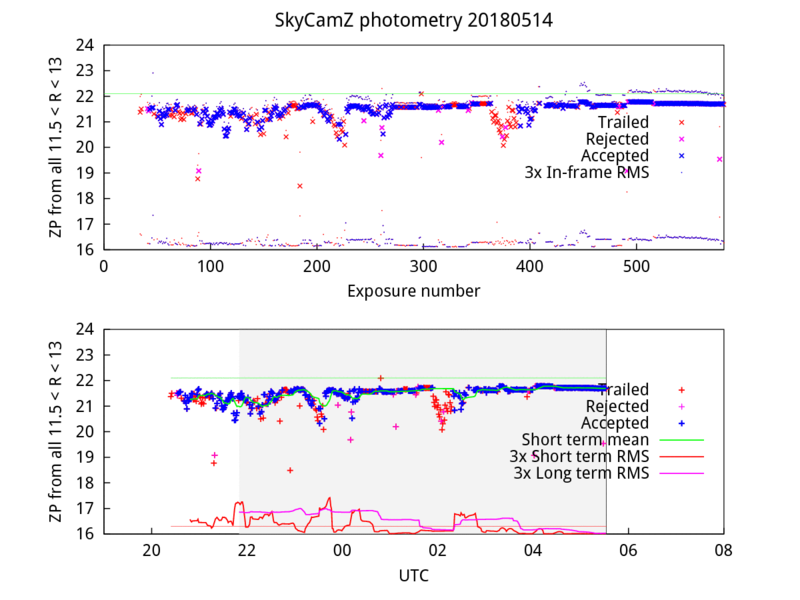 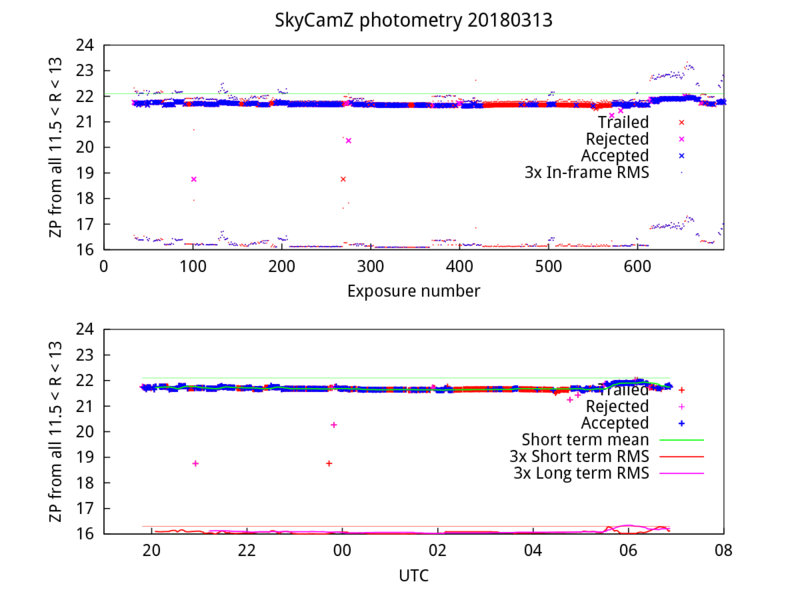 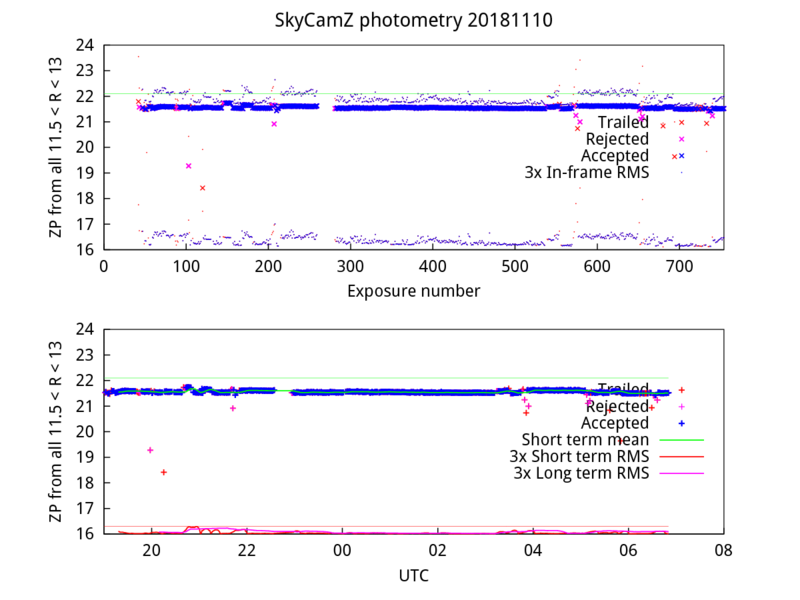 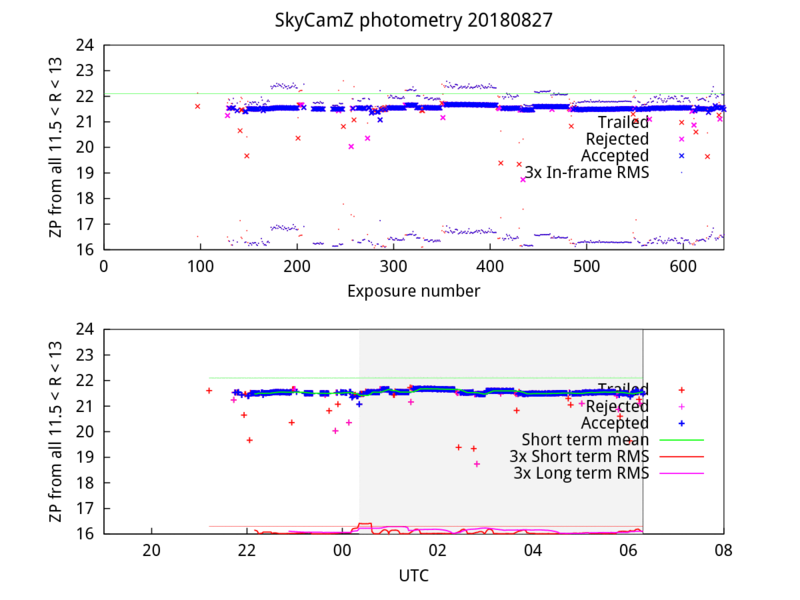 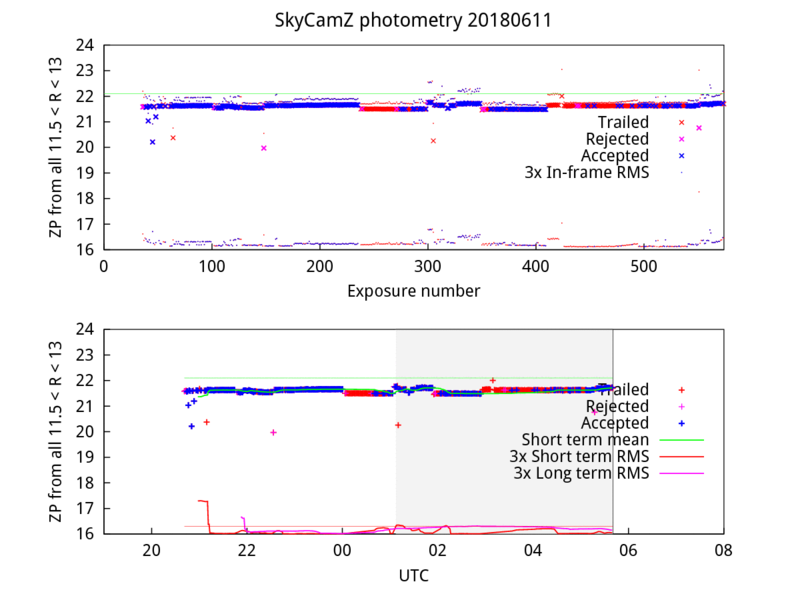 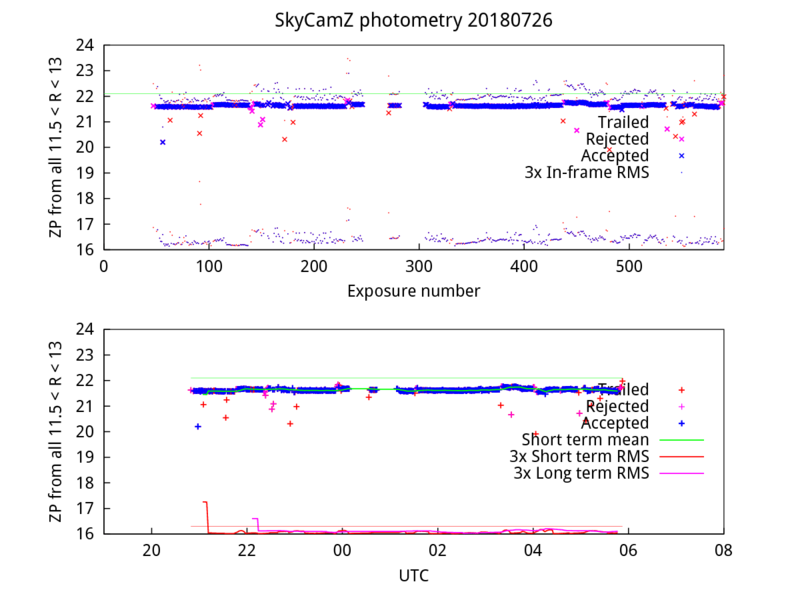 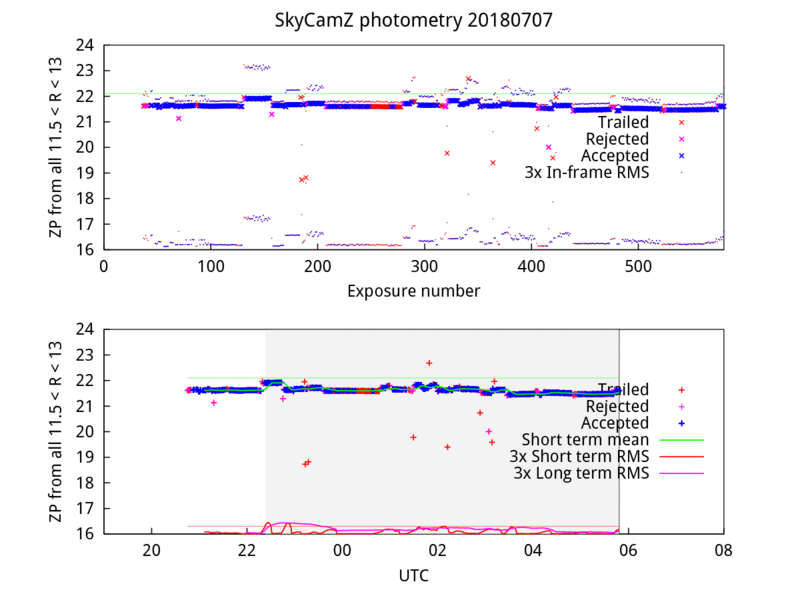 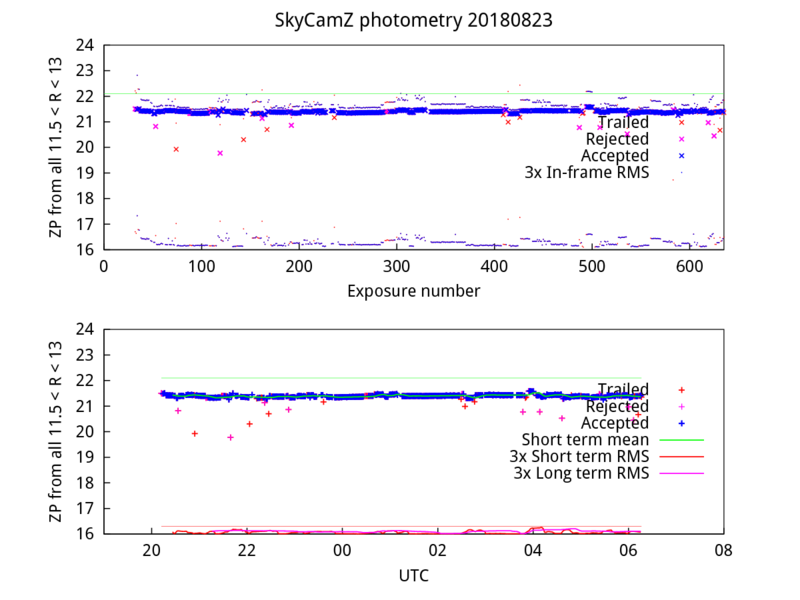 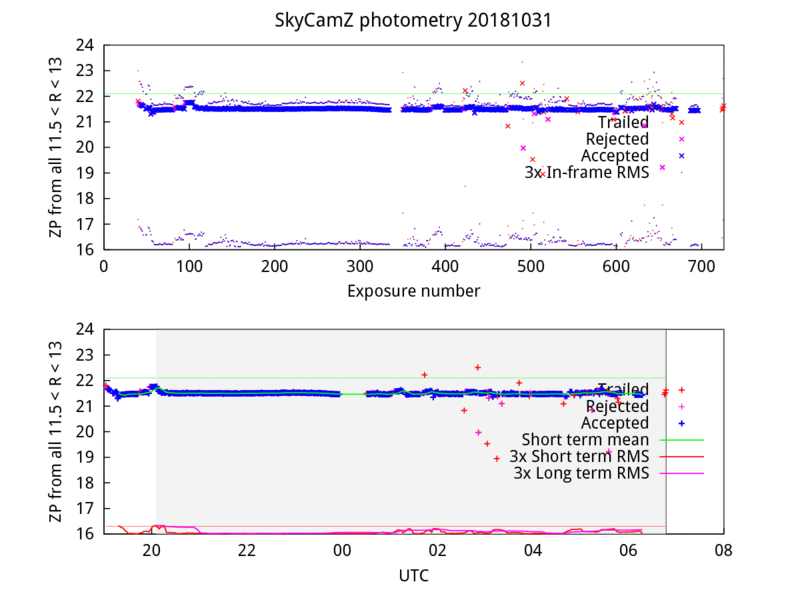 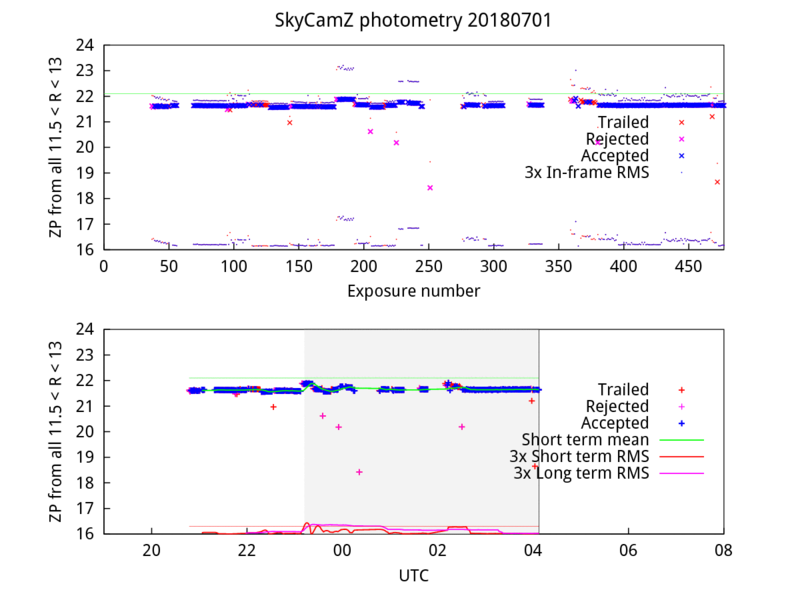 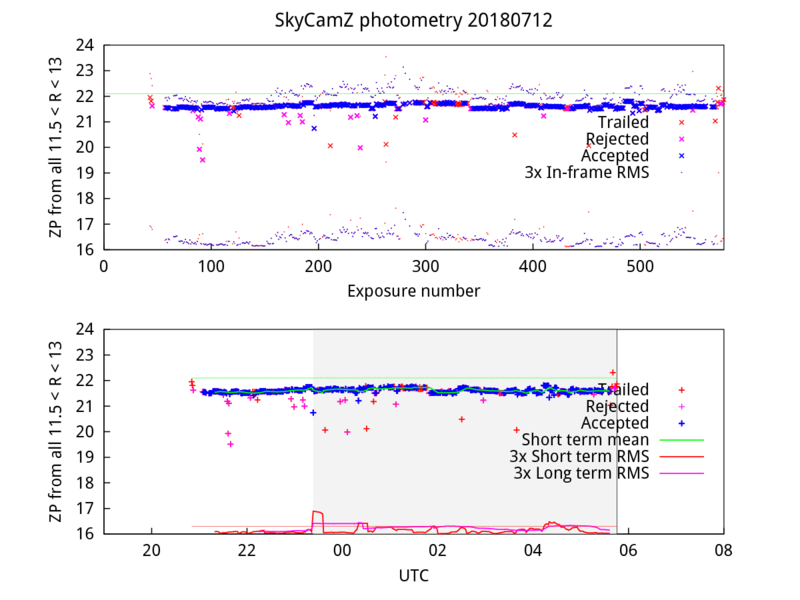 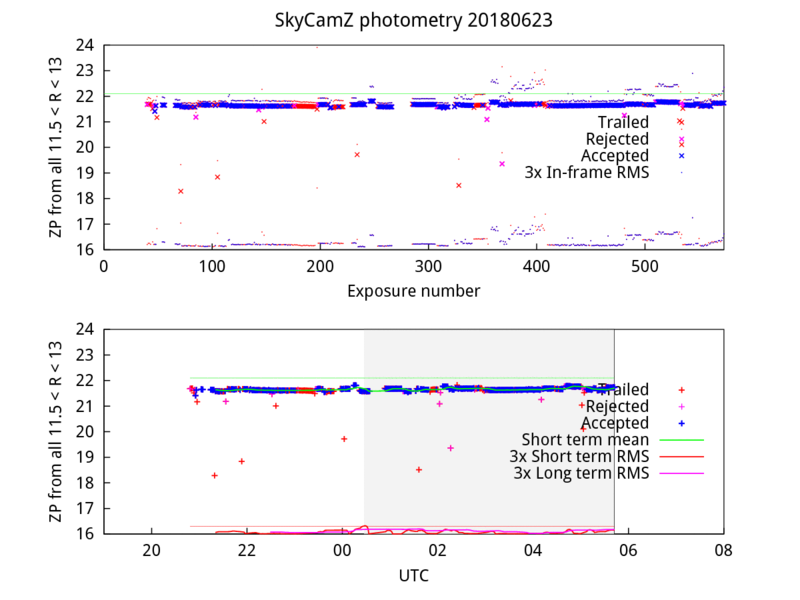 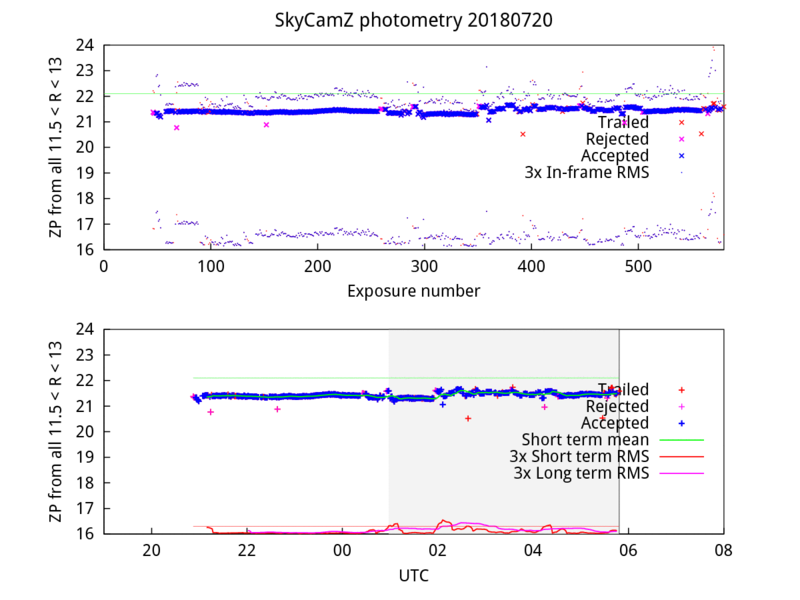 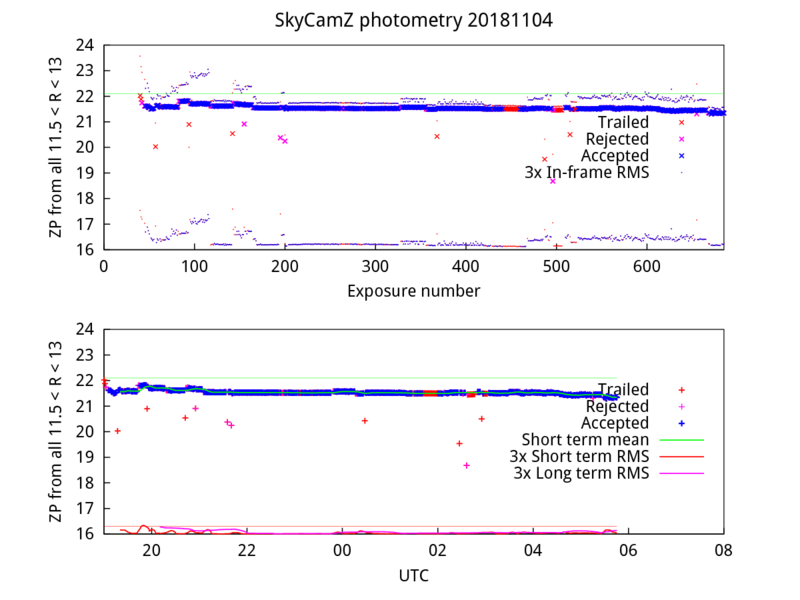 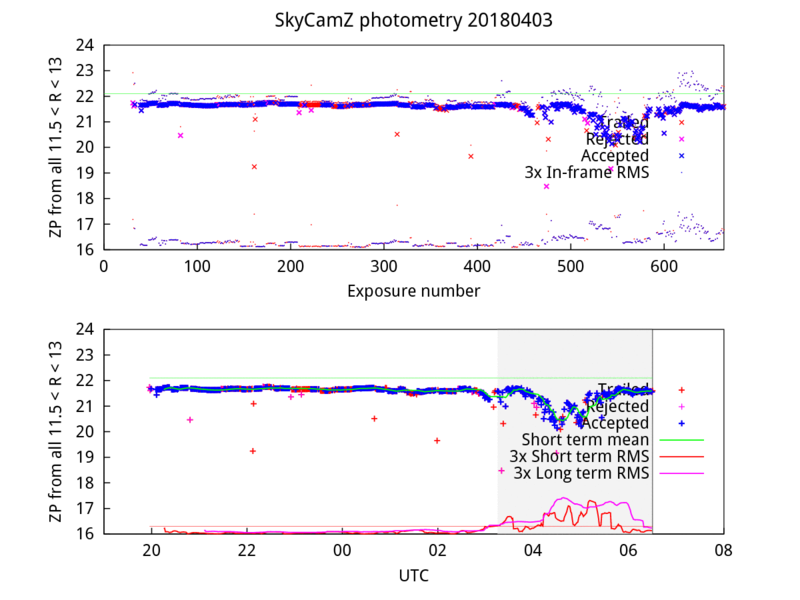 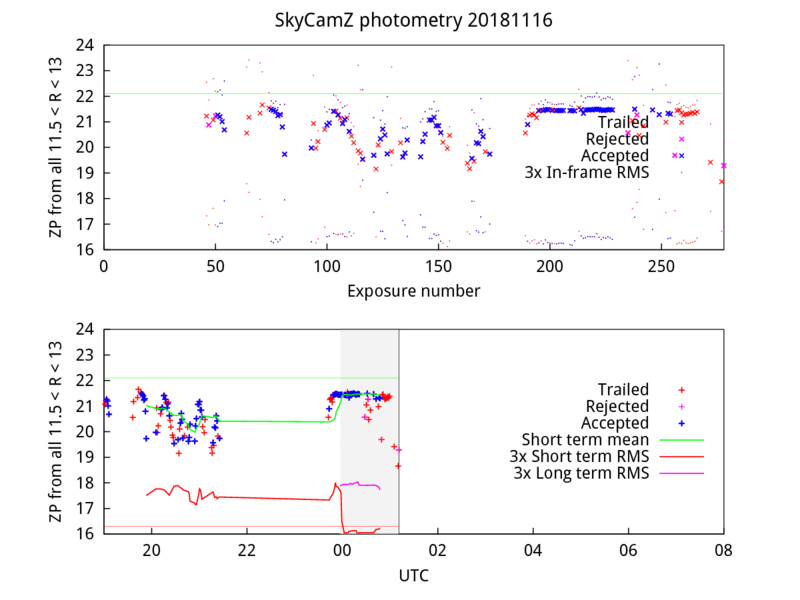 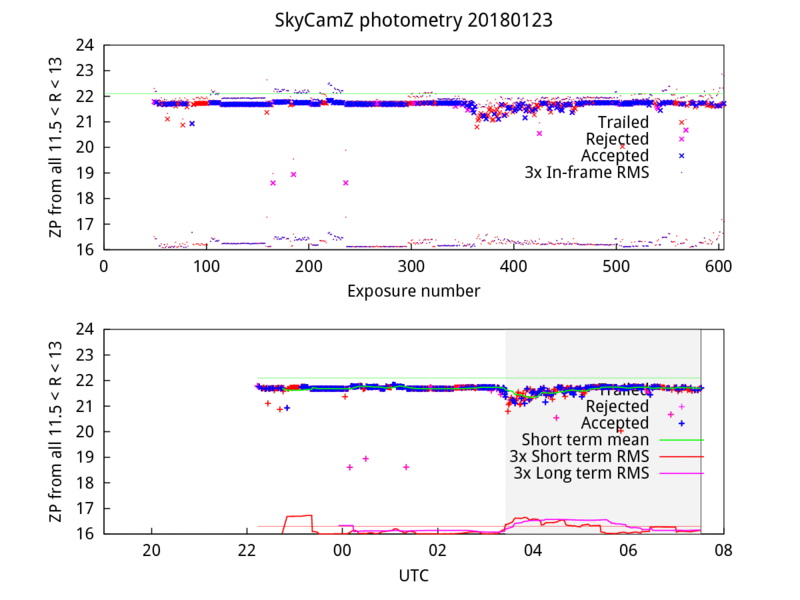 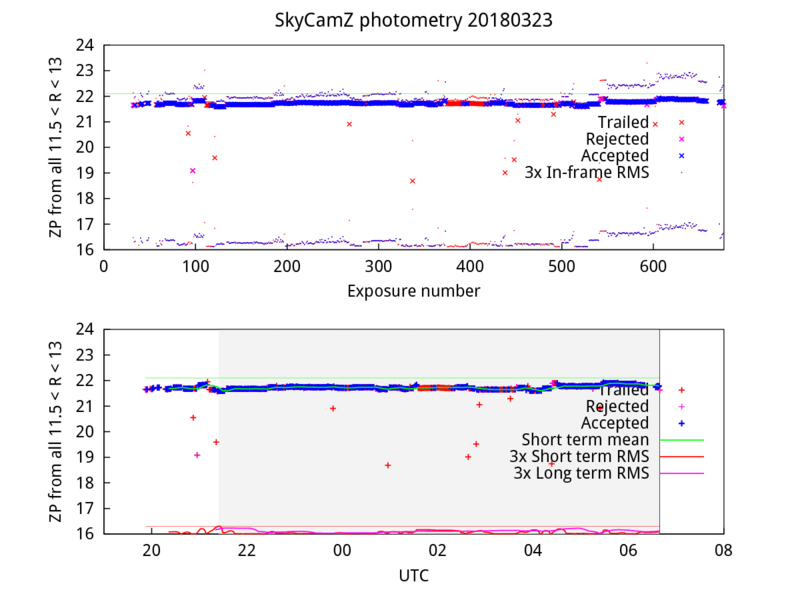 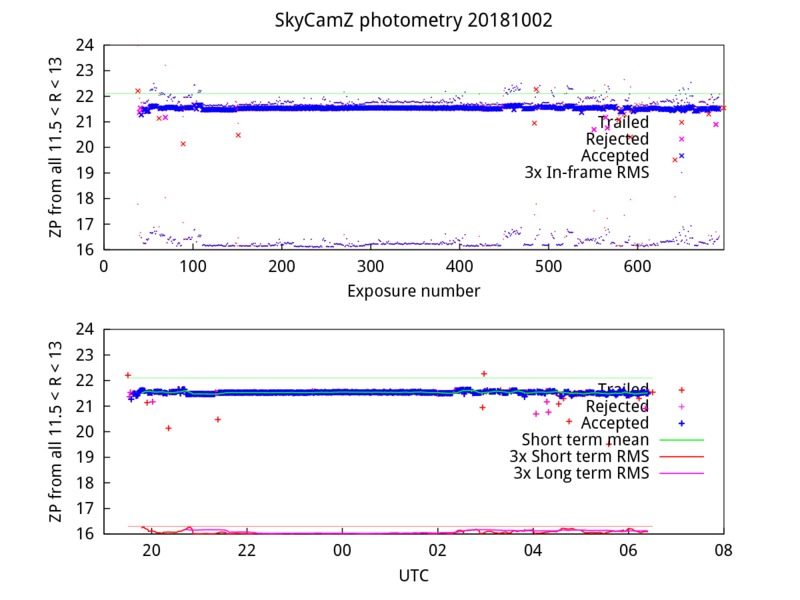 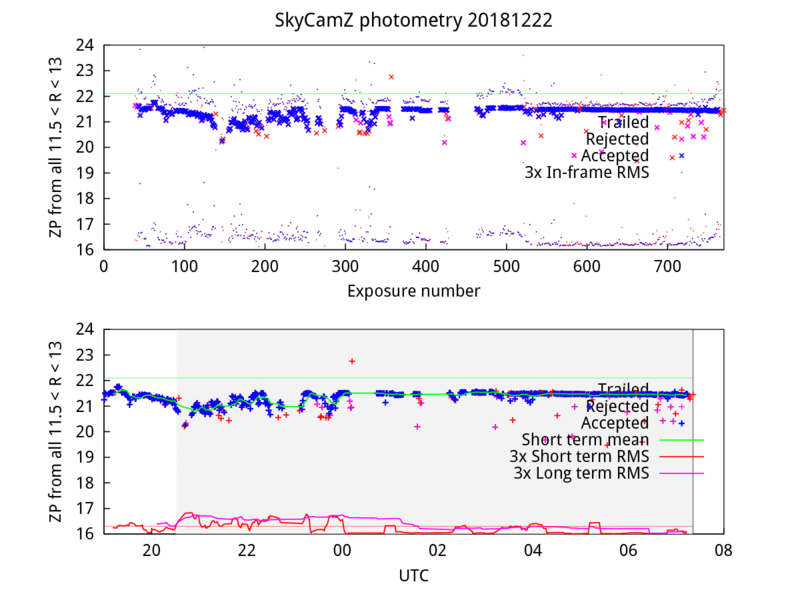 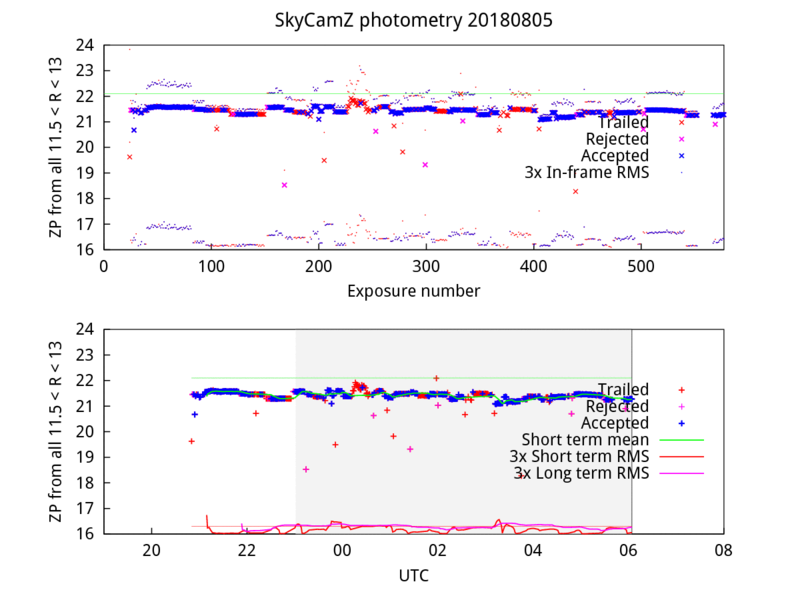 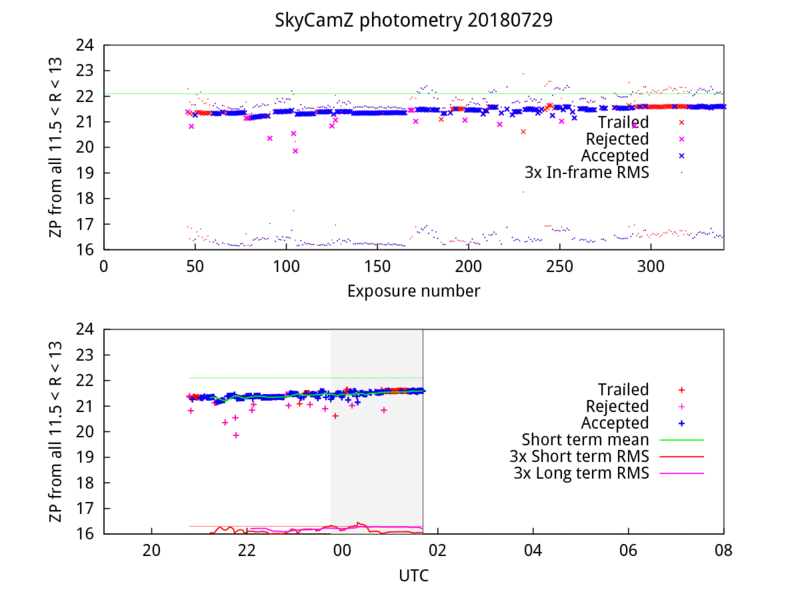 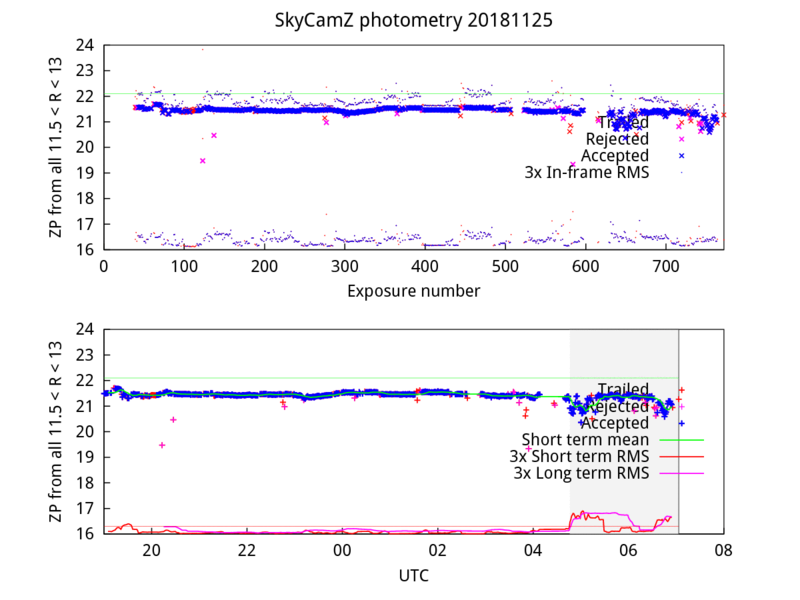 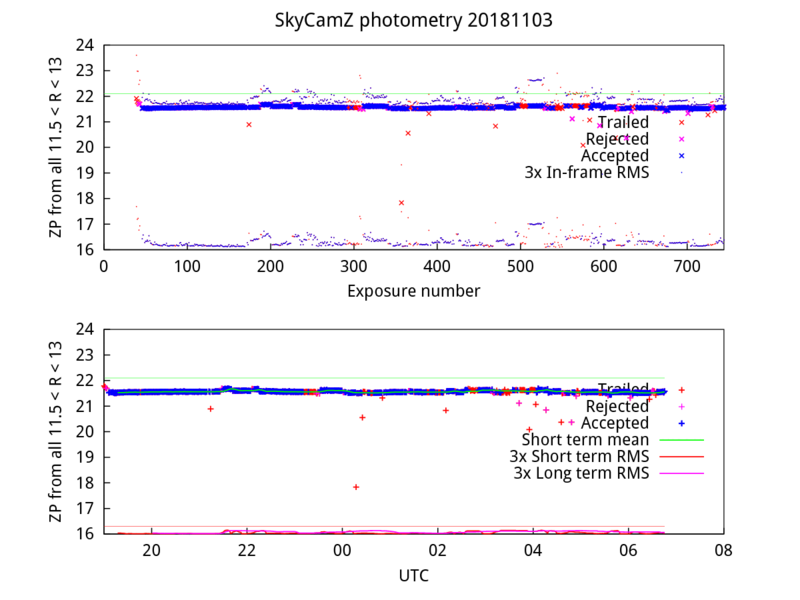 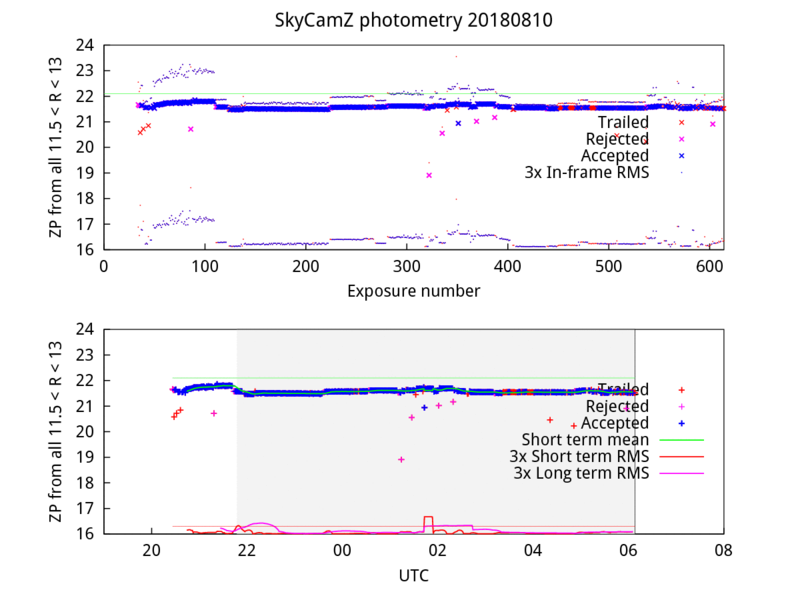 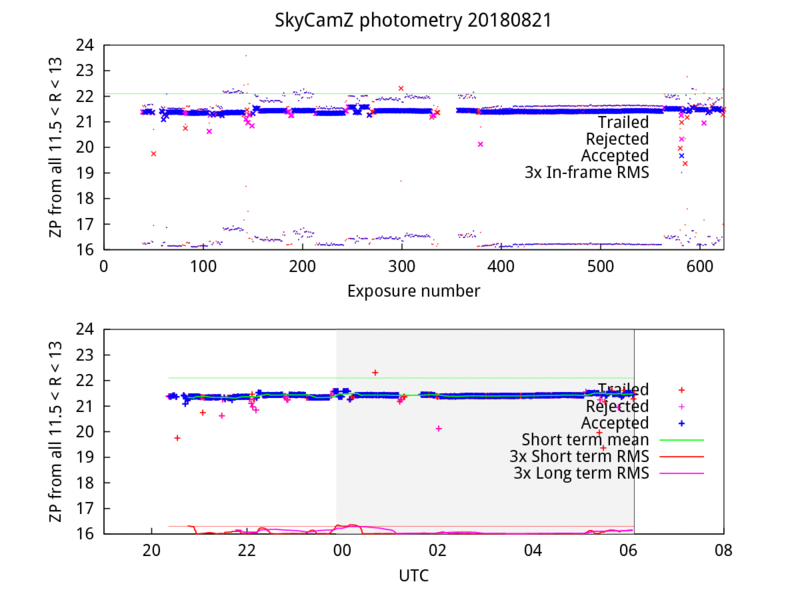 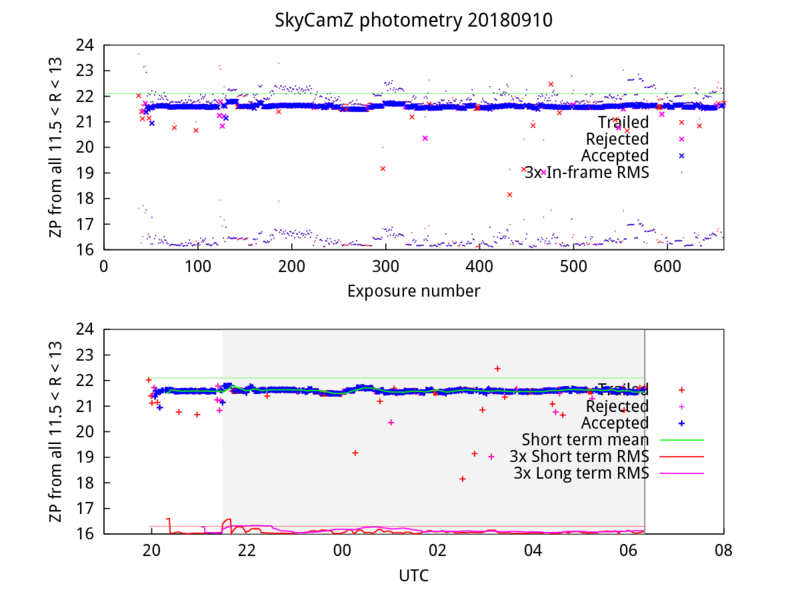 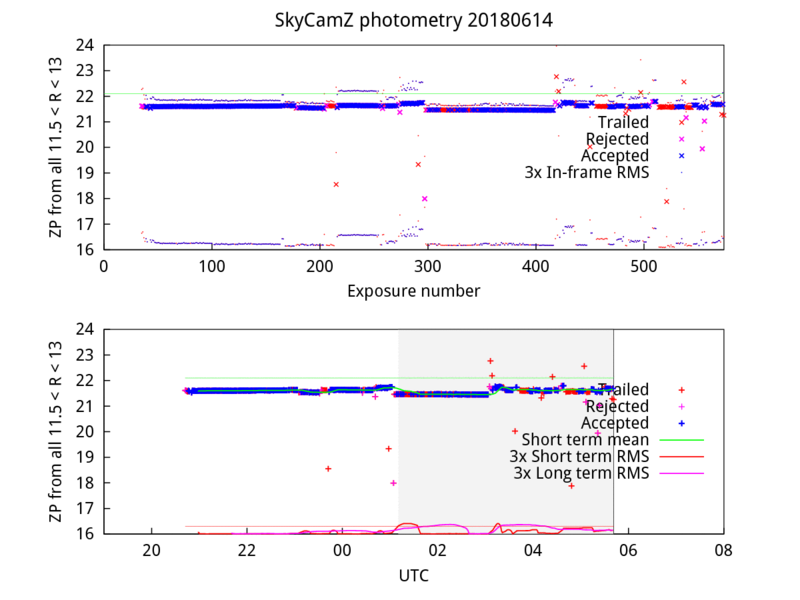 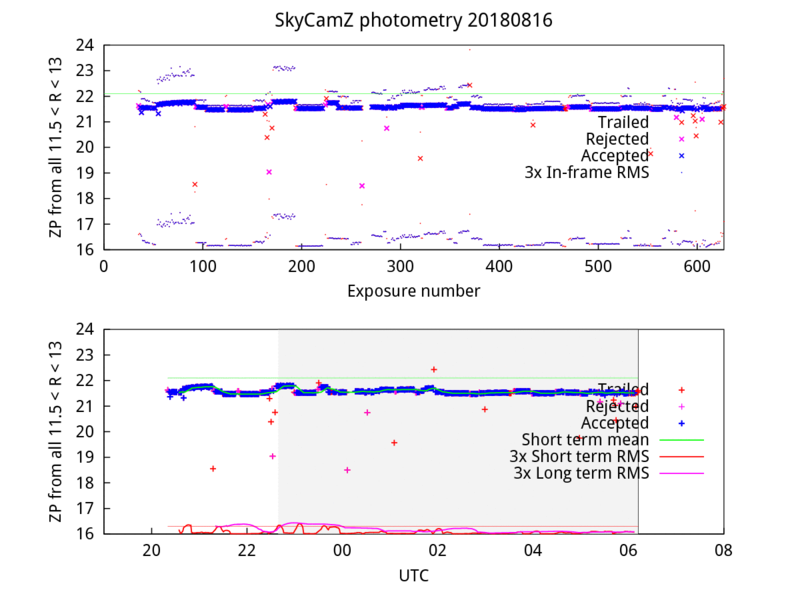 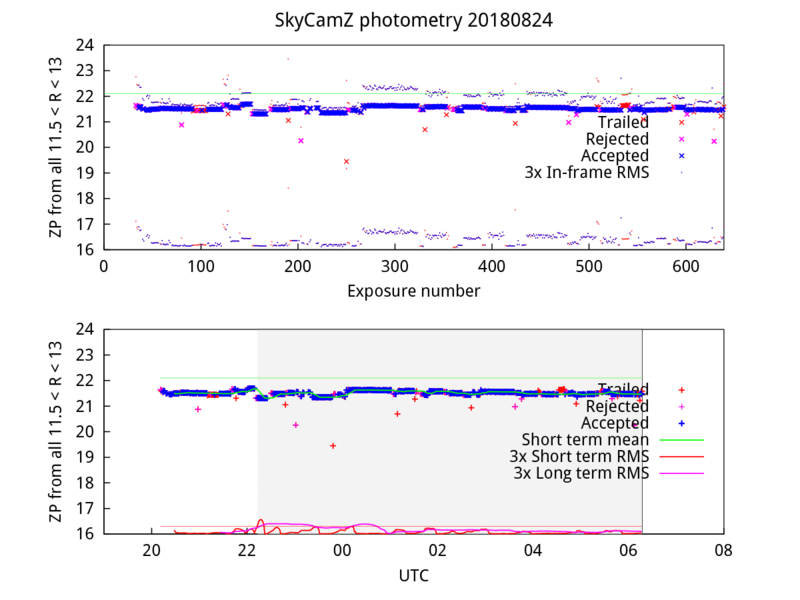 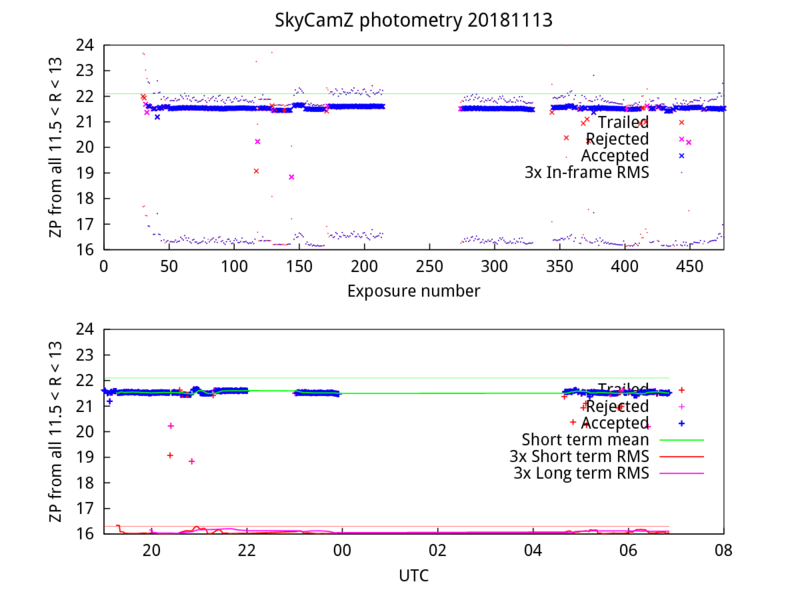 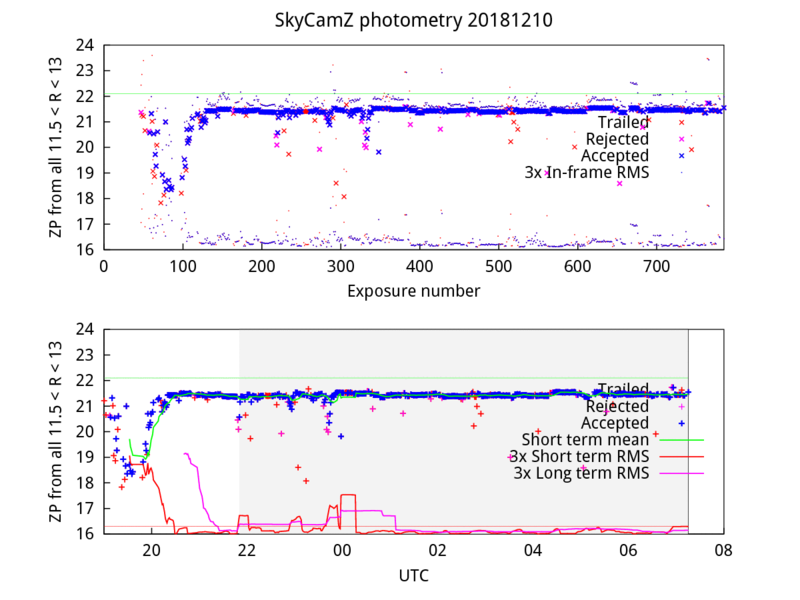 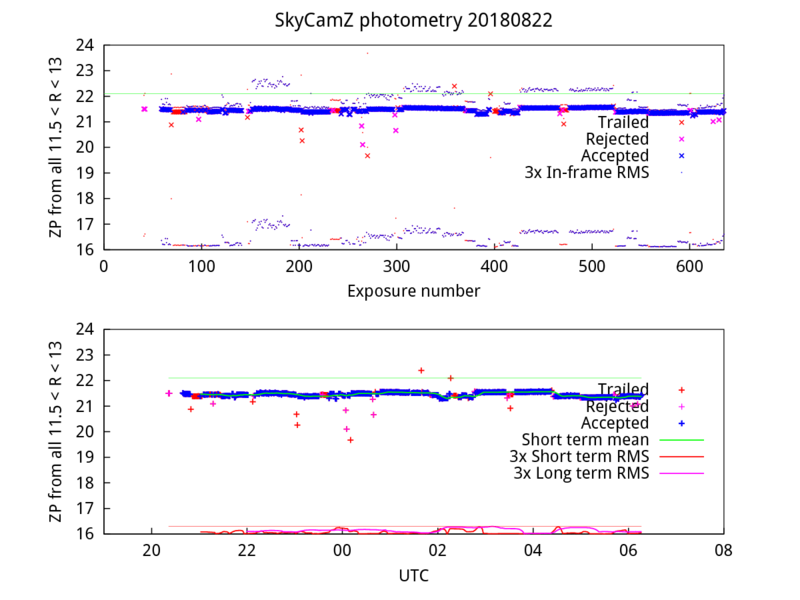 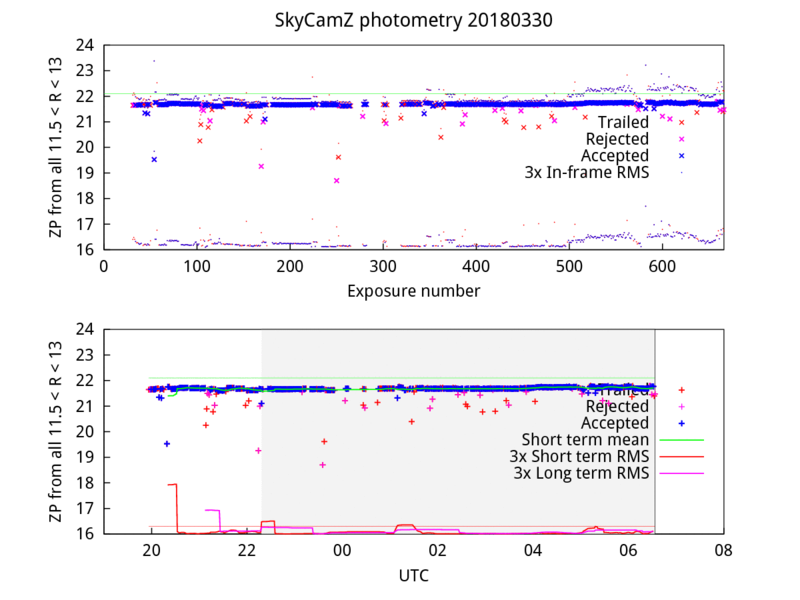 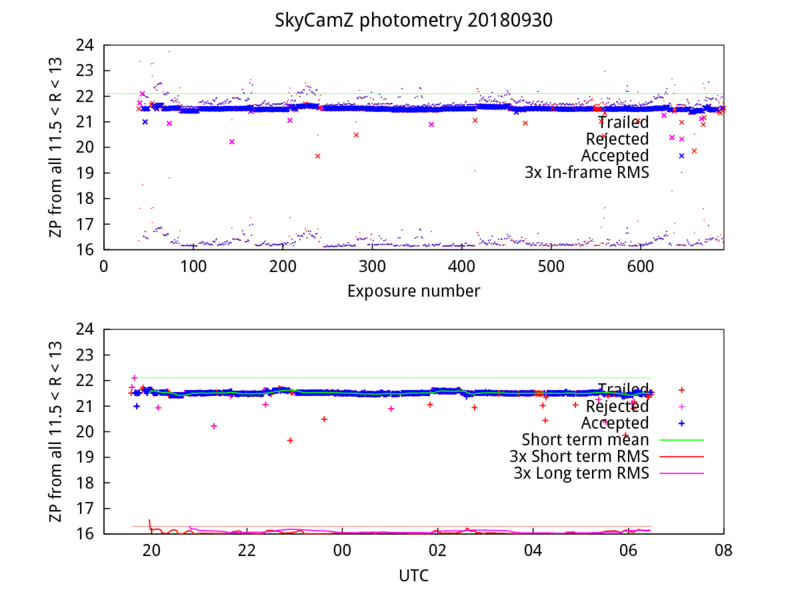 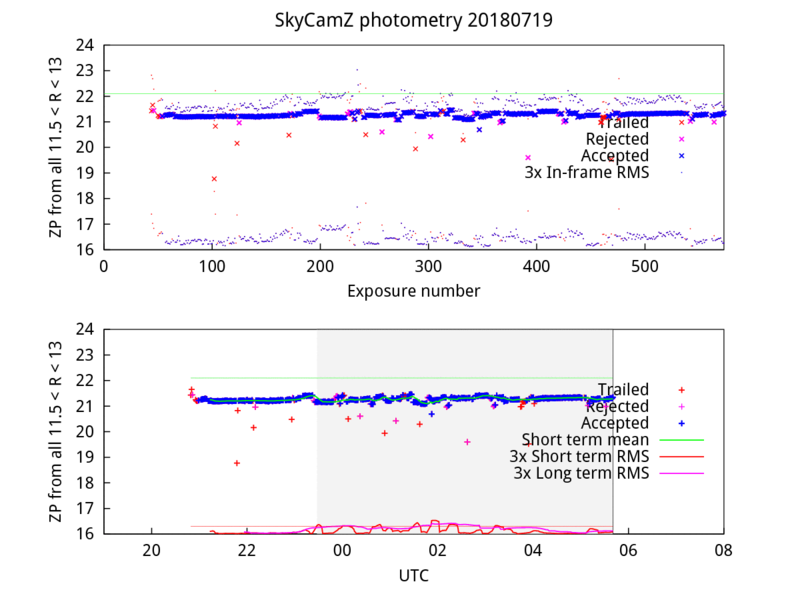 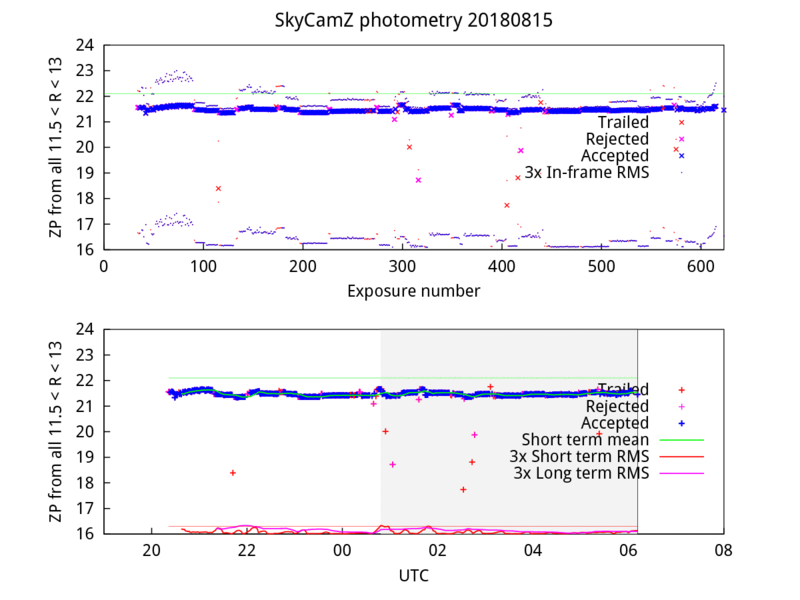 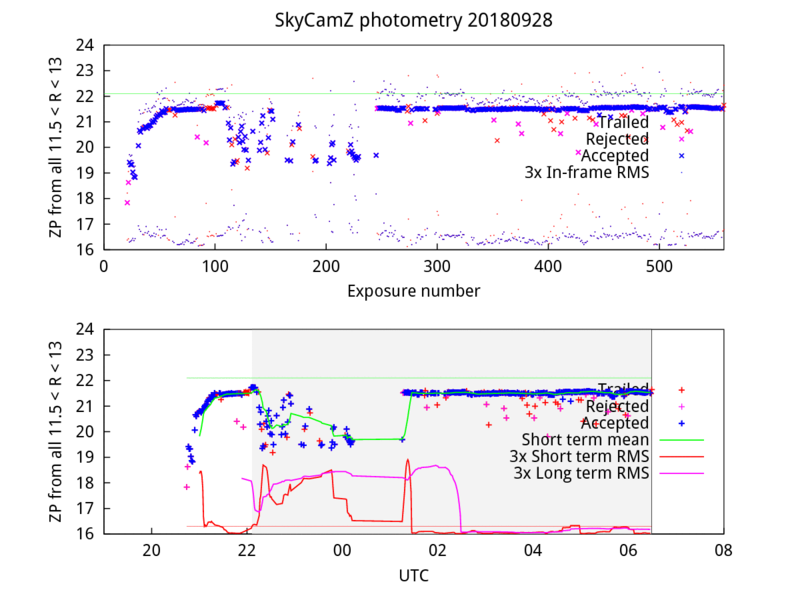 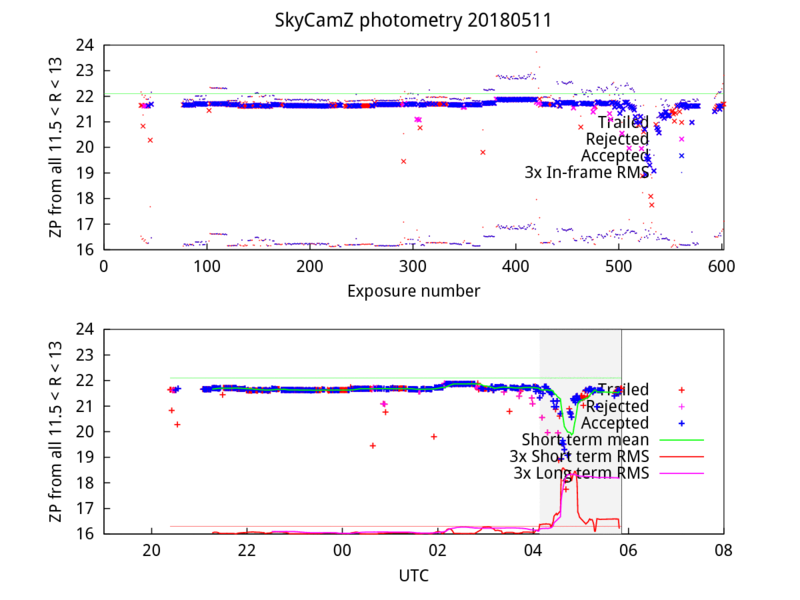 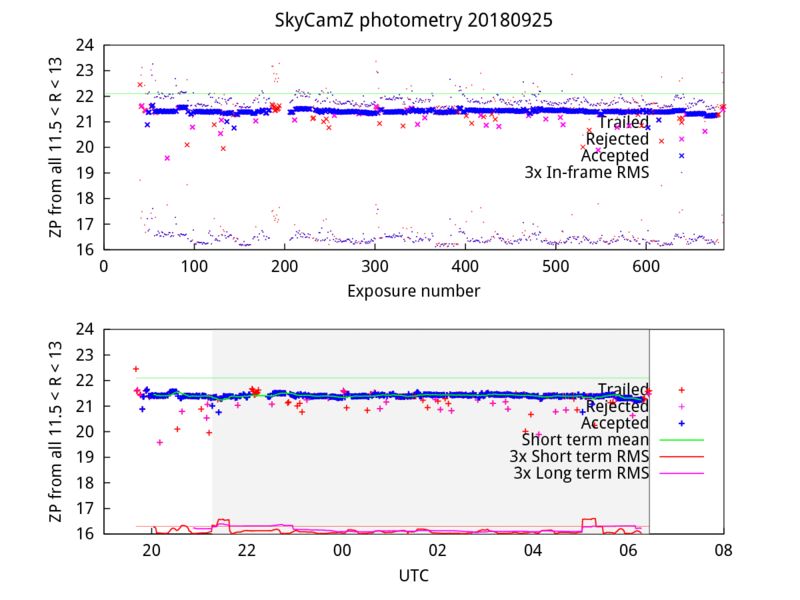 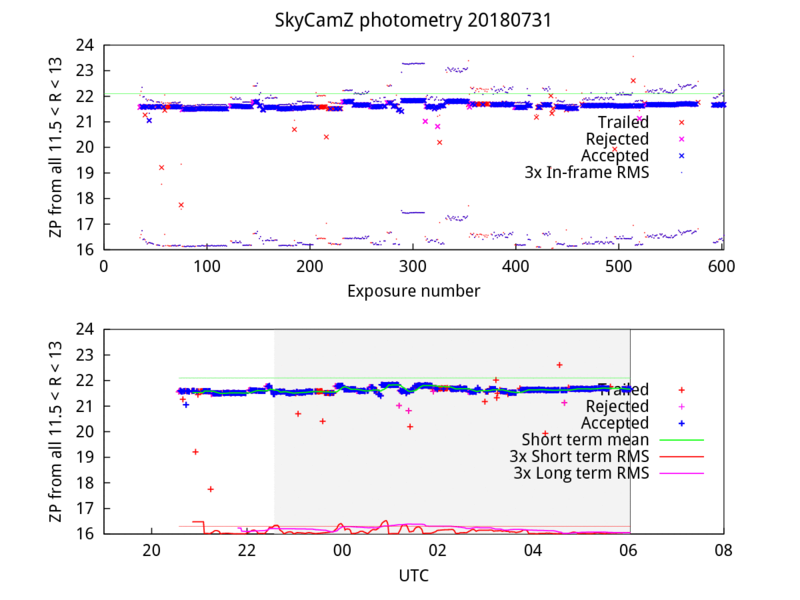 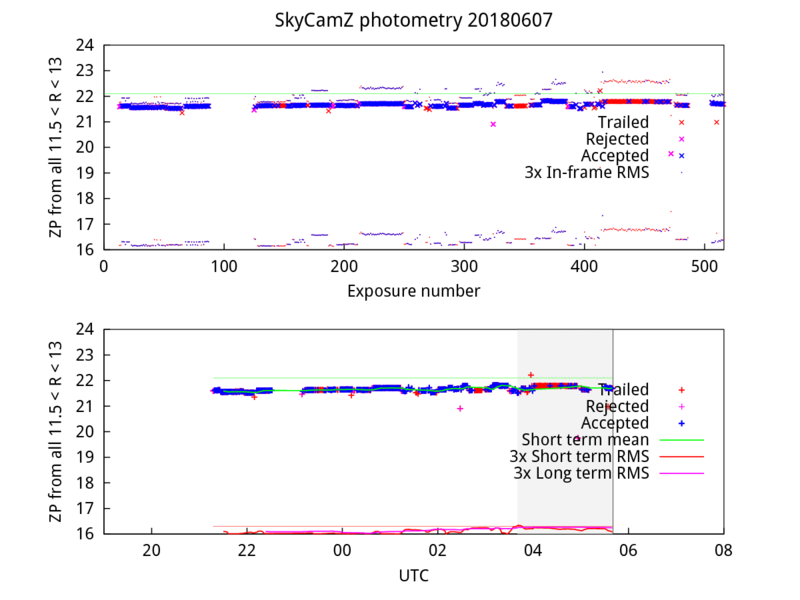 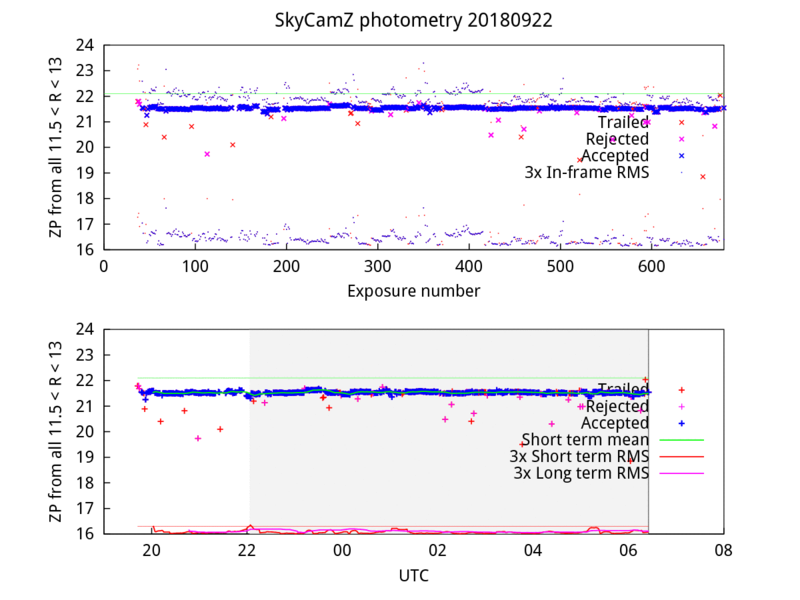 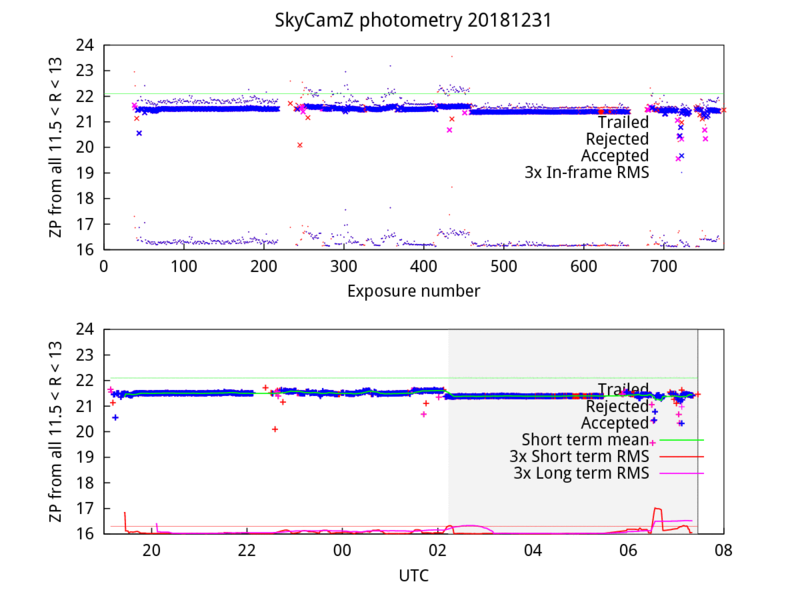 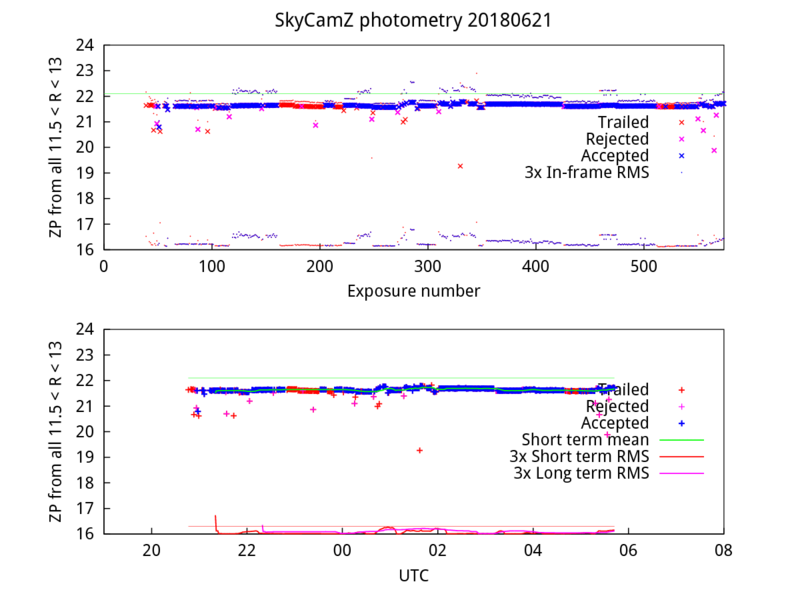 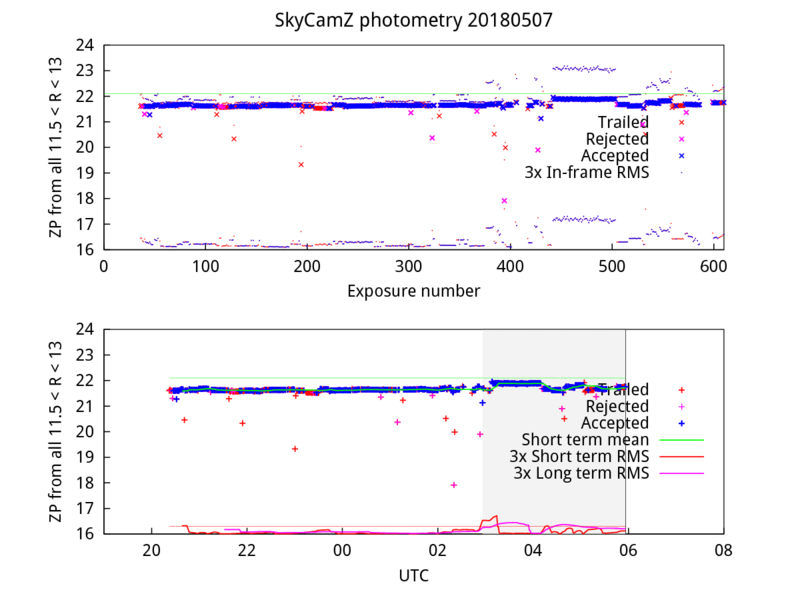 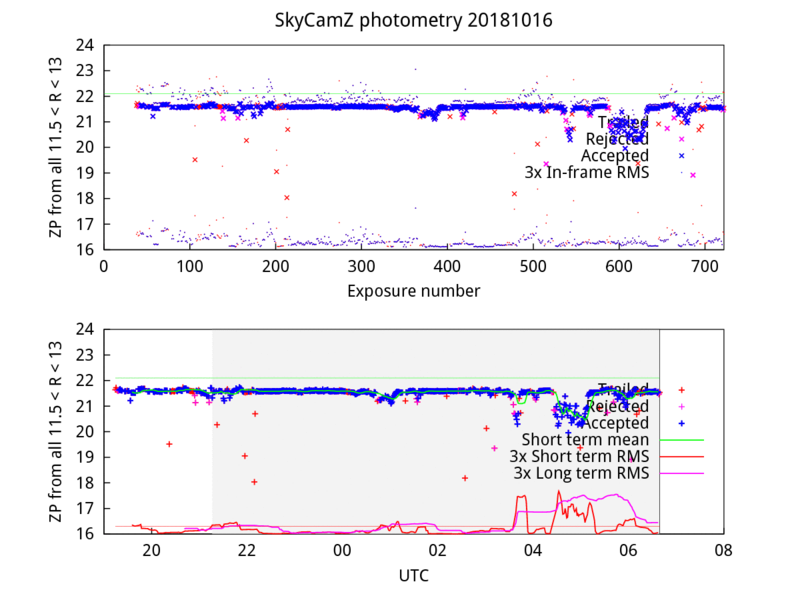 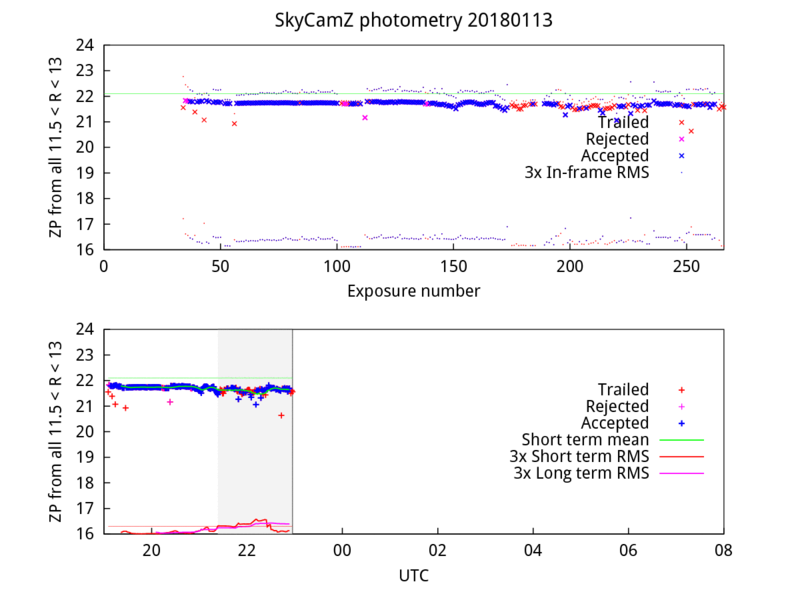 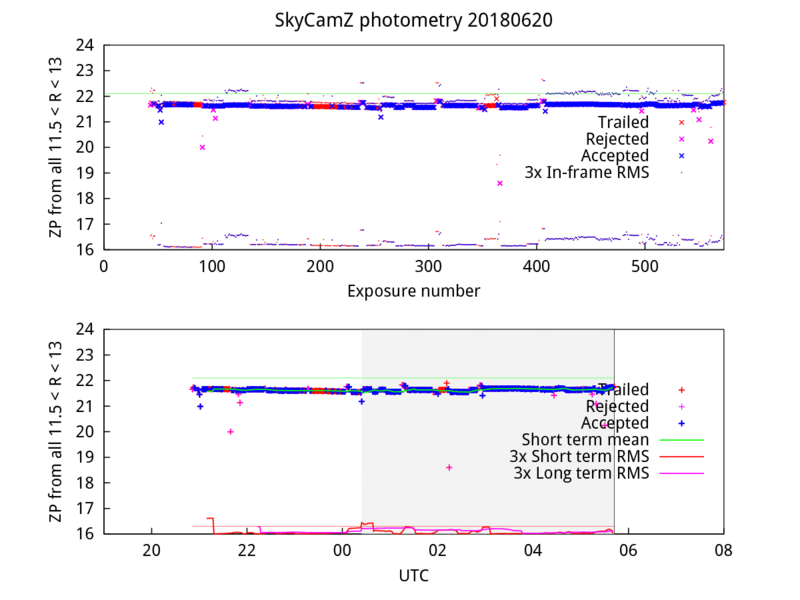 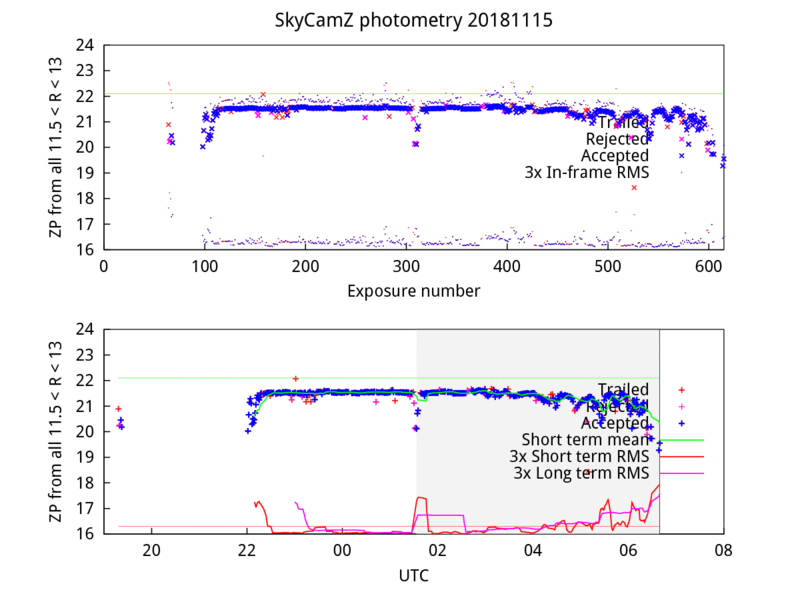 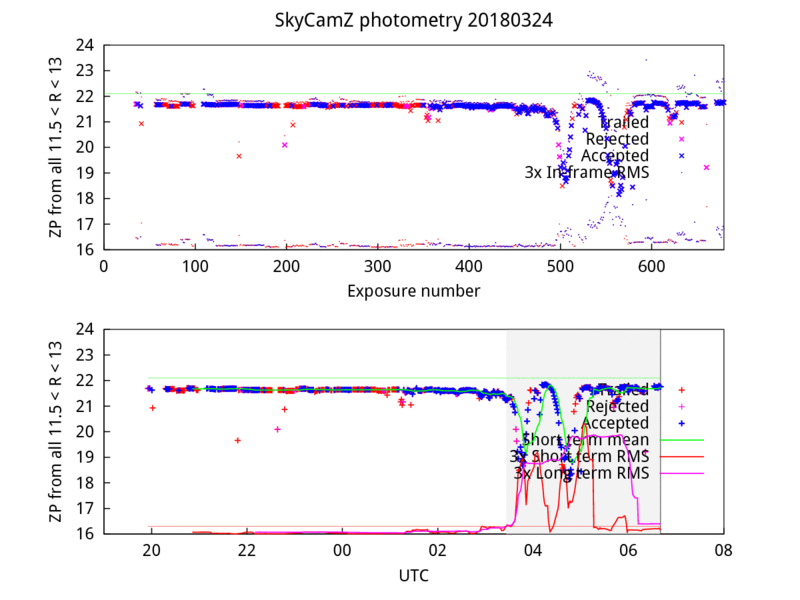 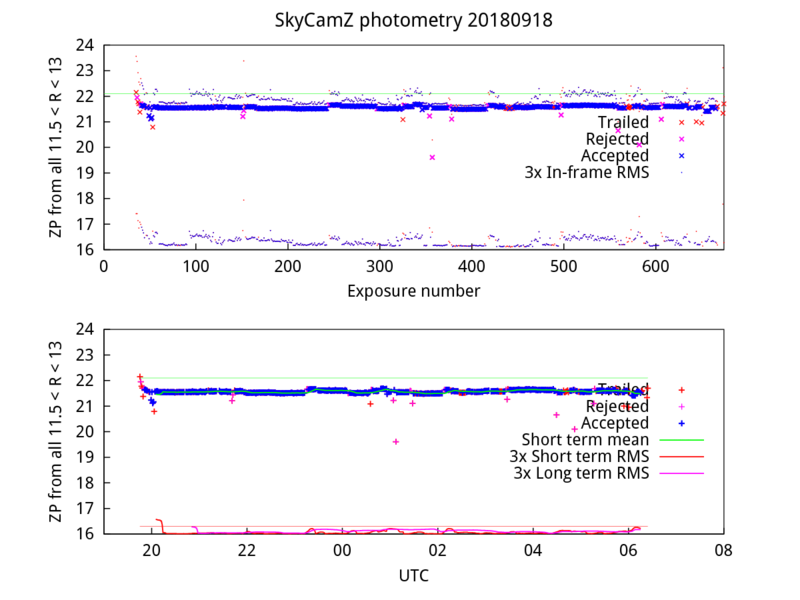 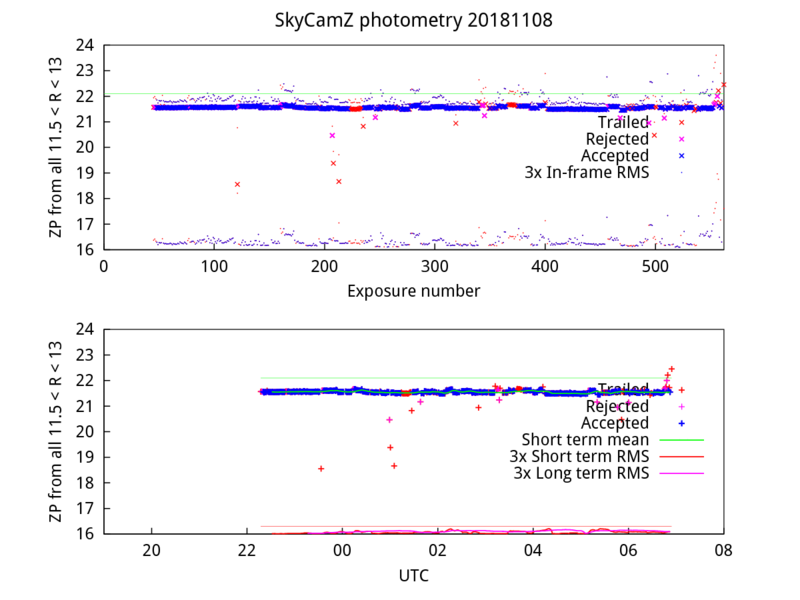 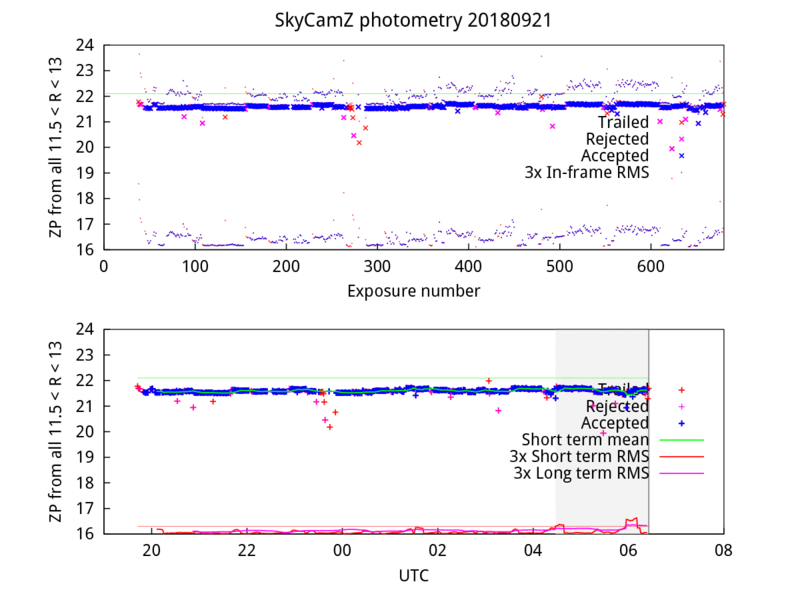 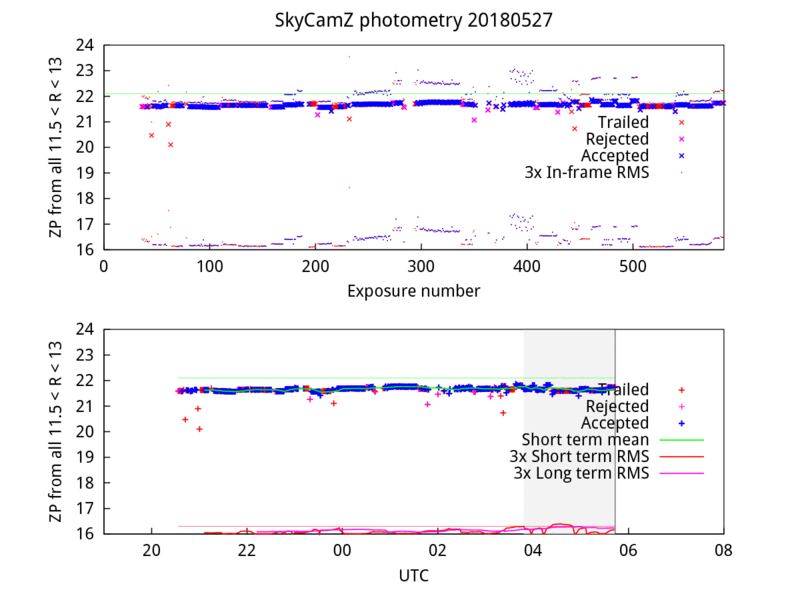 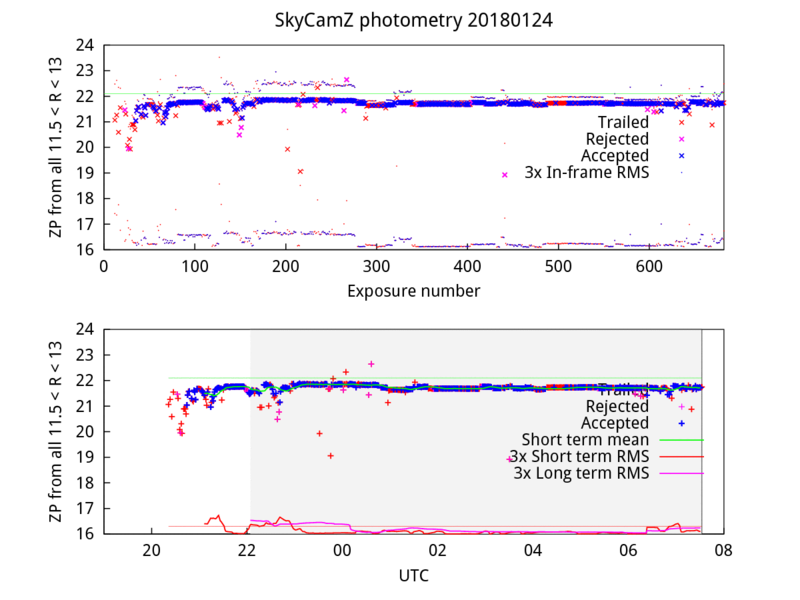 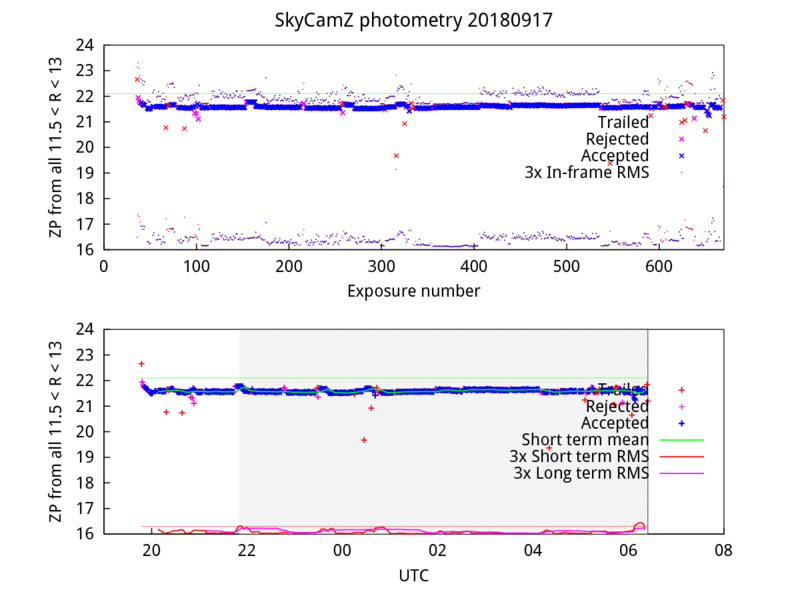 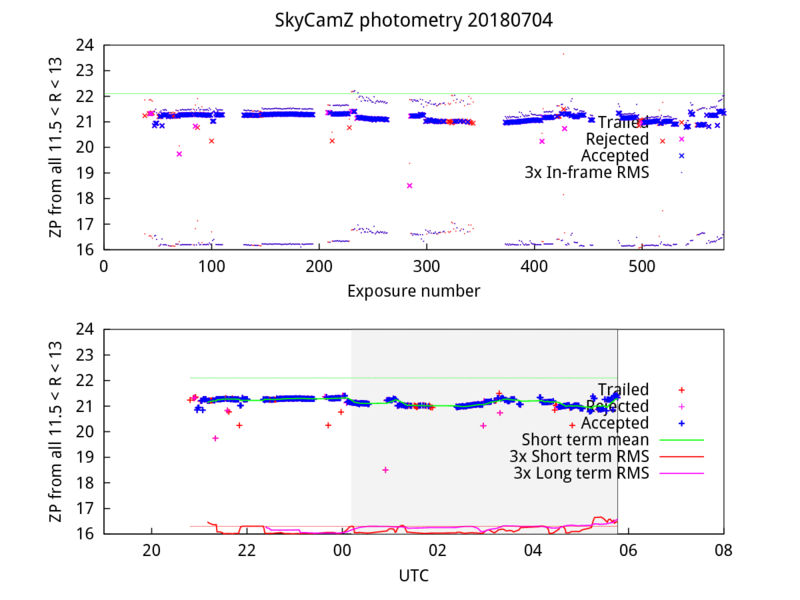 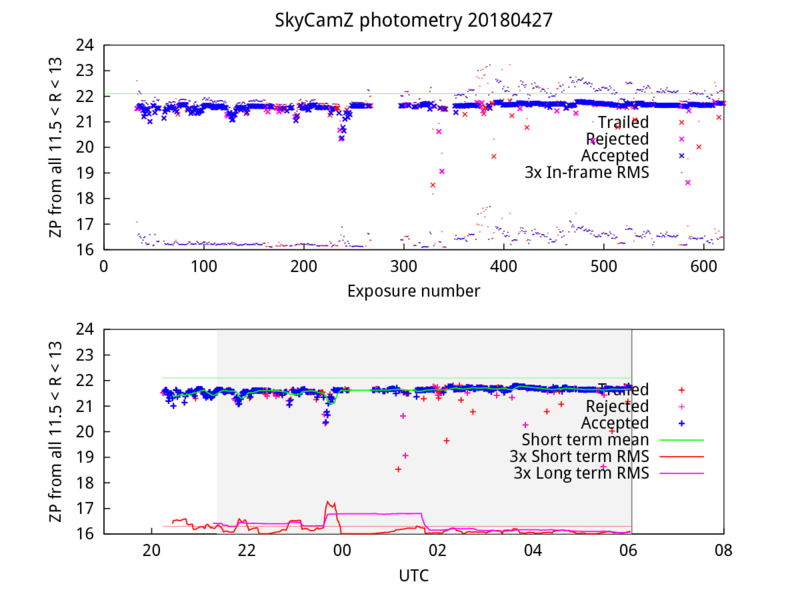 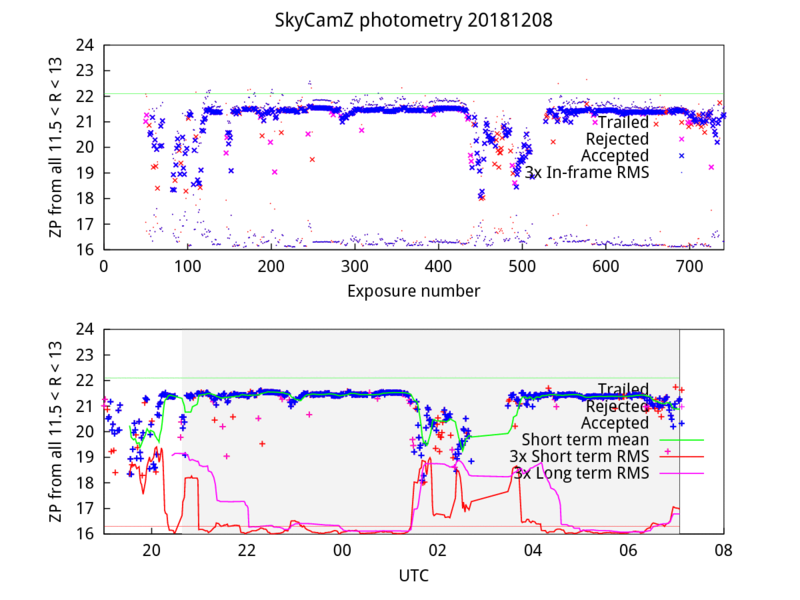 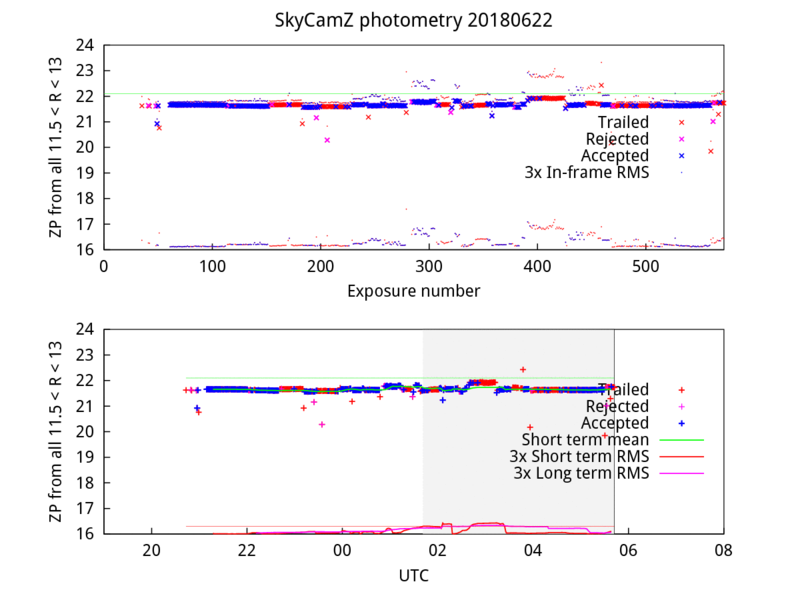 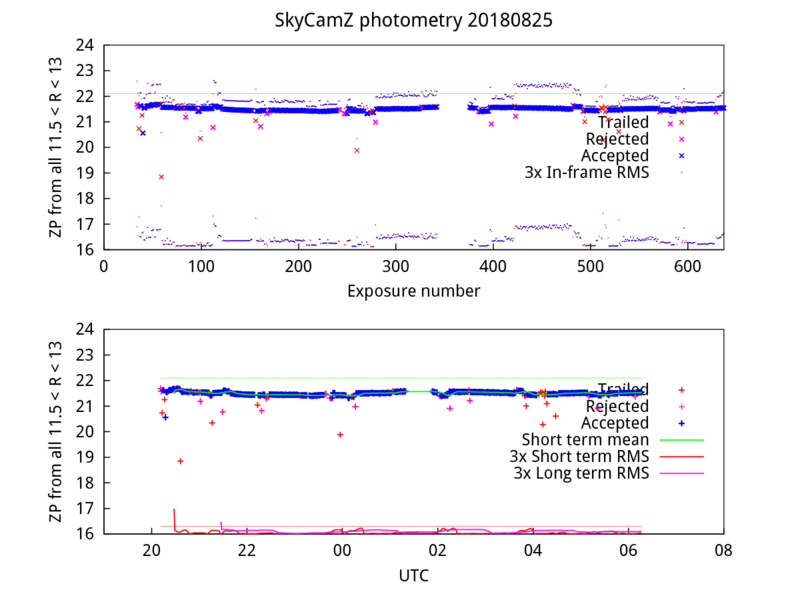 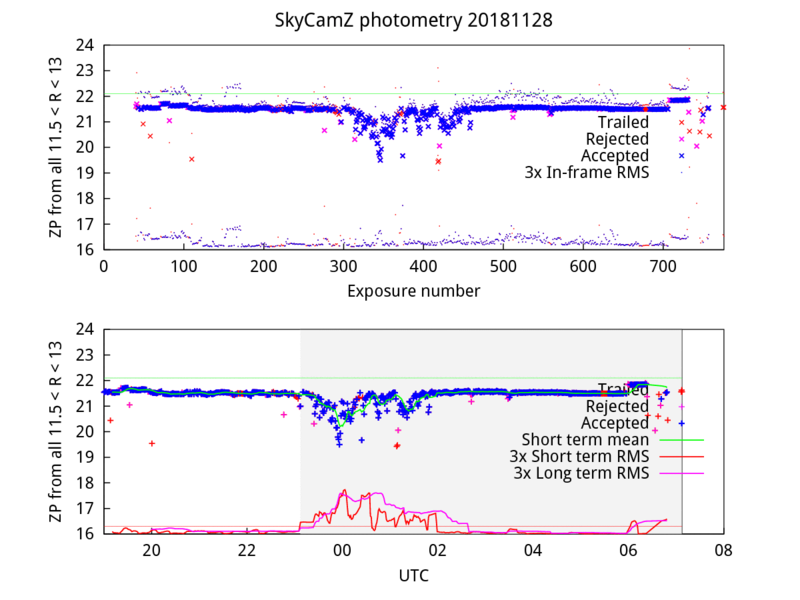 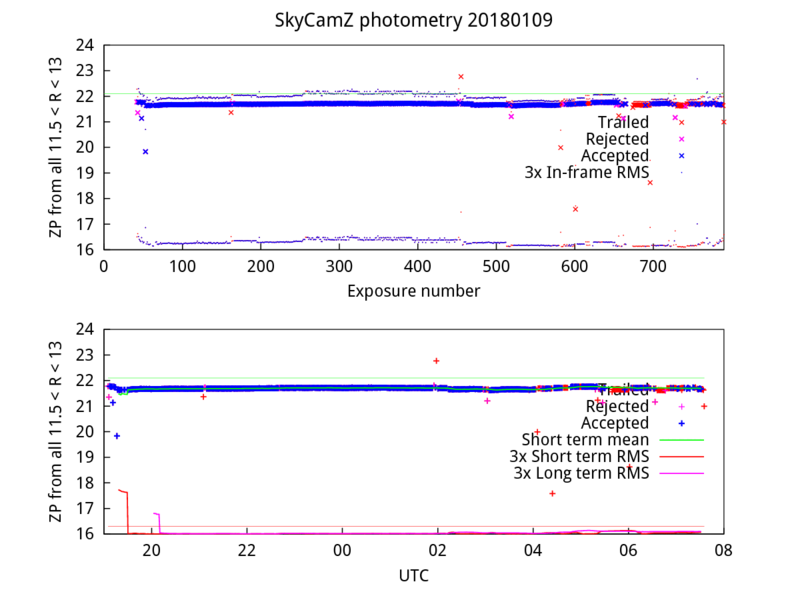 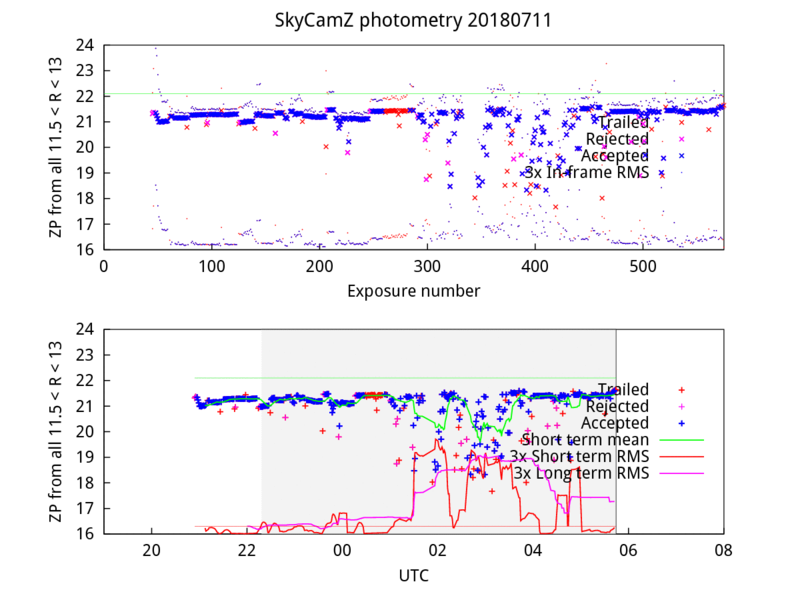 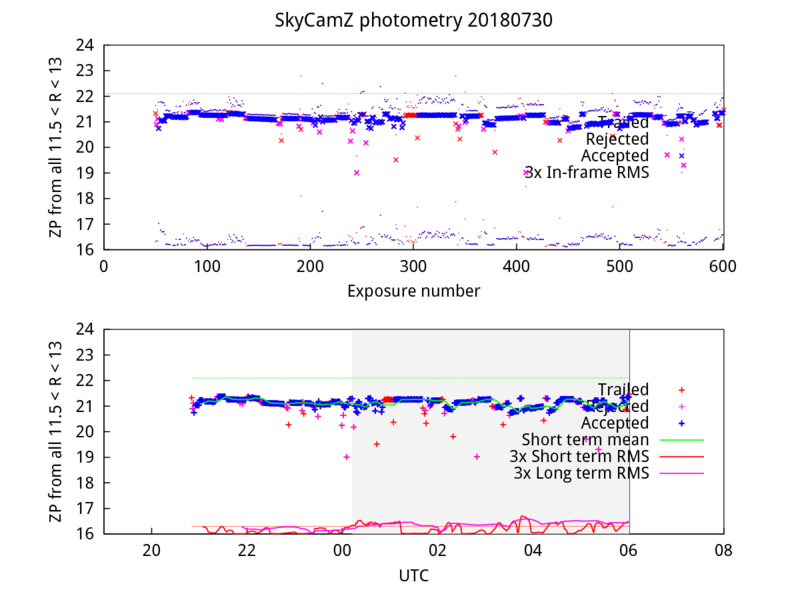 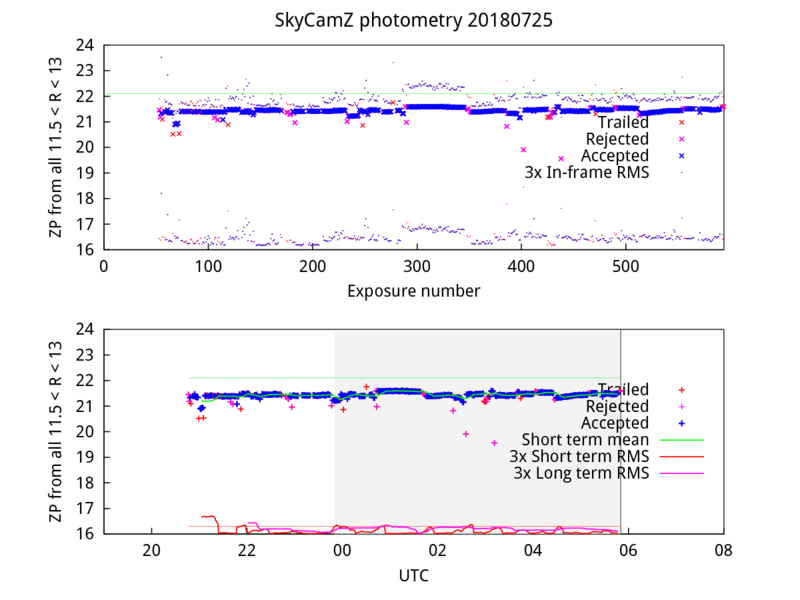 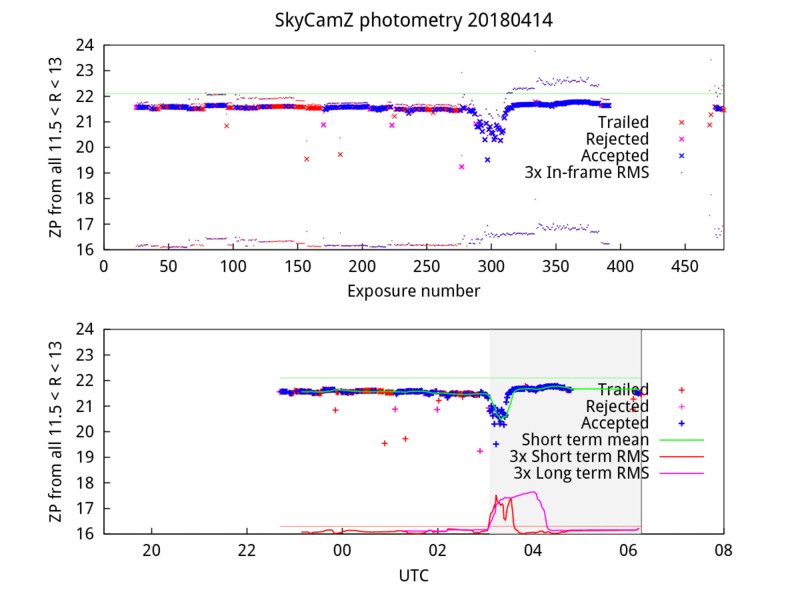 Below we also provide links to Movies constructed from a sequence of optical images obtained with either SkyCam-A (covering the whole sky), SkyCam-T (a 9 degree field centred on each target; was 21 deg before Oct 2014) or SkyCam-Z (1 degree field). Images are obtained every minute or so throughout the entire night. These movies can usually be used to establish, qualitatively at least, how clear or cloudy a given night was. 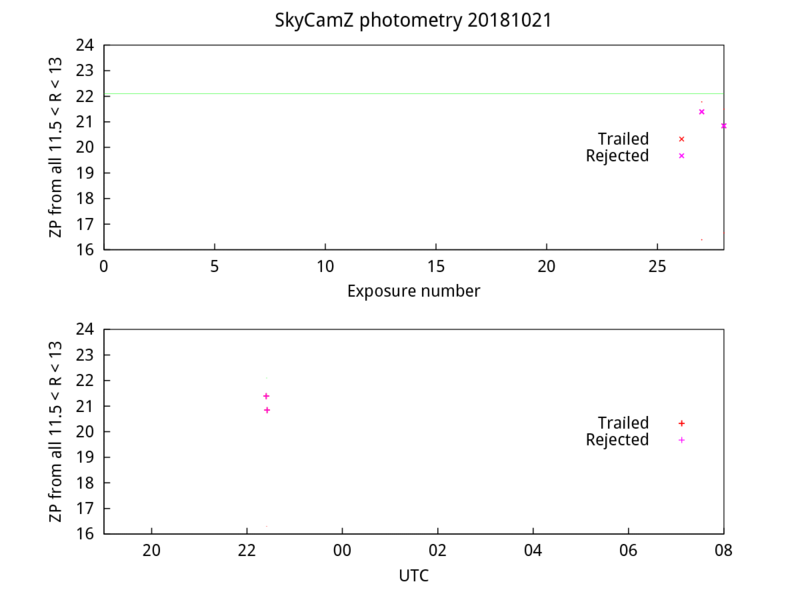 On bright nights (i.e. when the moon is up), the smaller-field camera's T and Z are often more useful than the full-sky camera A. 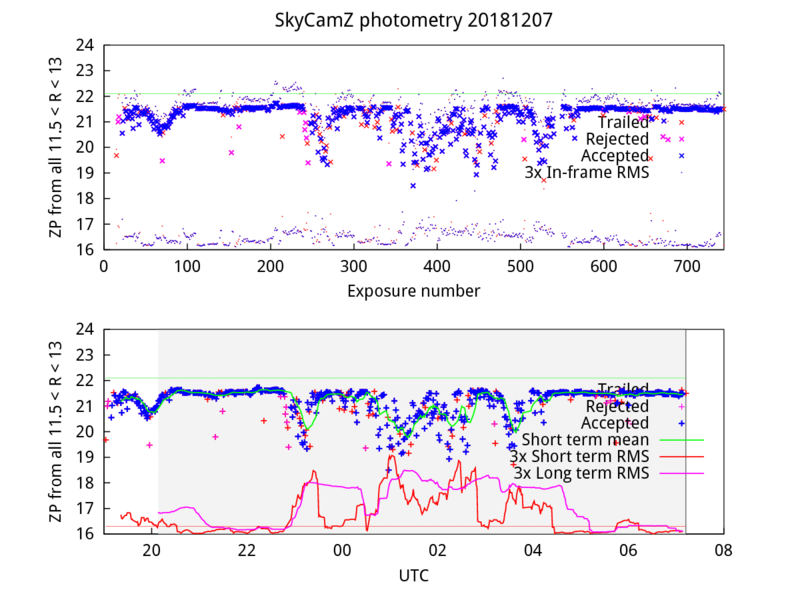 Additional movies and still images are available from the Skycam Archive. 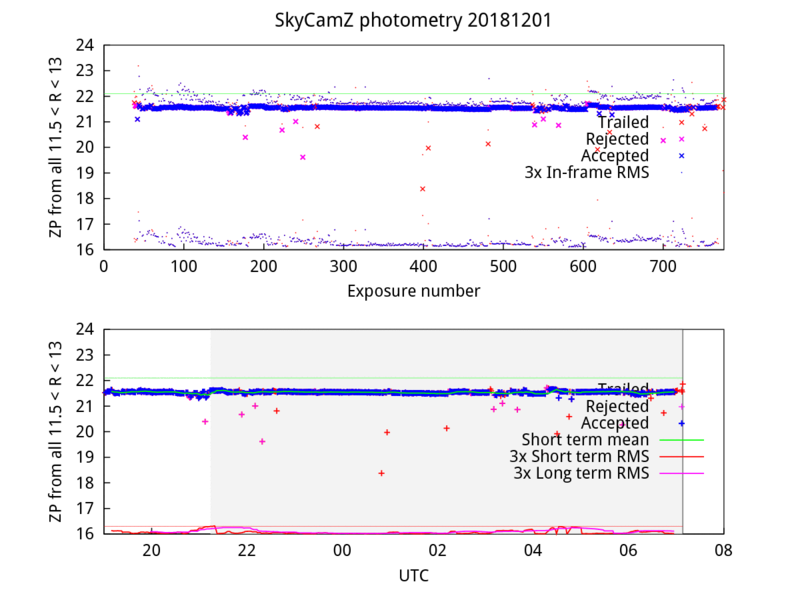 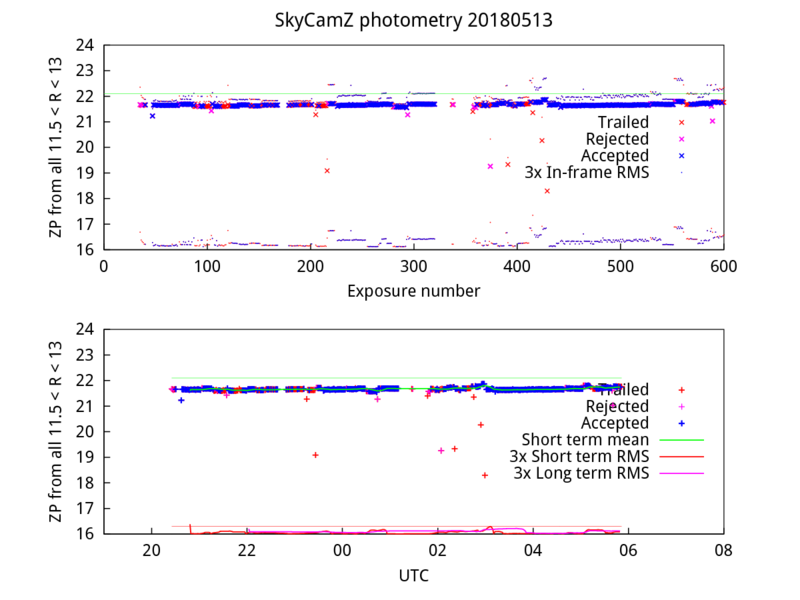 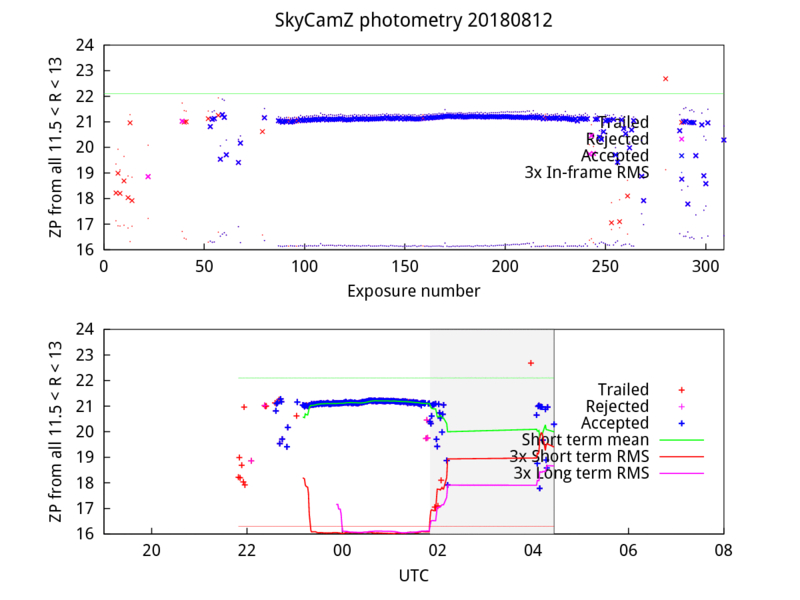 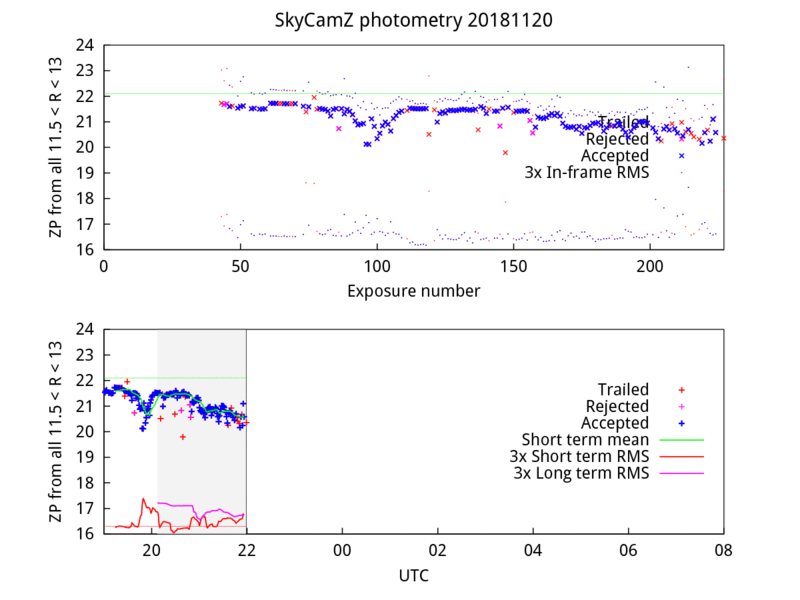 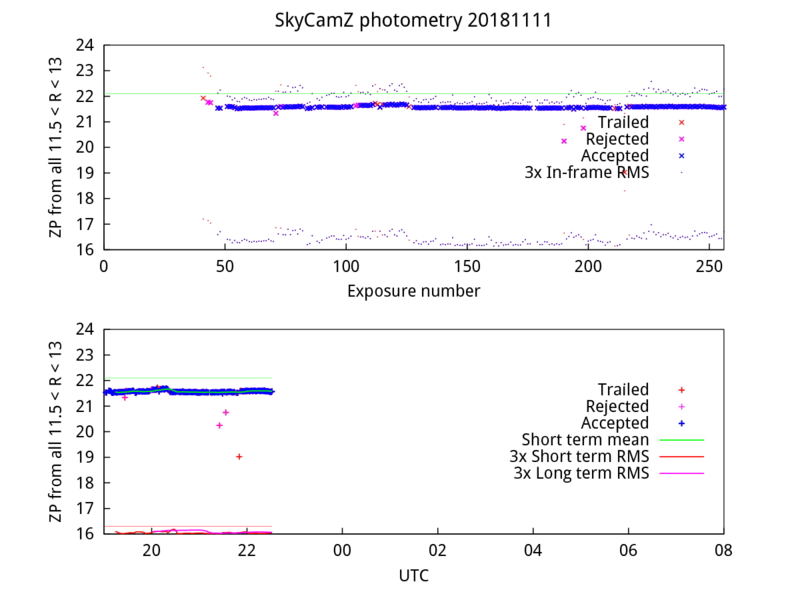 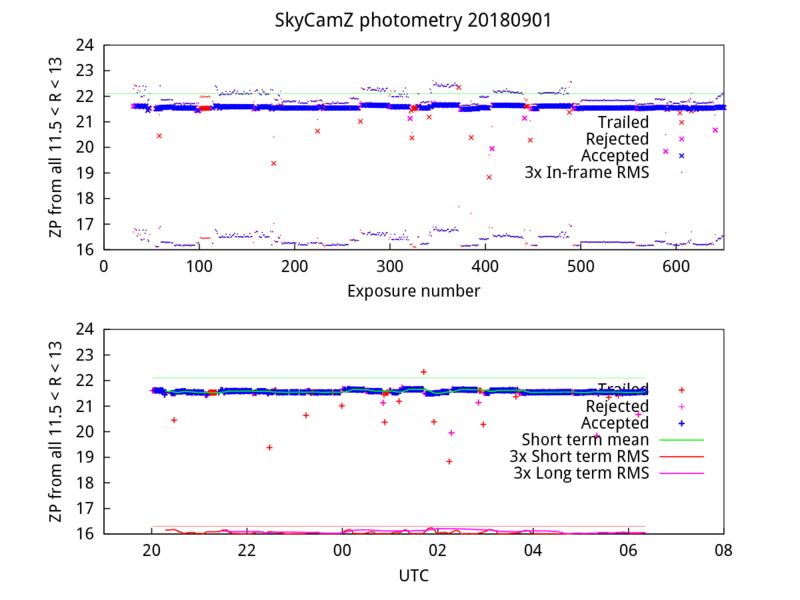 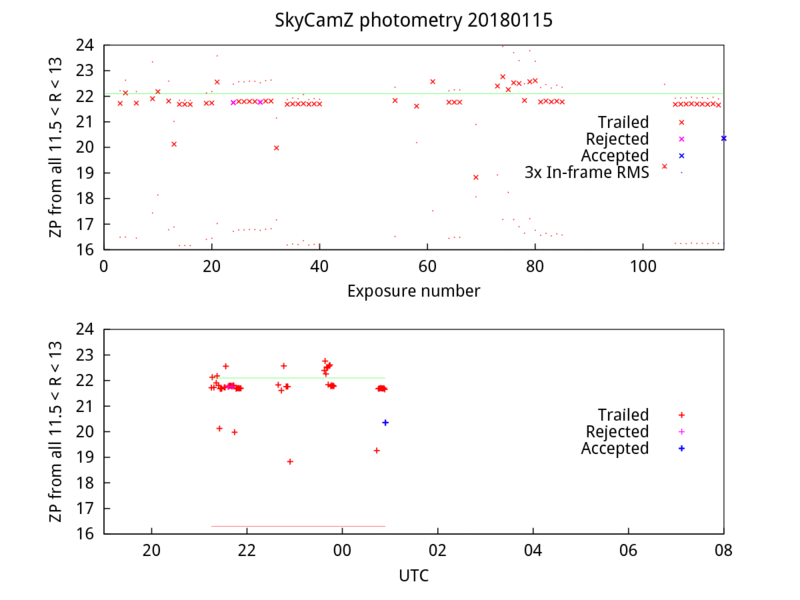 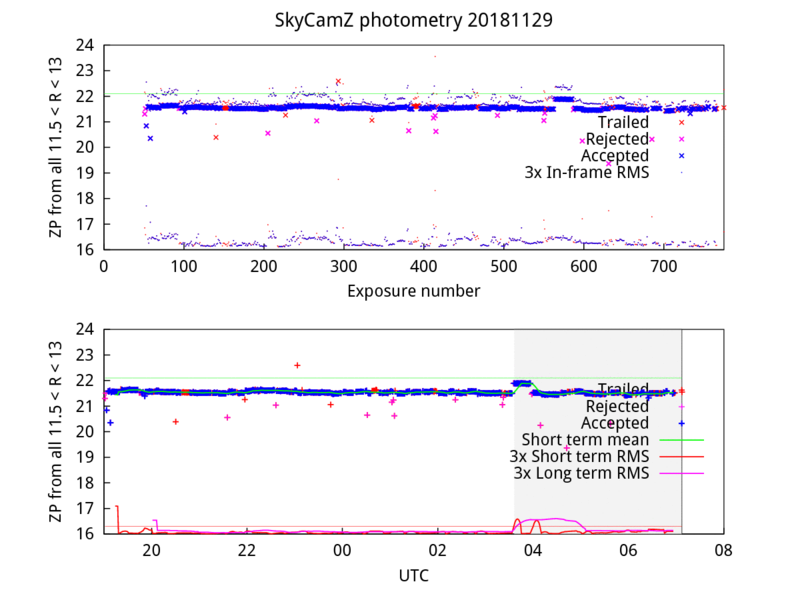 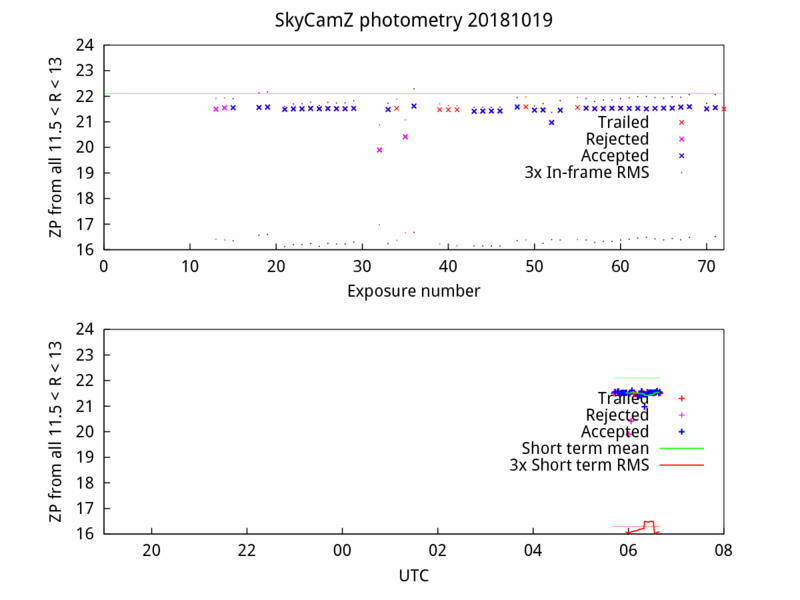 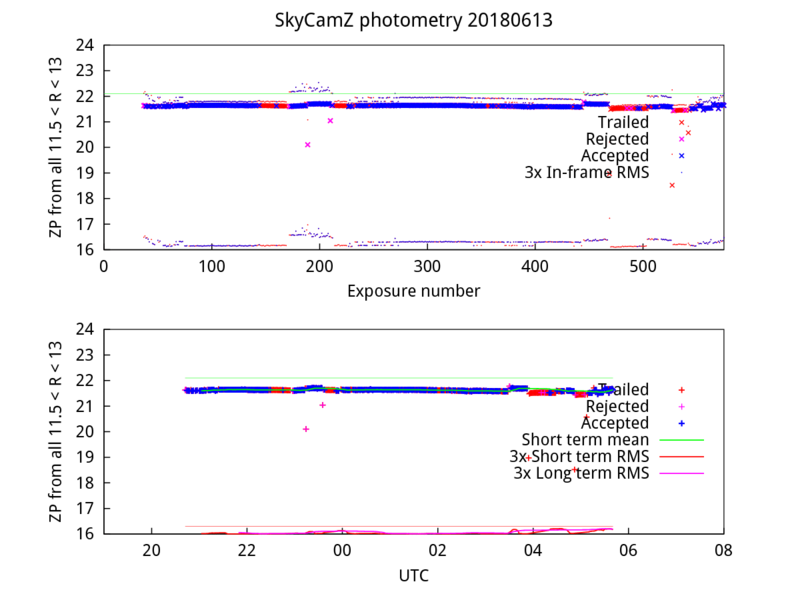 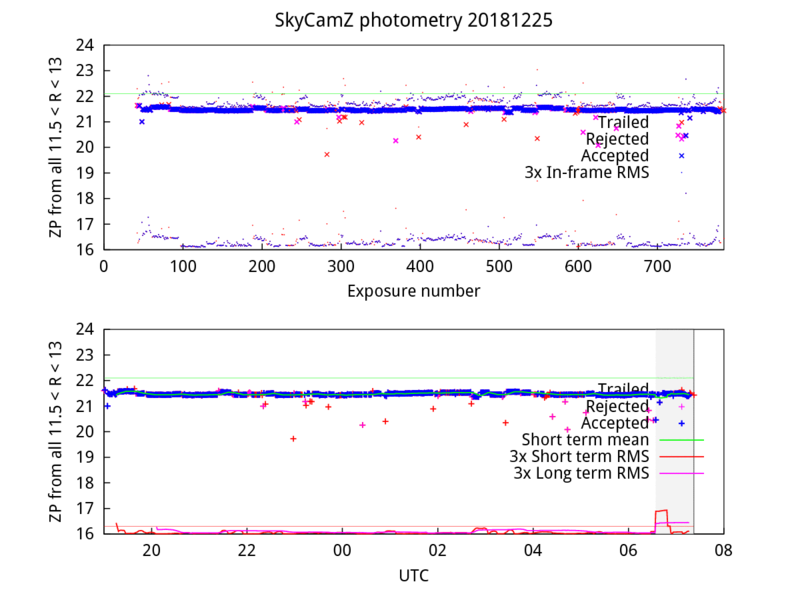 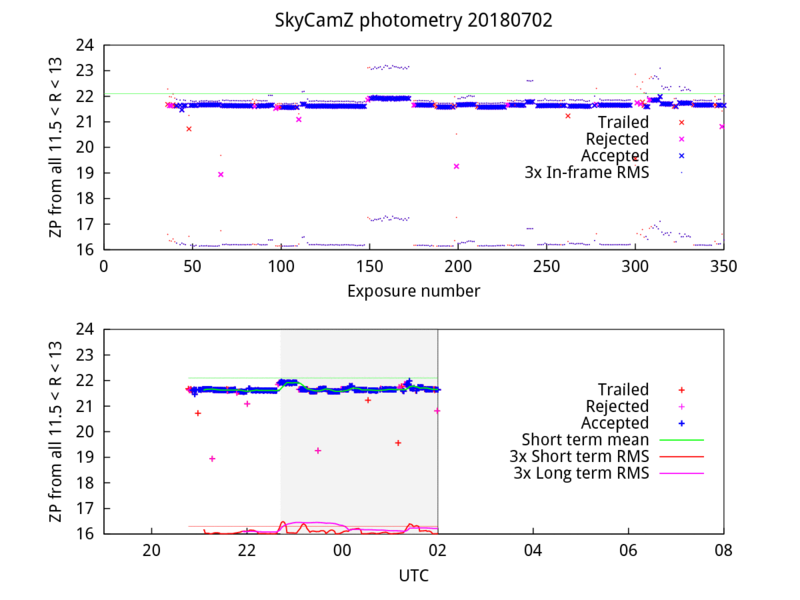 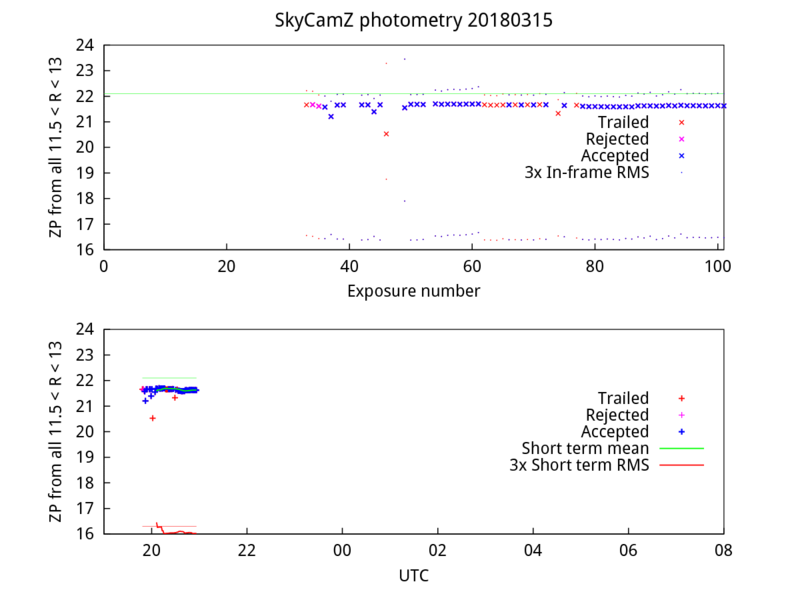 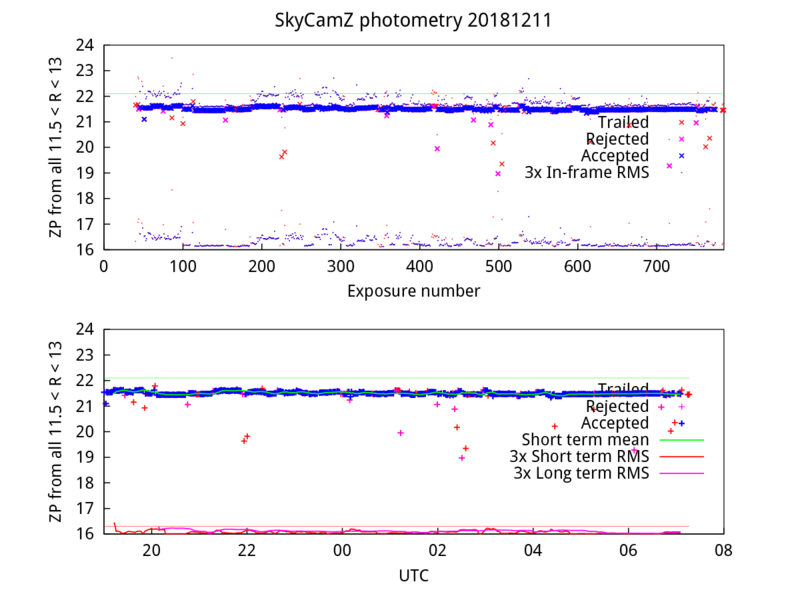 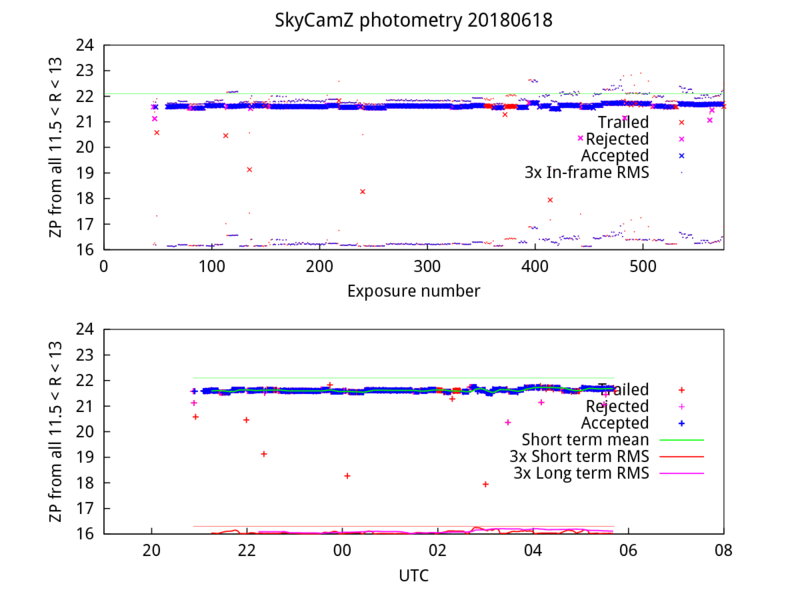 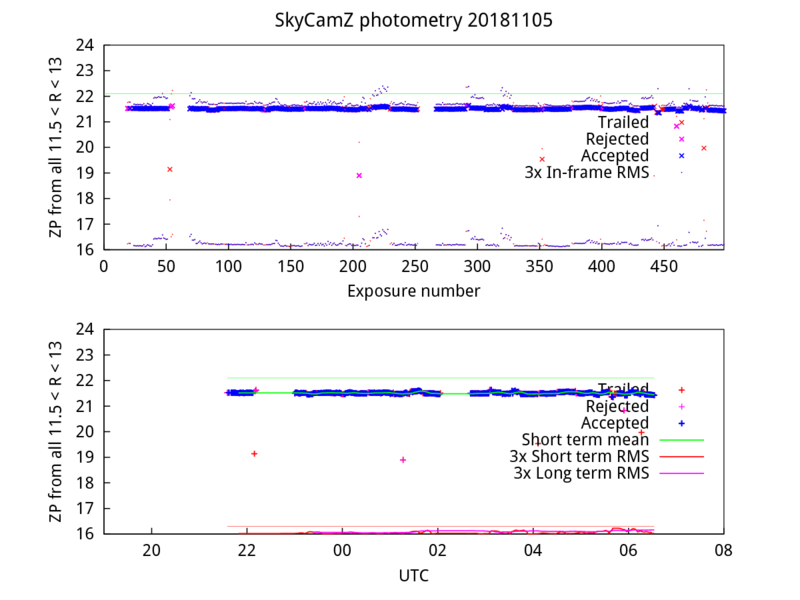 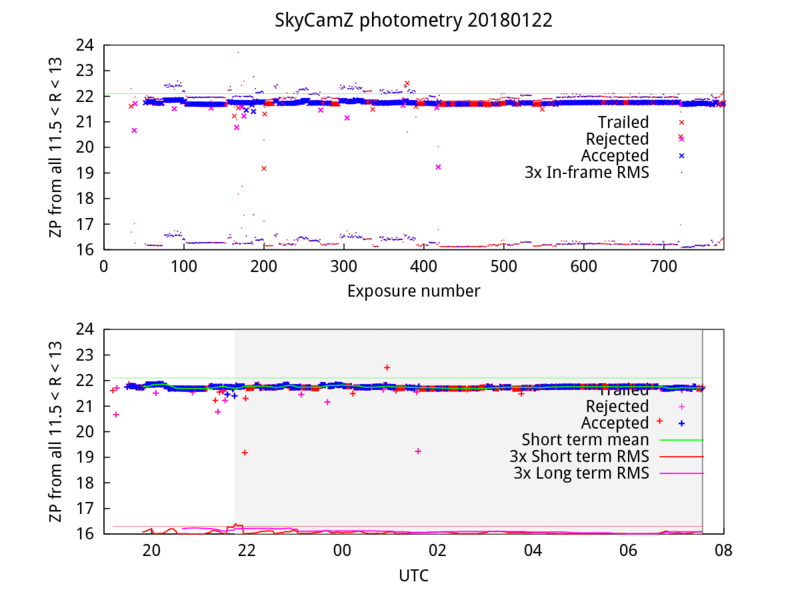 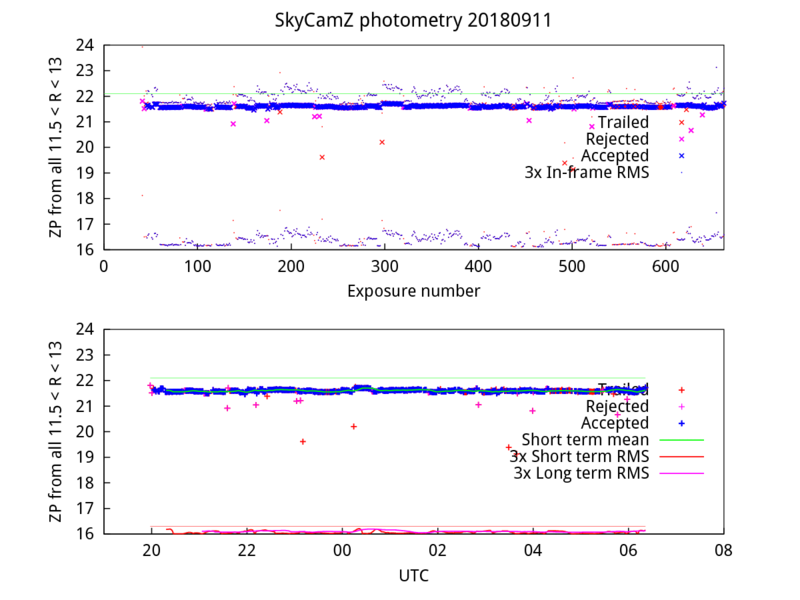 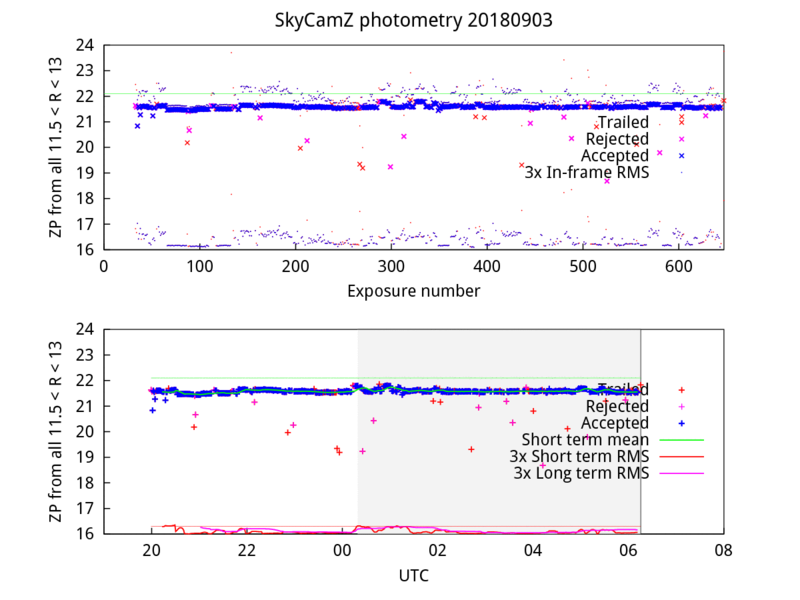 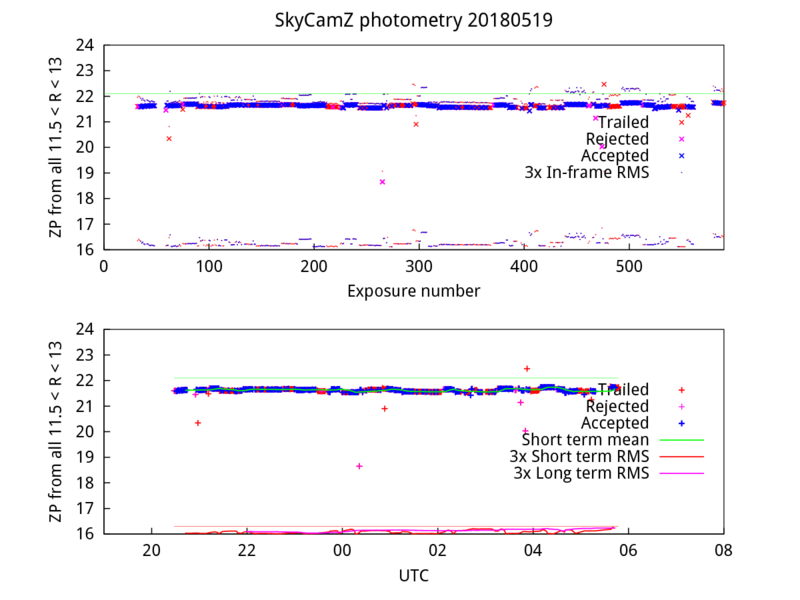 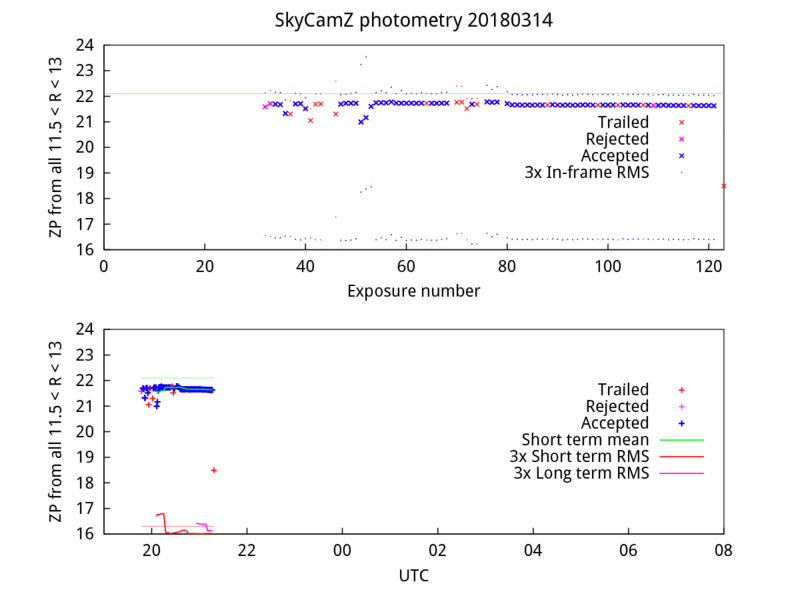 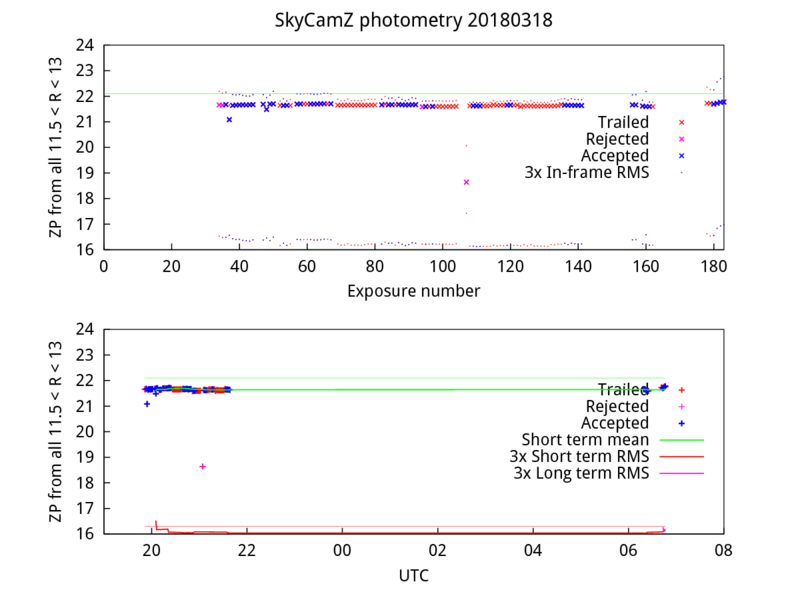 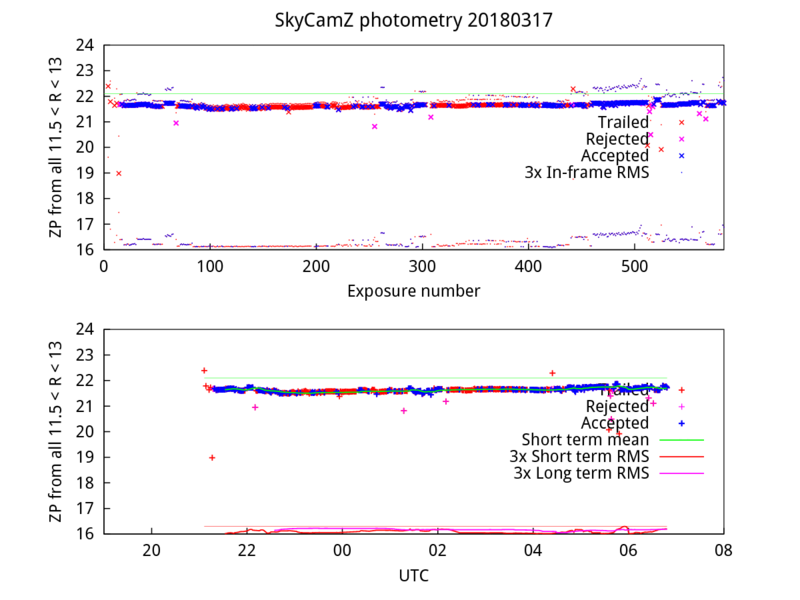 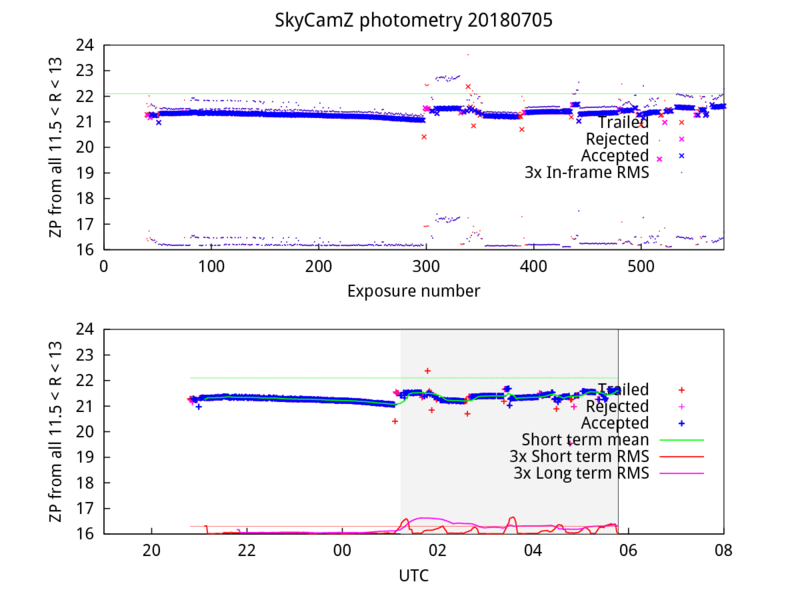 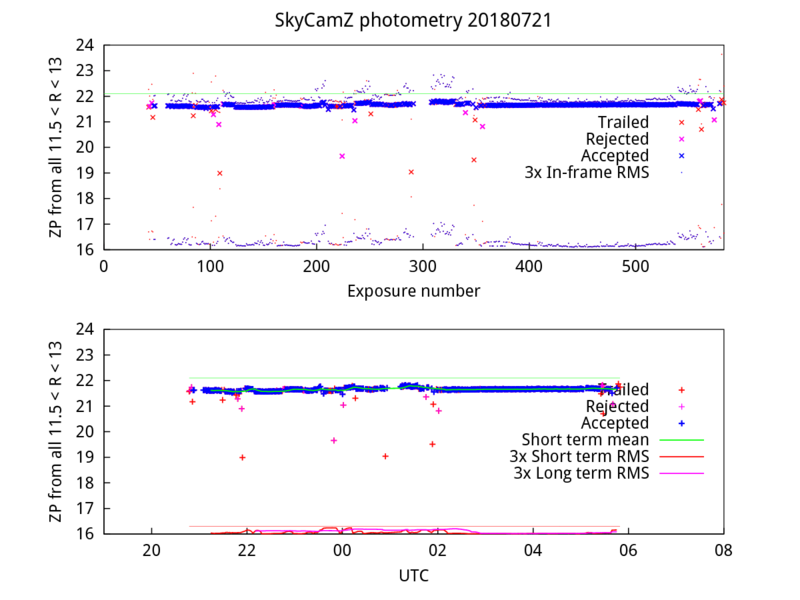 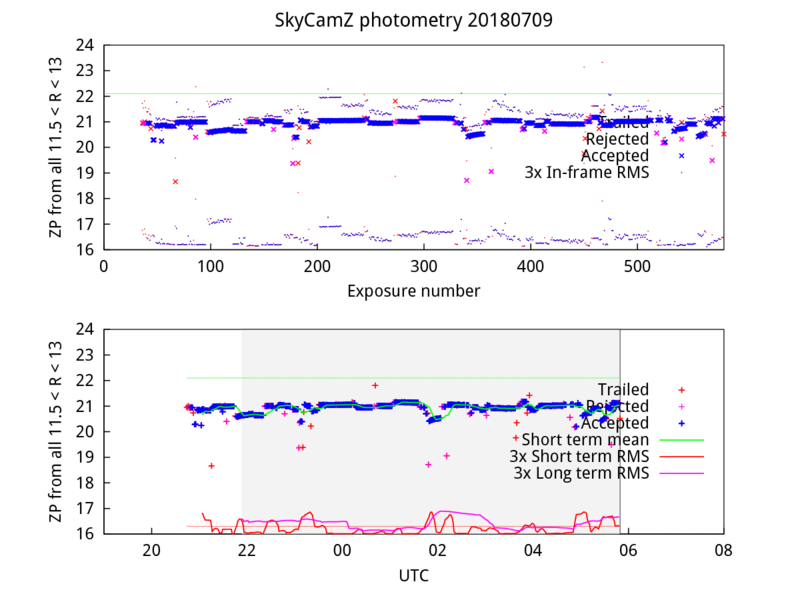 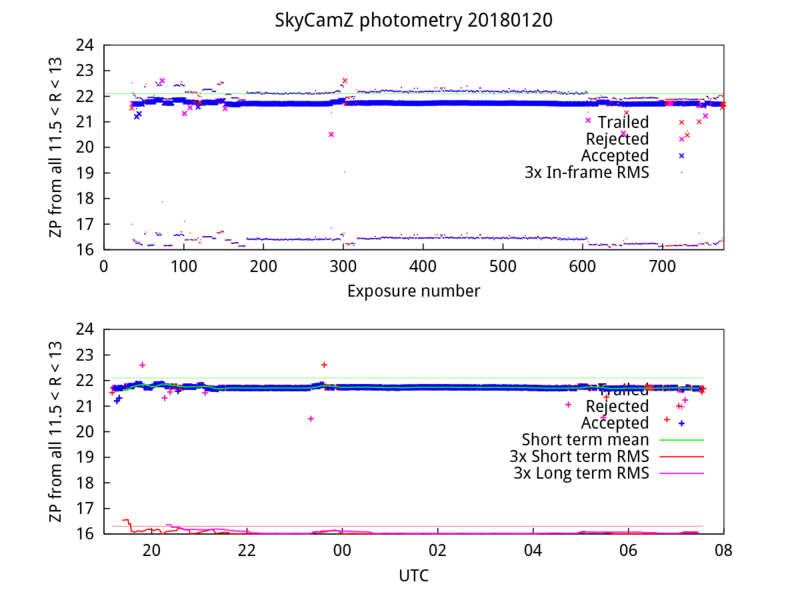 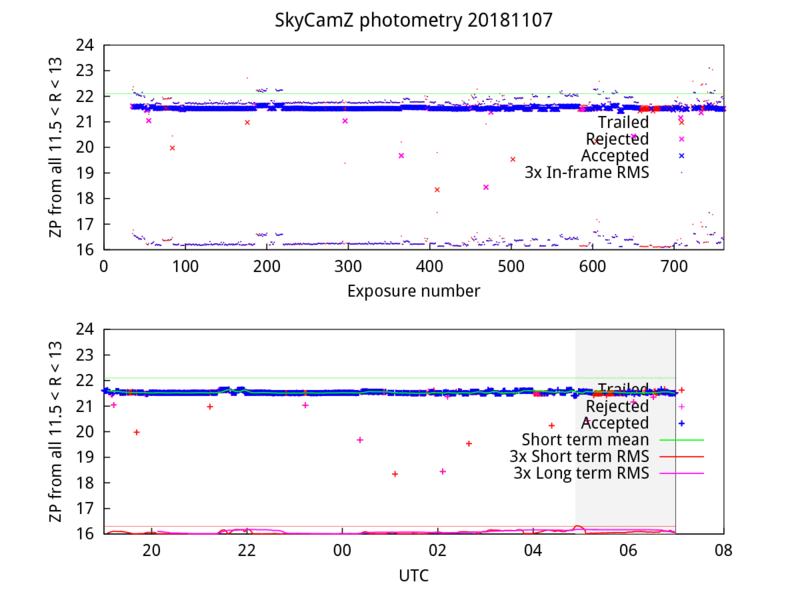 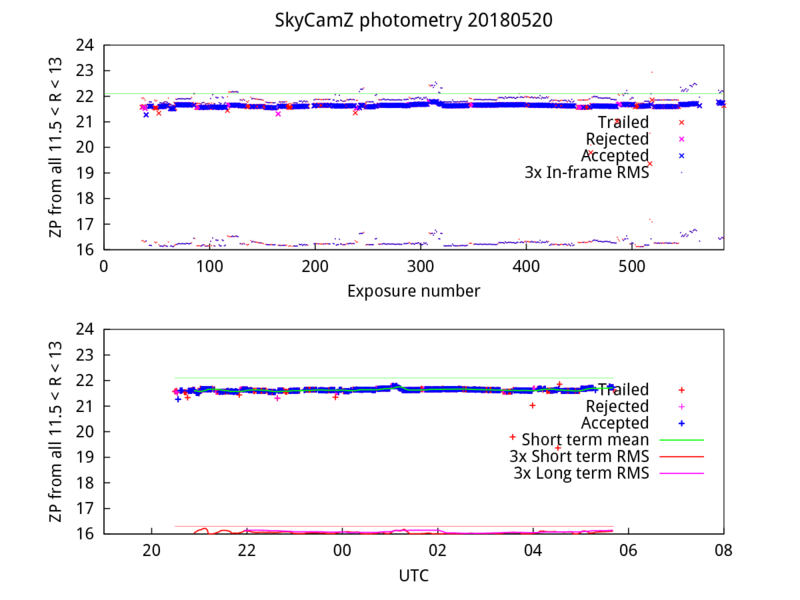 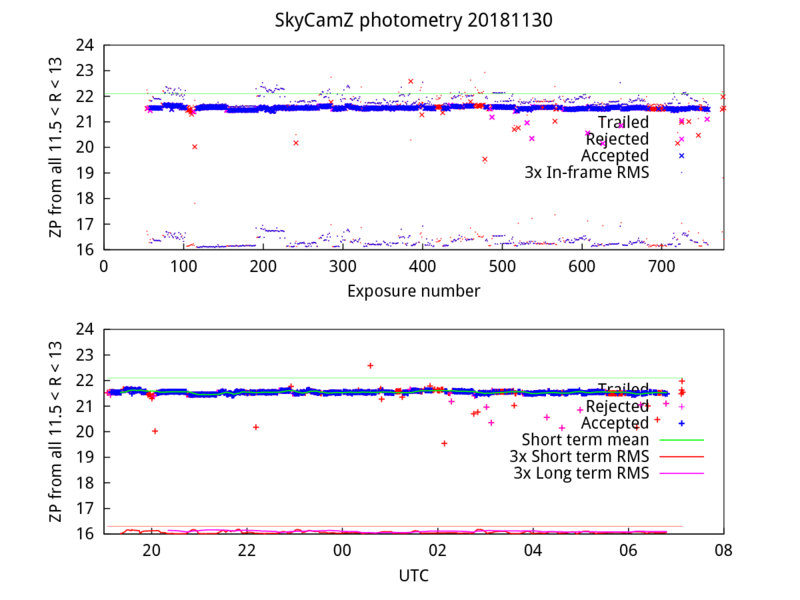 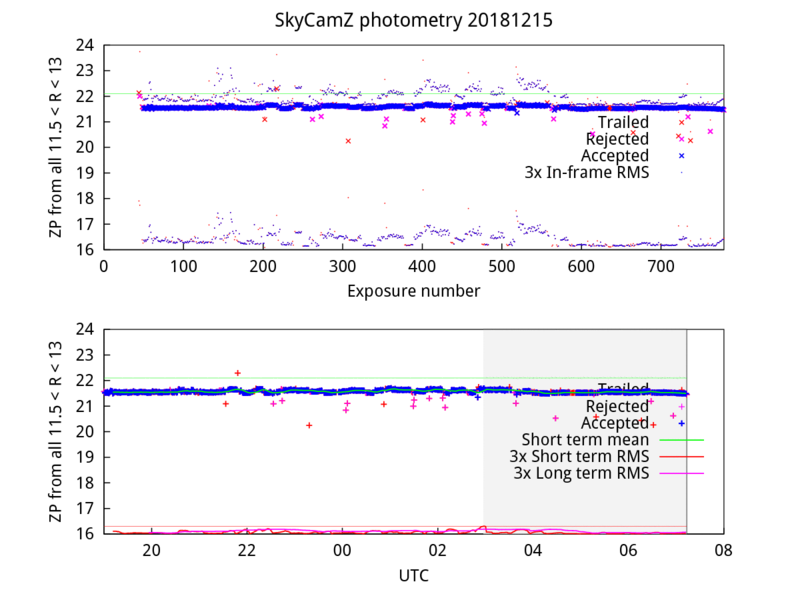 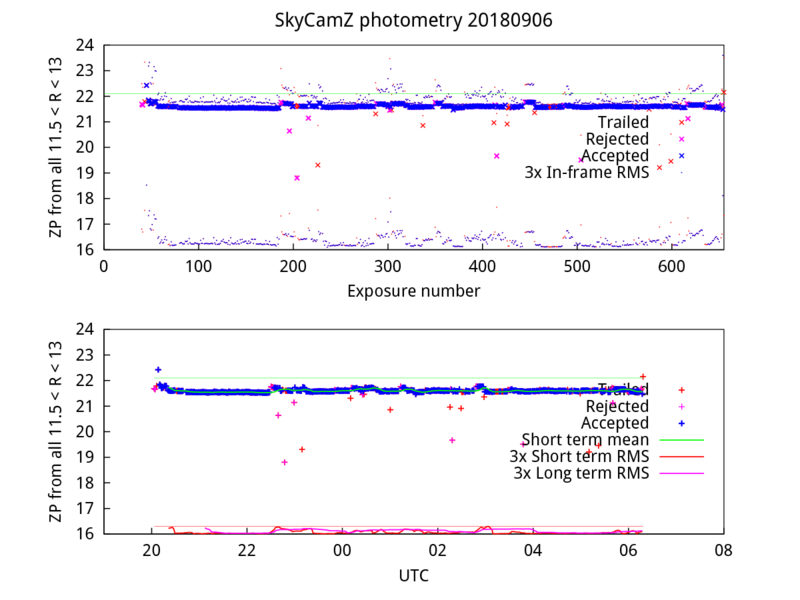 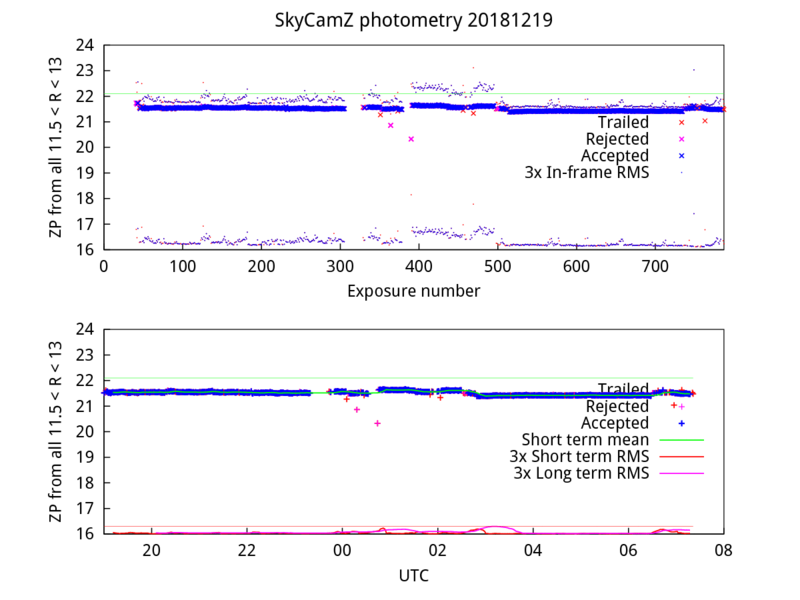 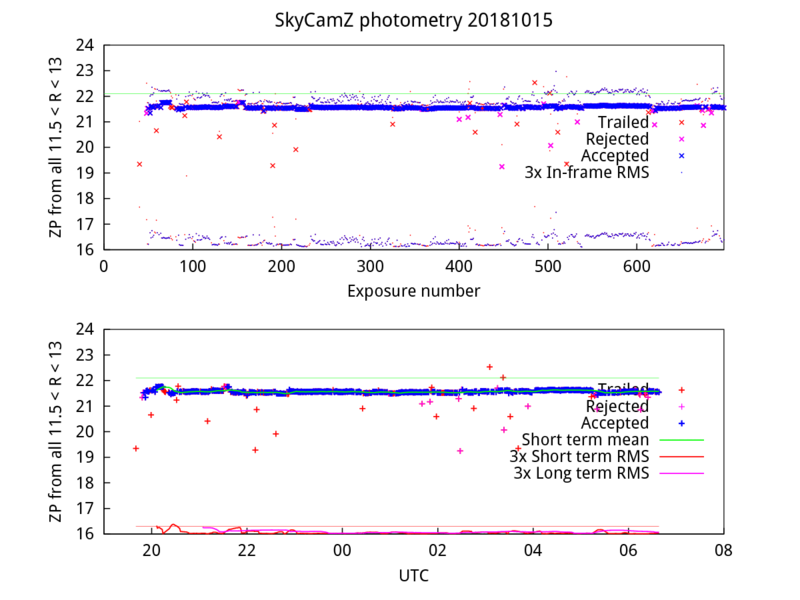 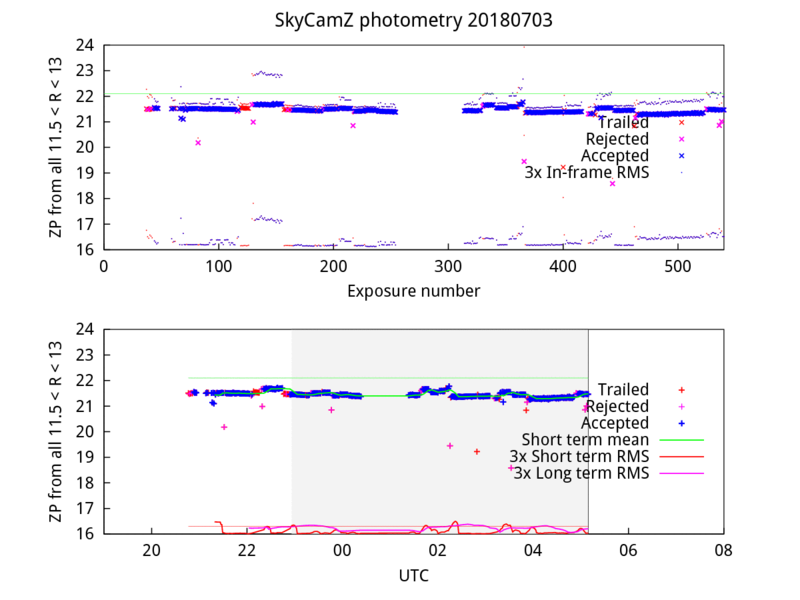 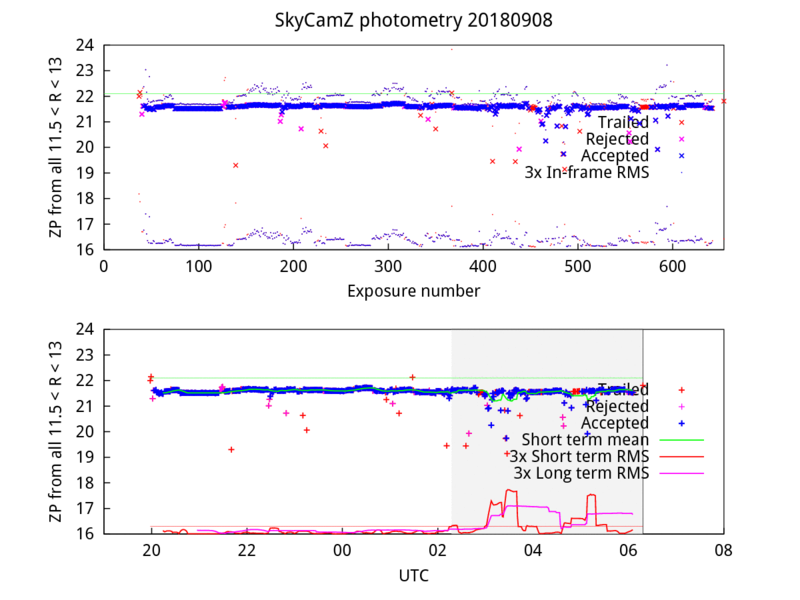 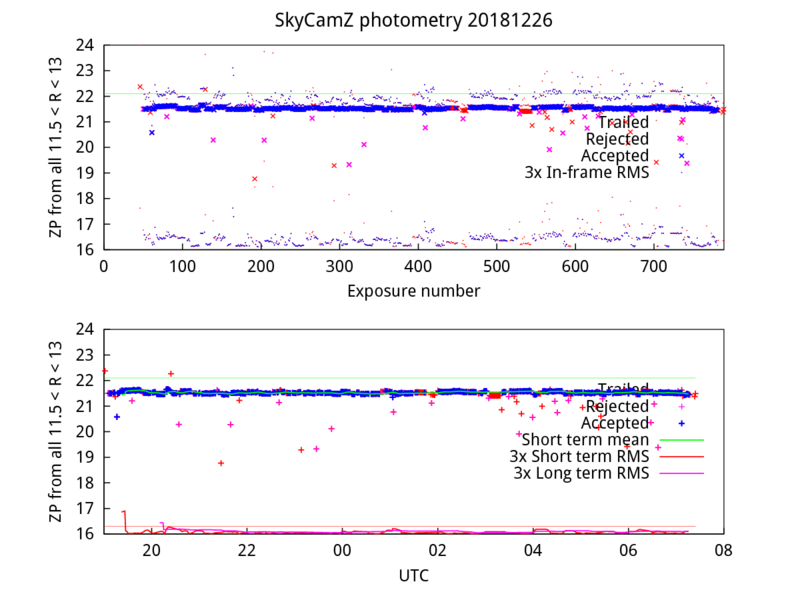 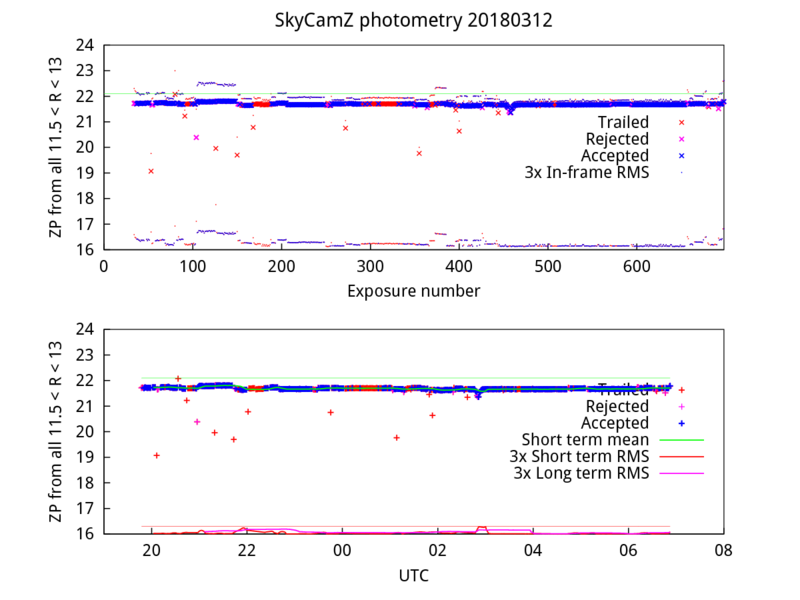 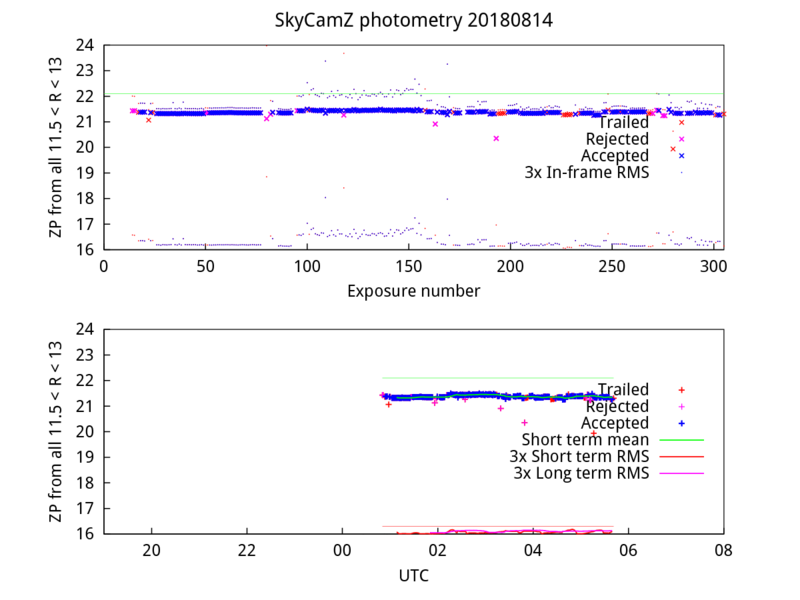 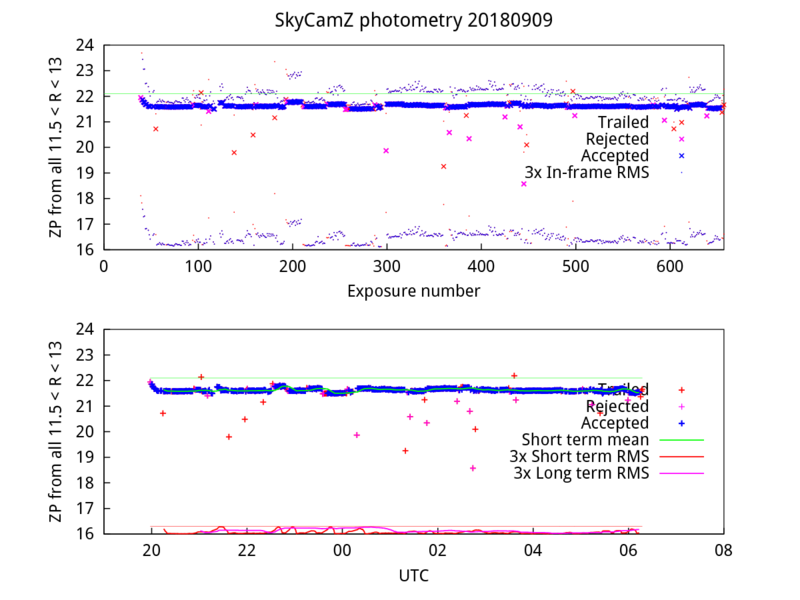 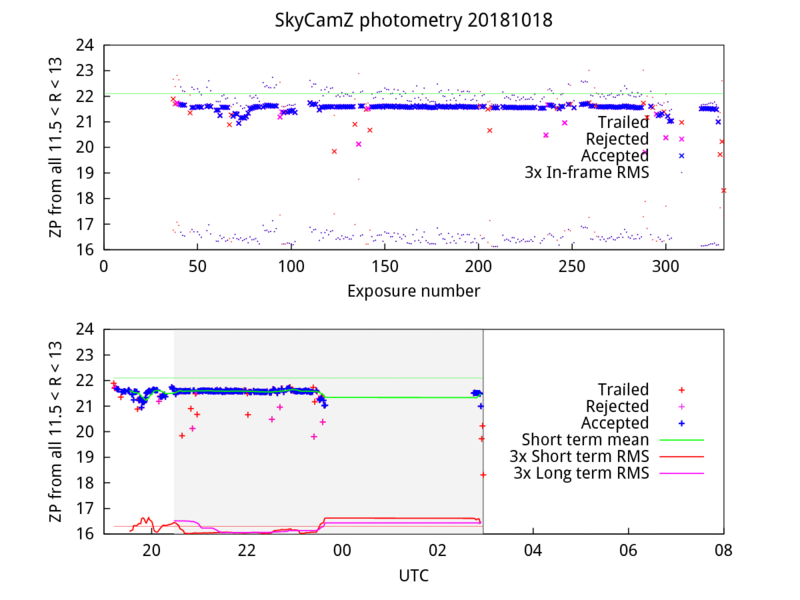 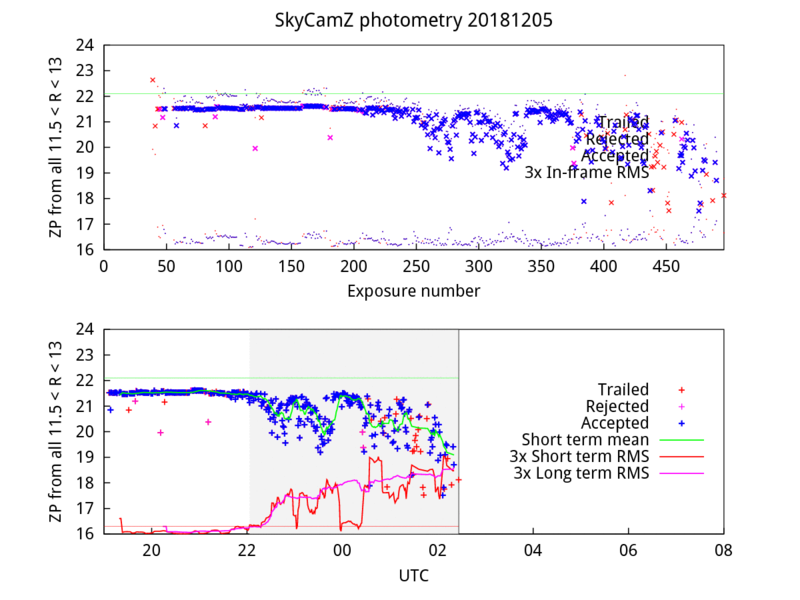 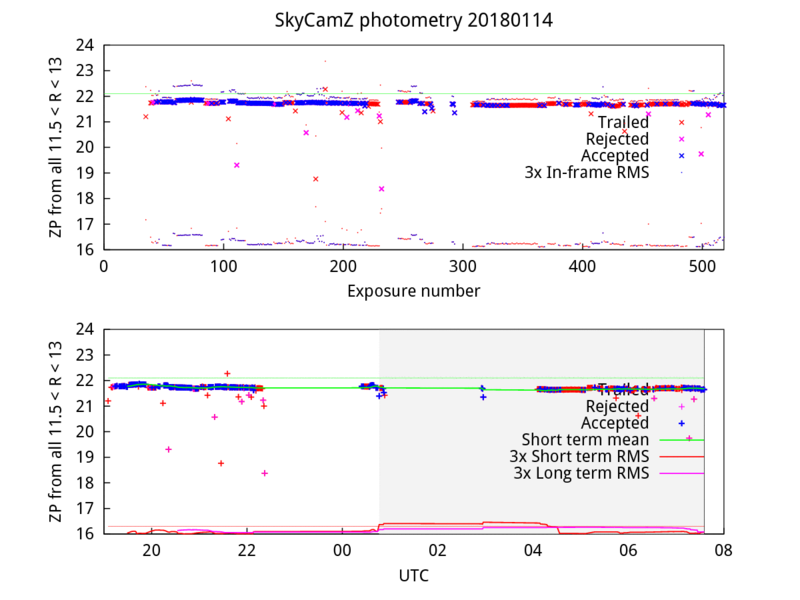 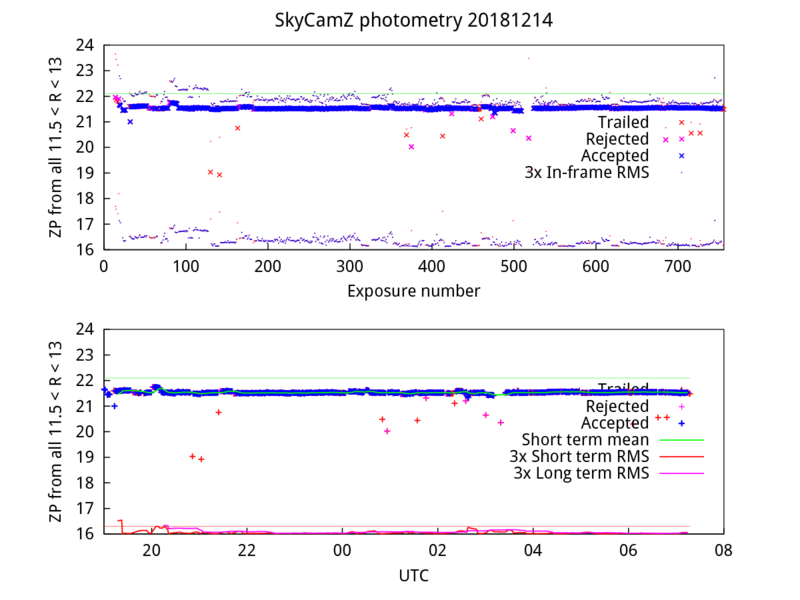 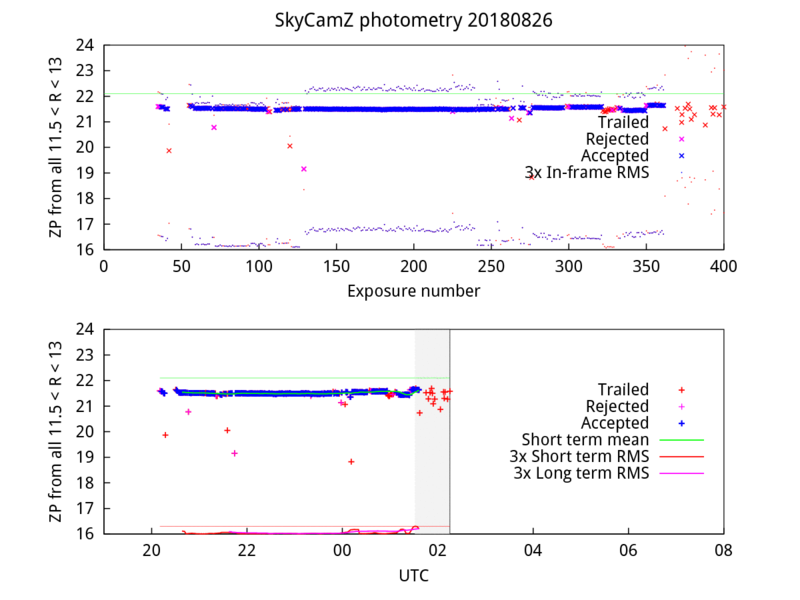 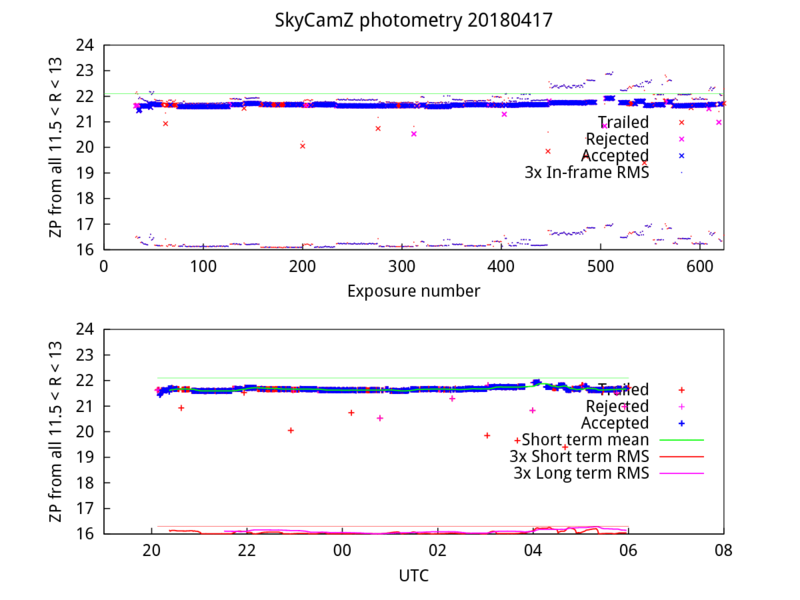 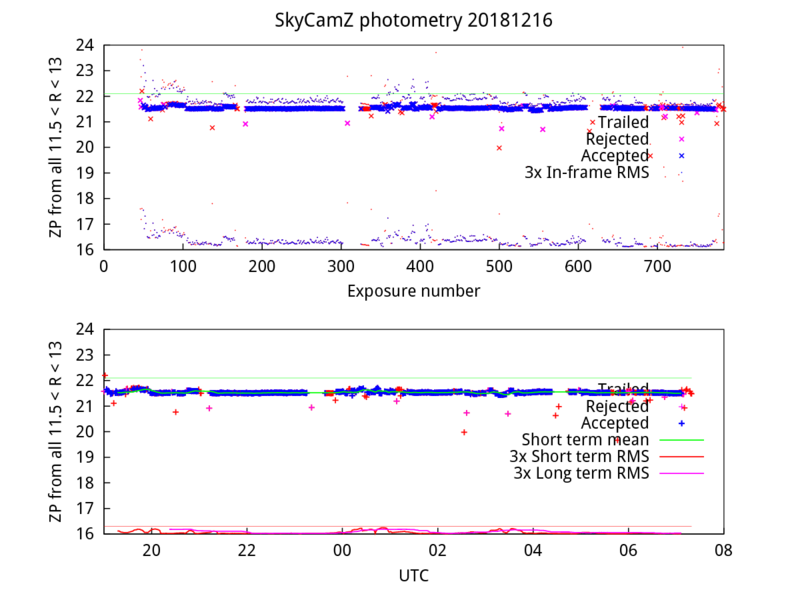 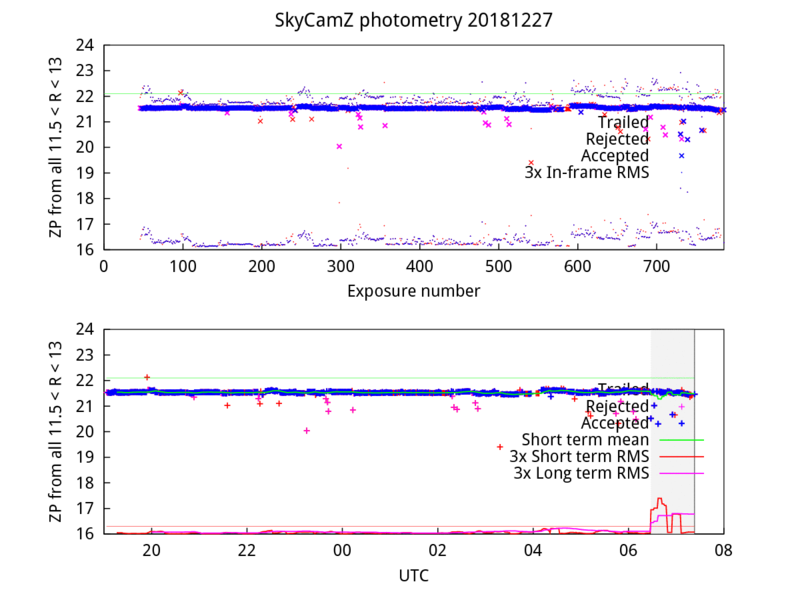 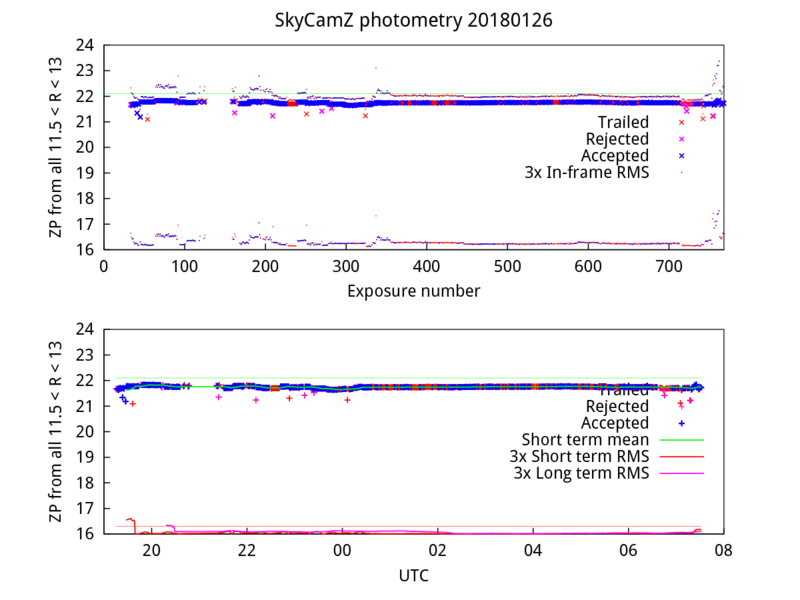 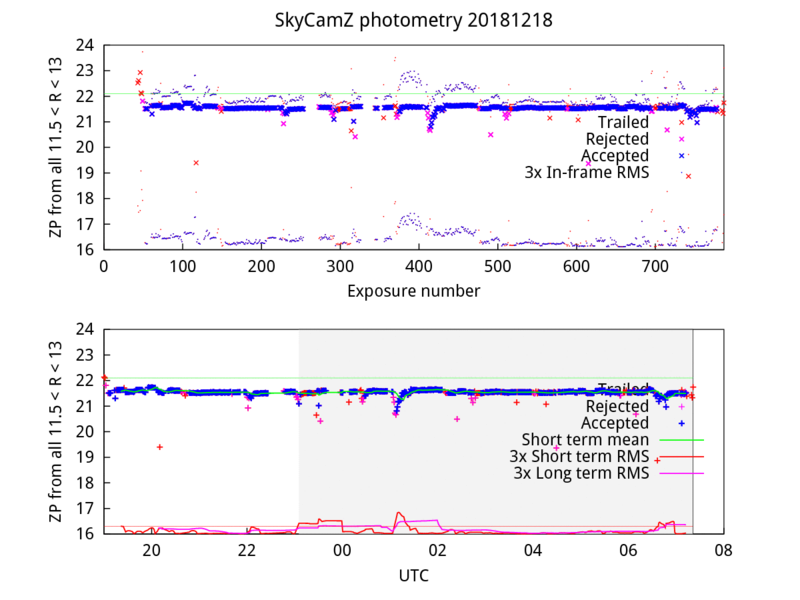 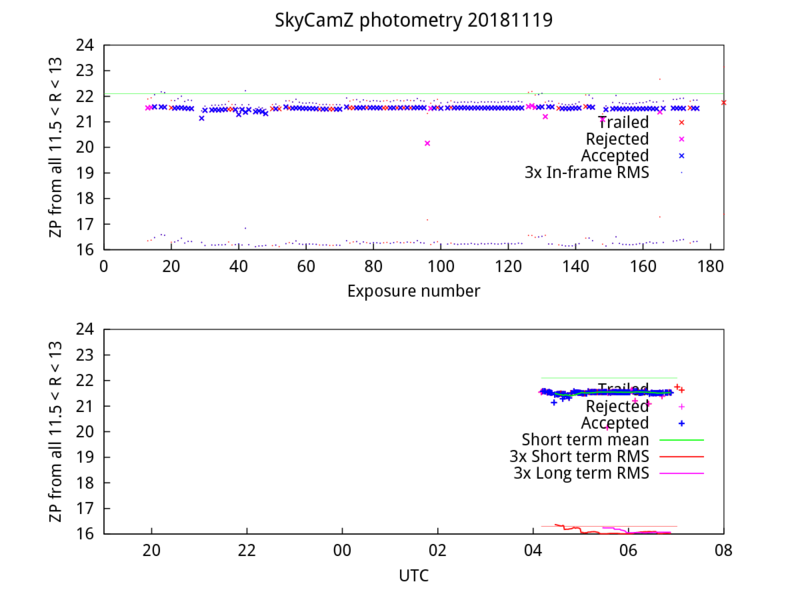 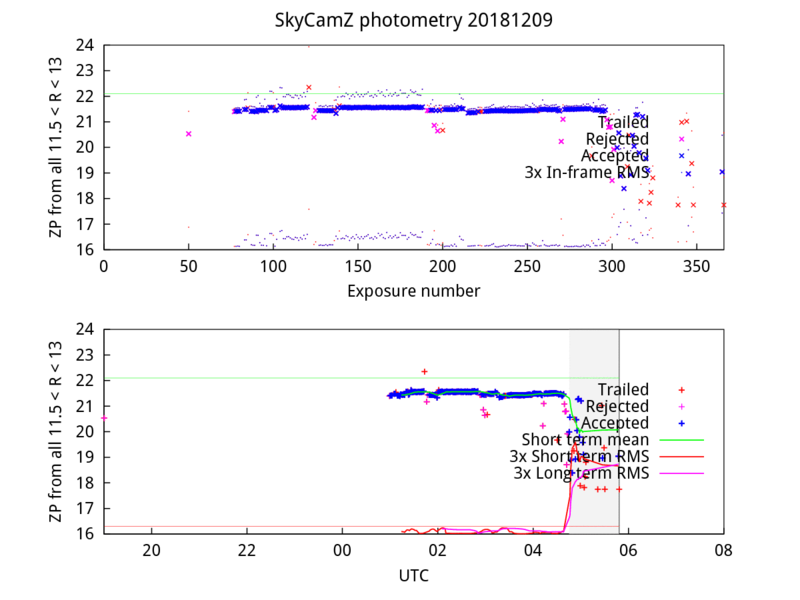 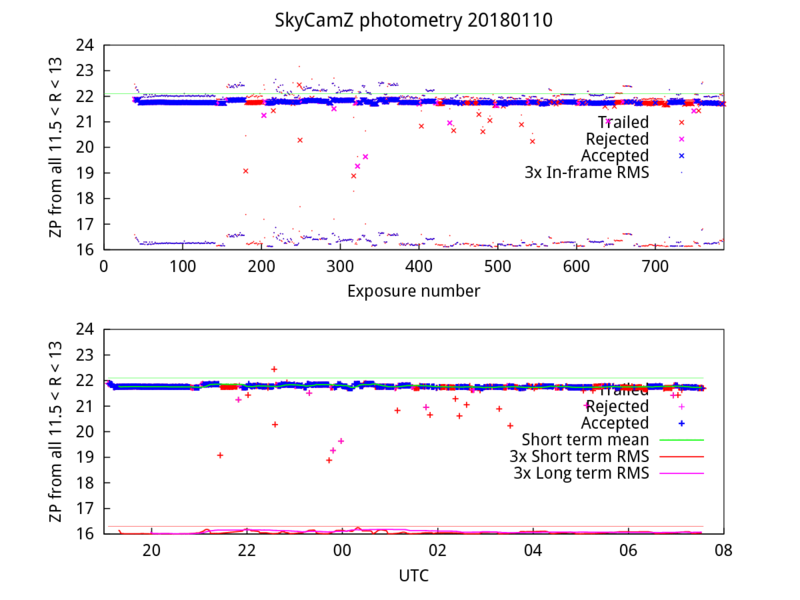 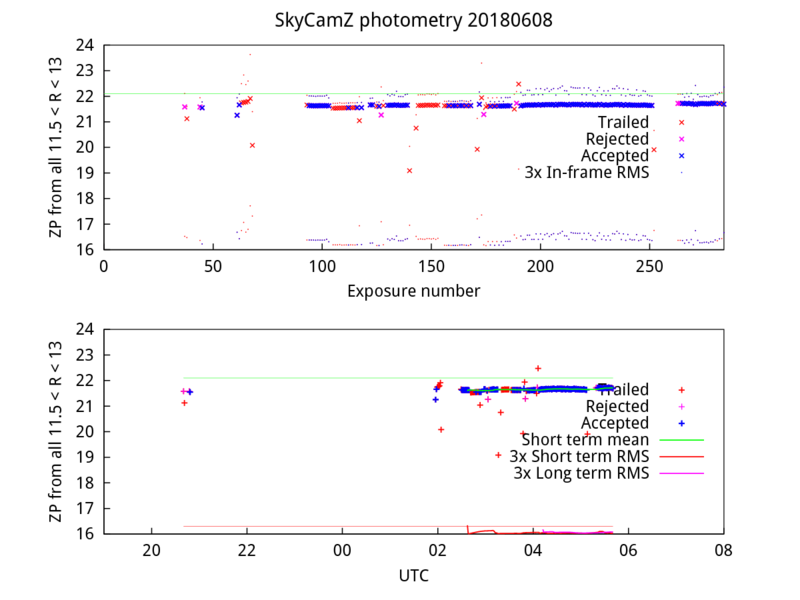 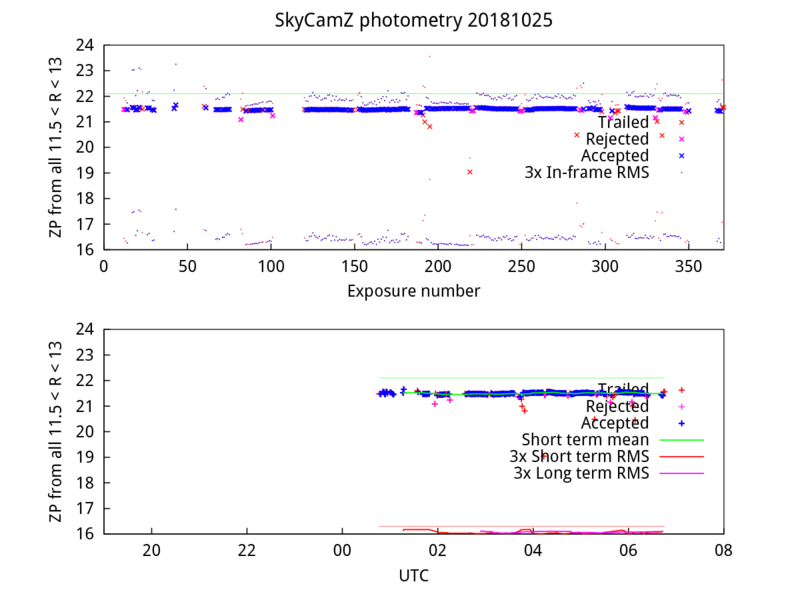 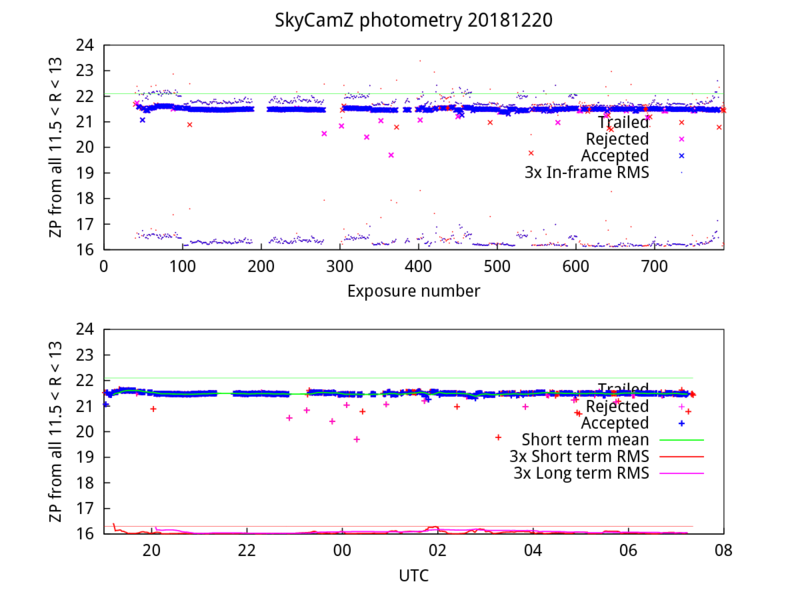 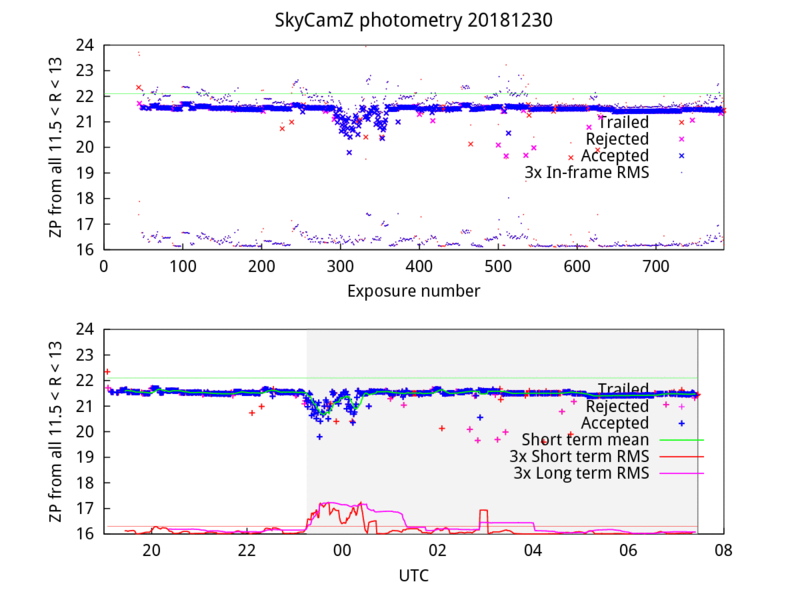 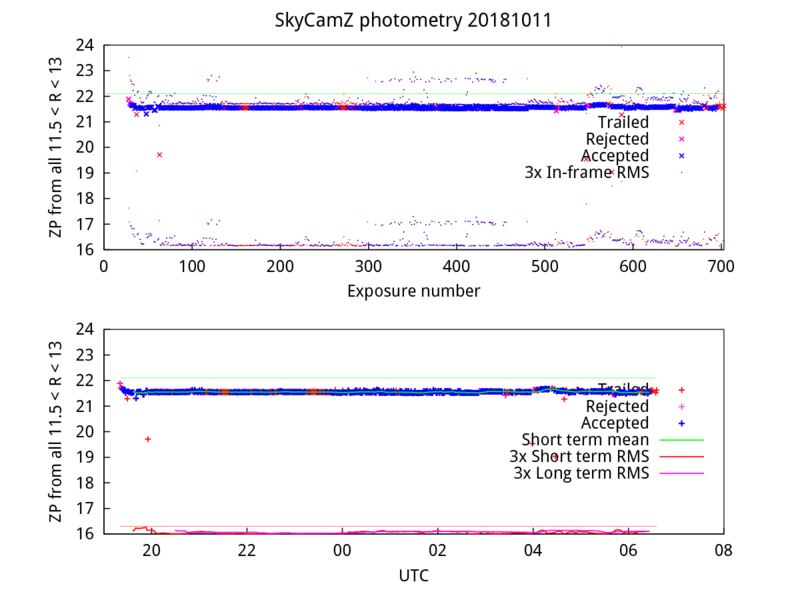 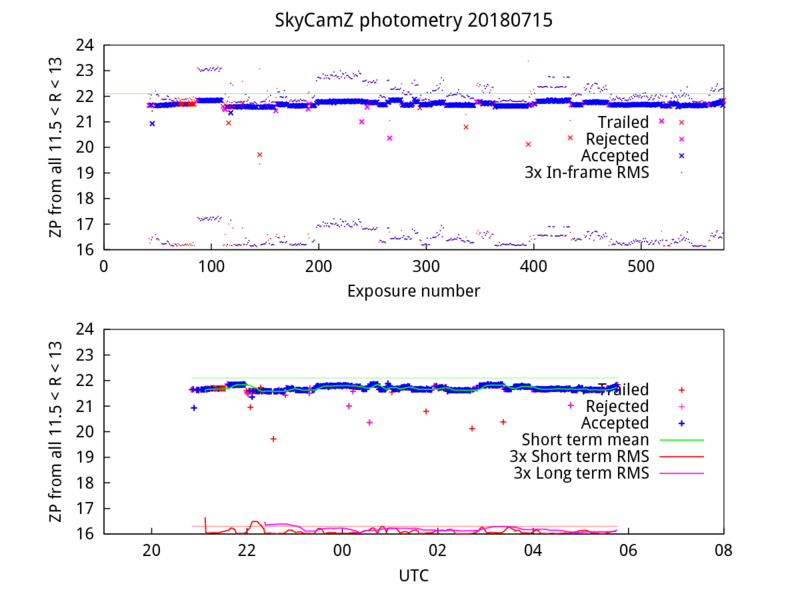 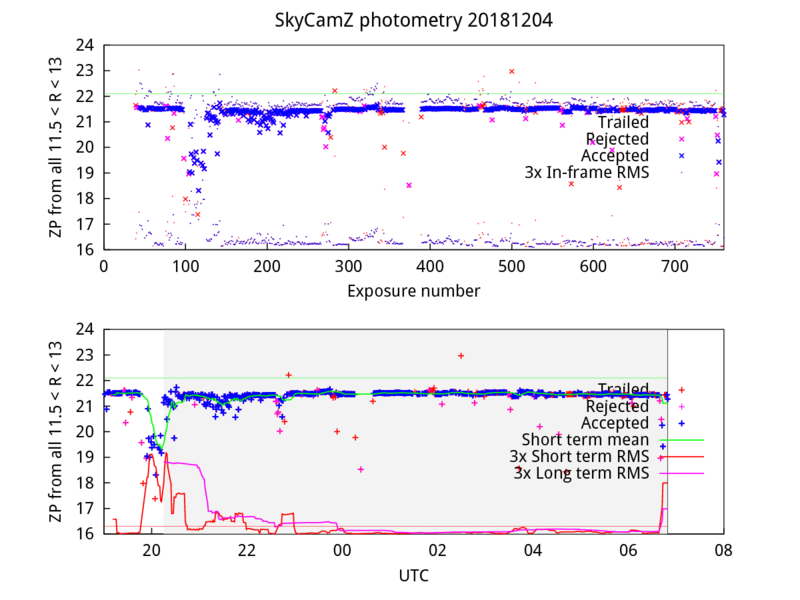 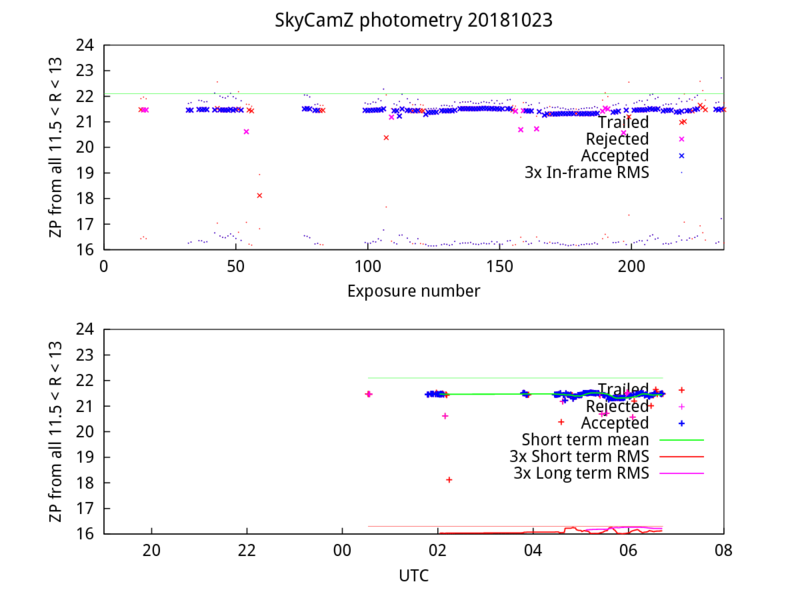 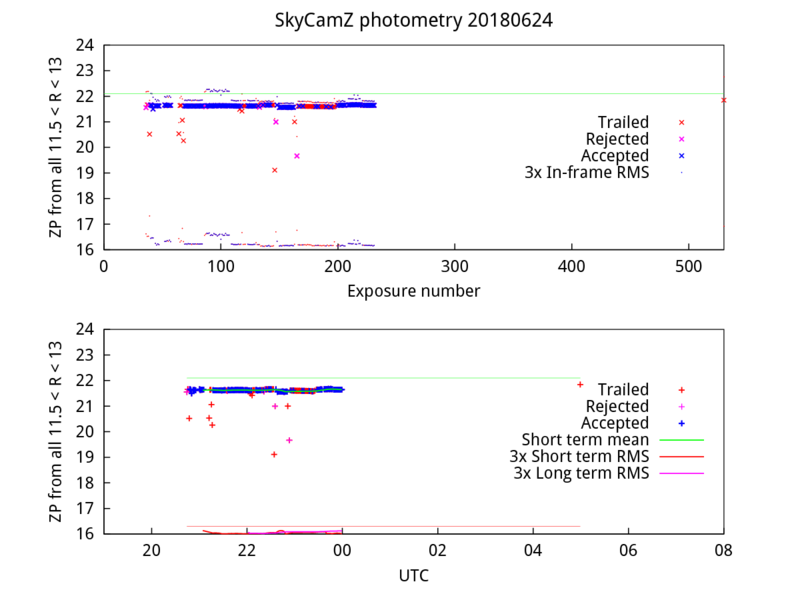 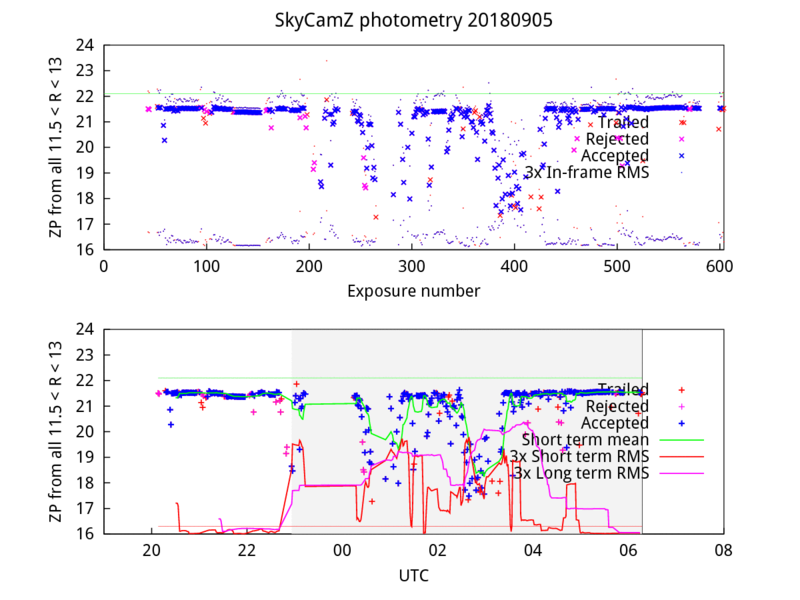 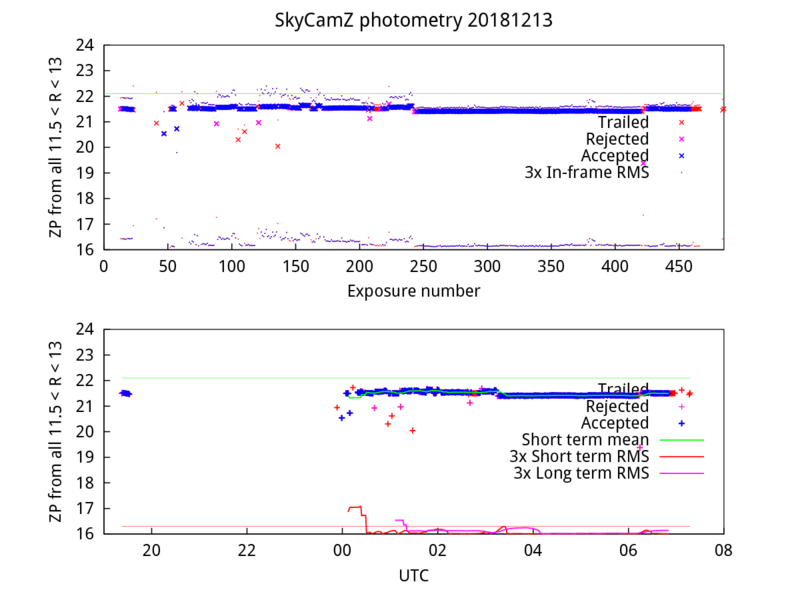 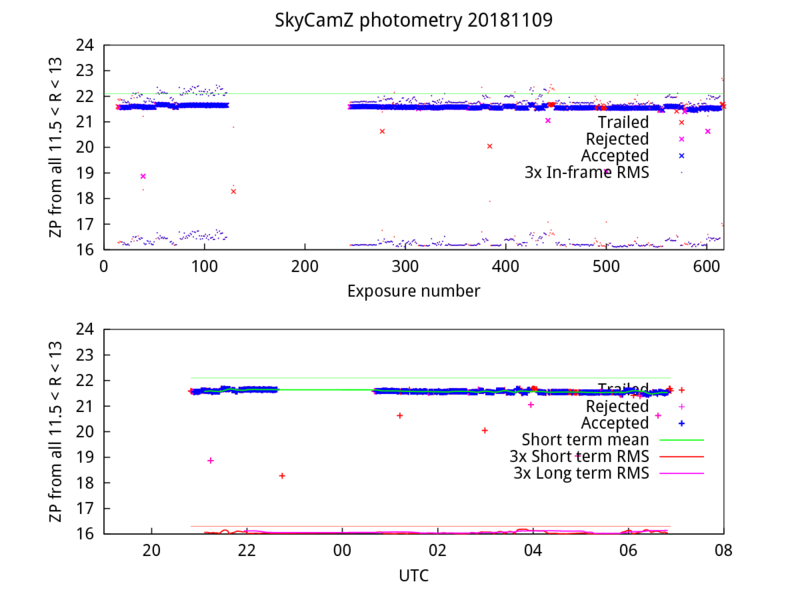 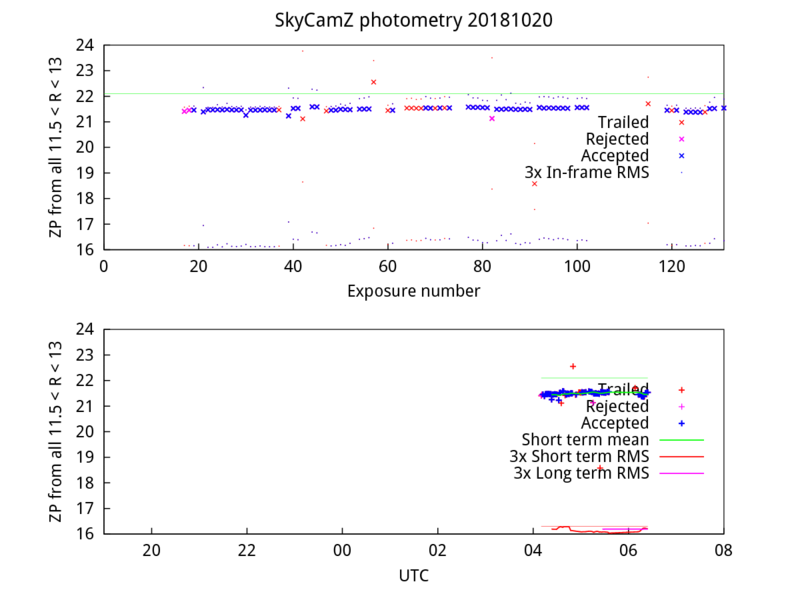 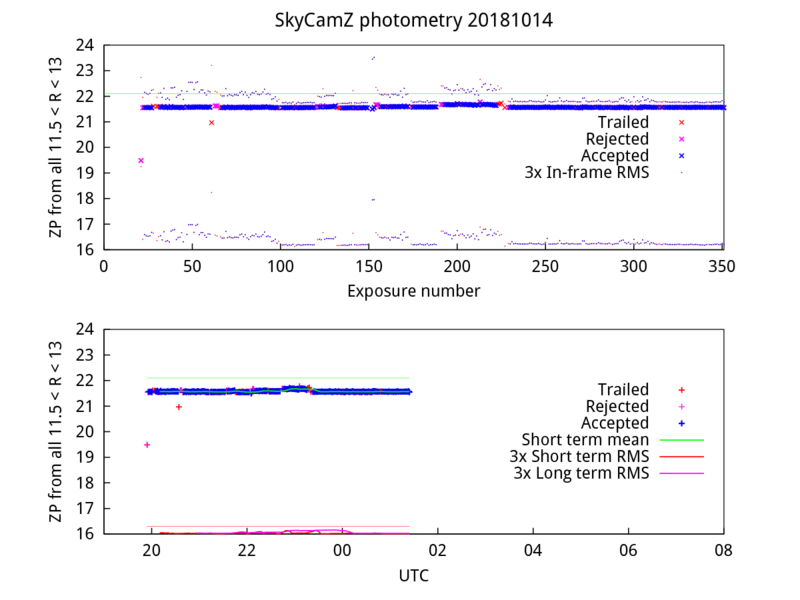 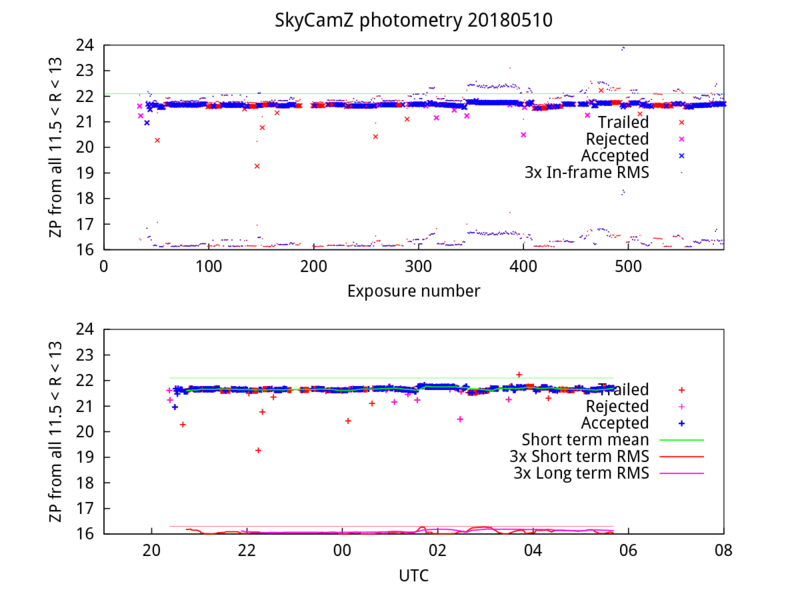 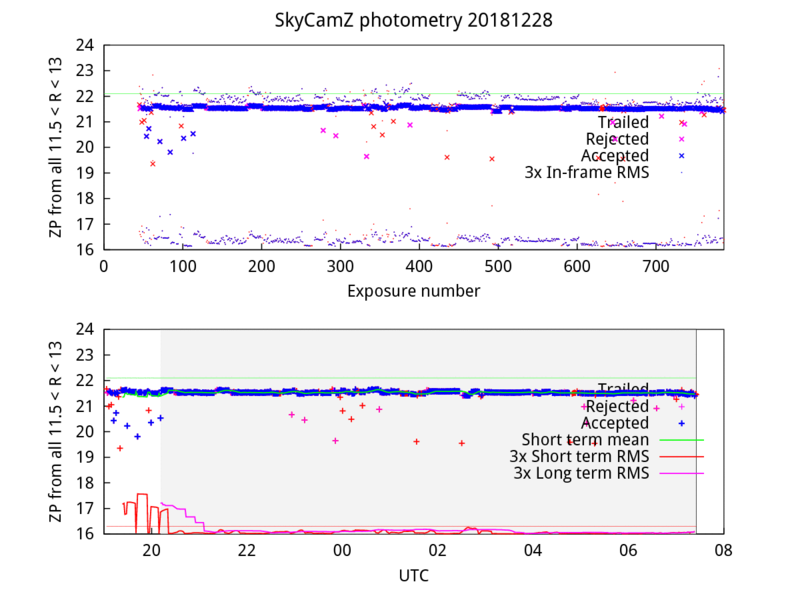 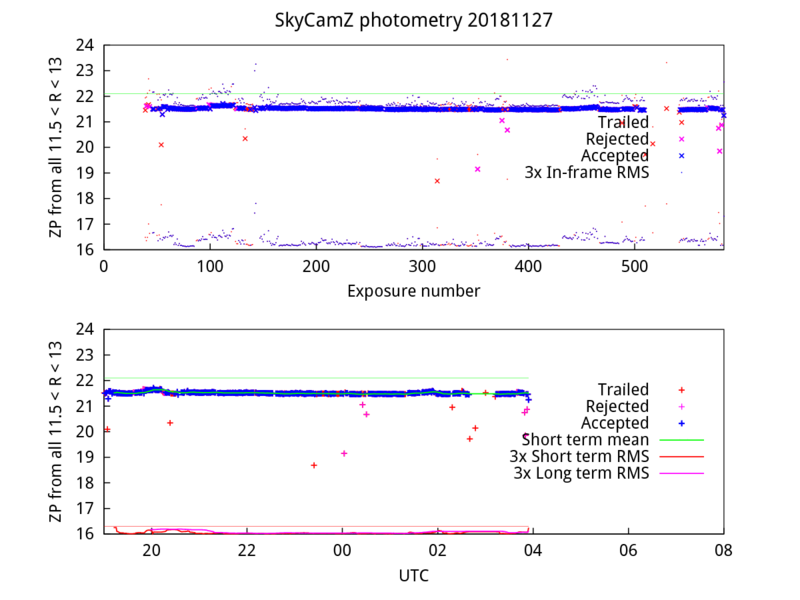 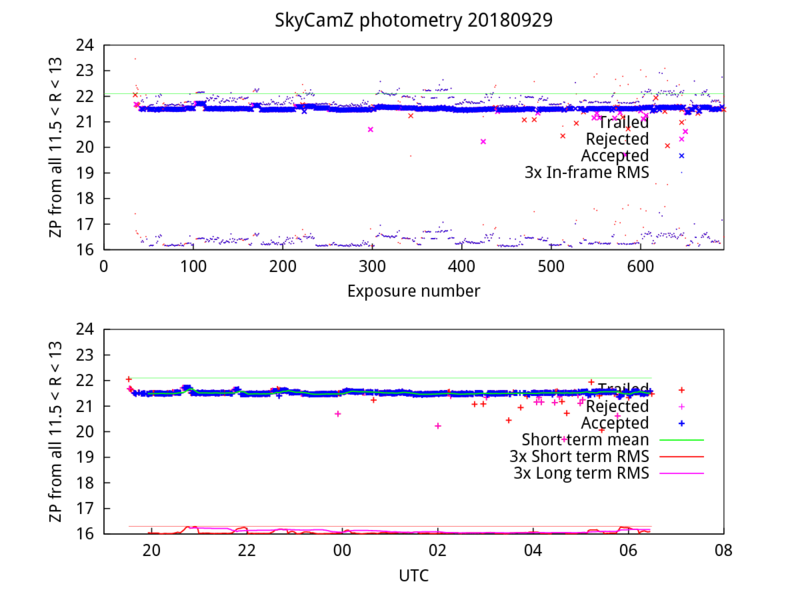 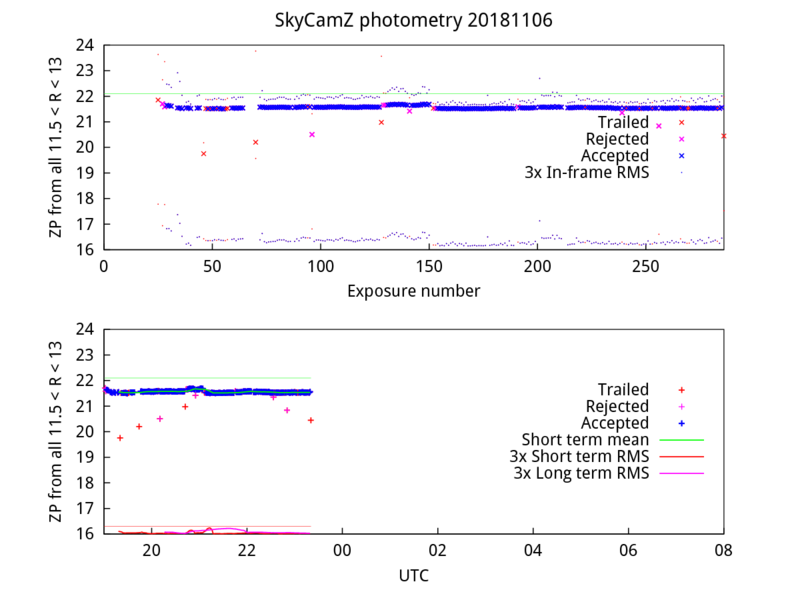 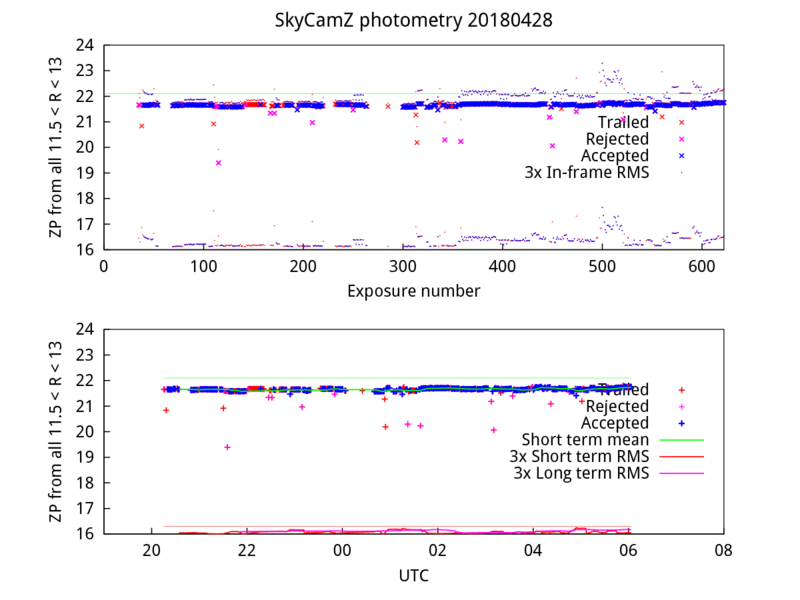 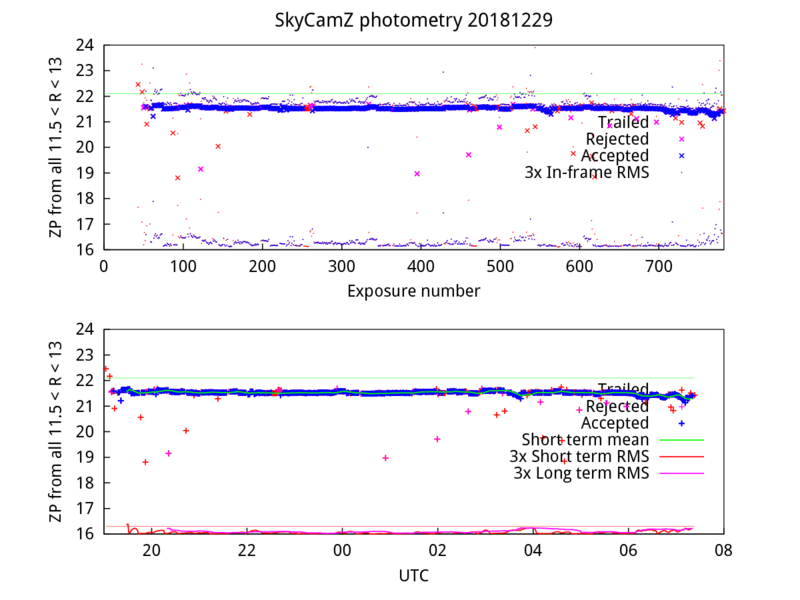 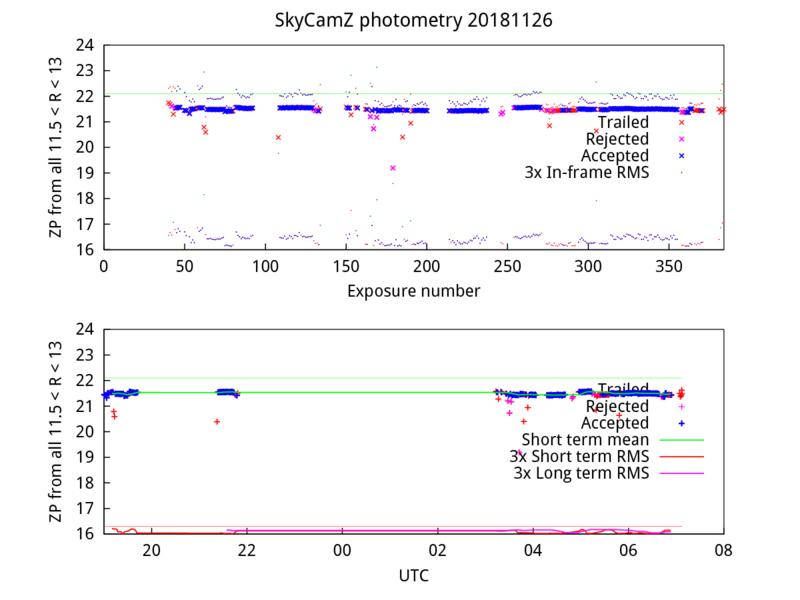 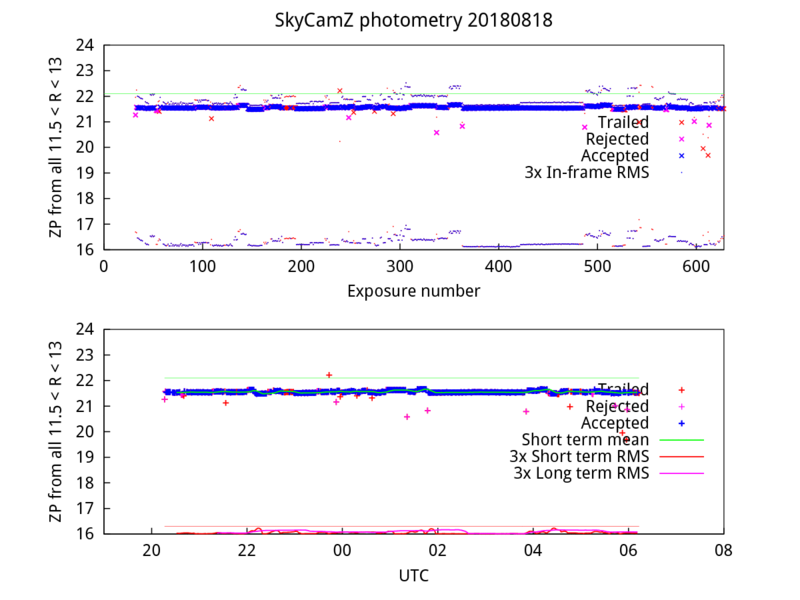 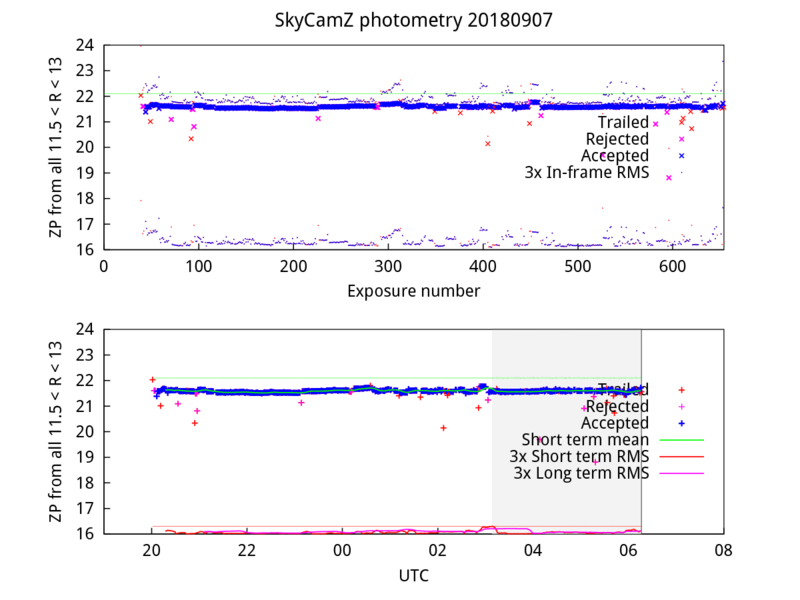 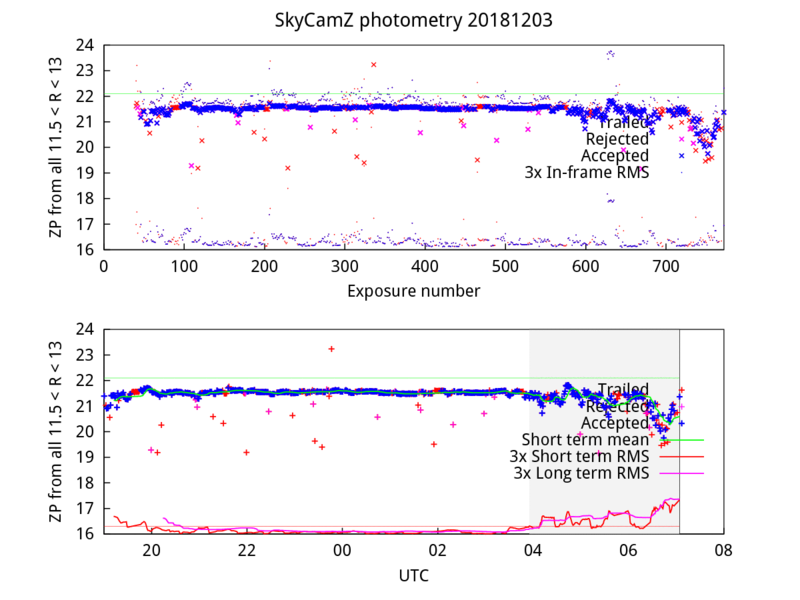 Plots of SkyCamZ Zero Point data are also provided. Zero points here are defined with respect to APASS 10 < r < 13 with no colour term. 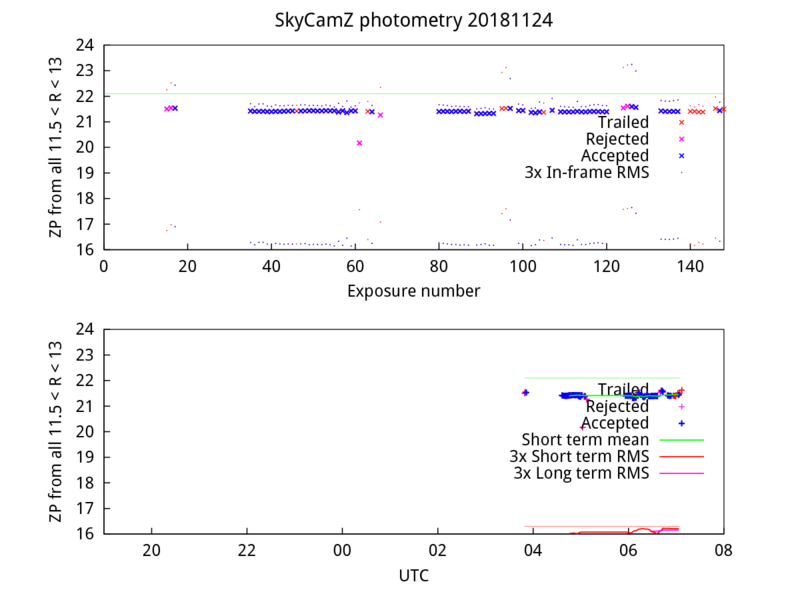 These indicate to first order periods of thin or thick cloud. 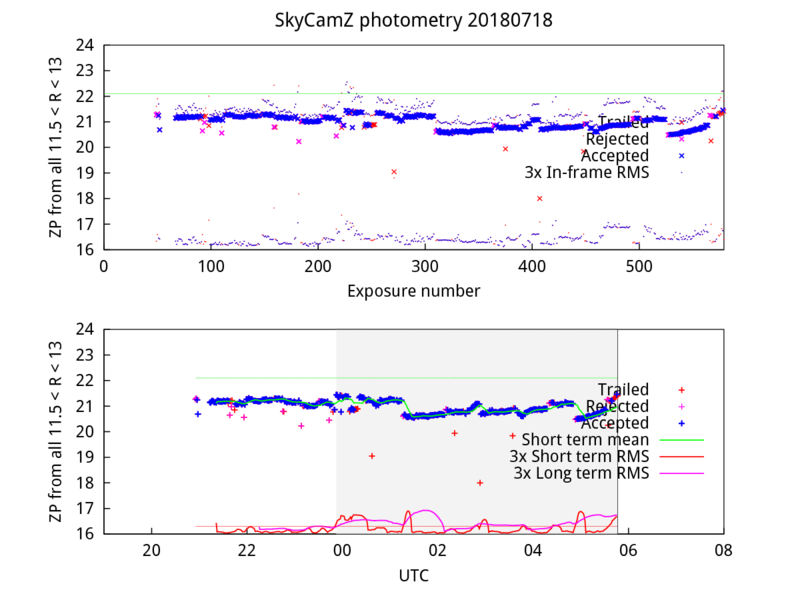 A clear night usually results in a flat distribution of ZP values, while thick cloud causes a dip in the ZP level. 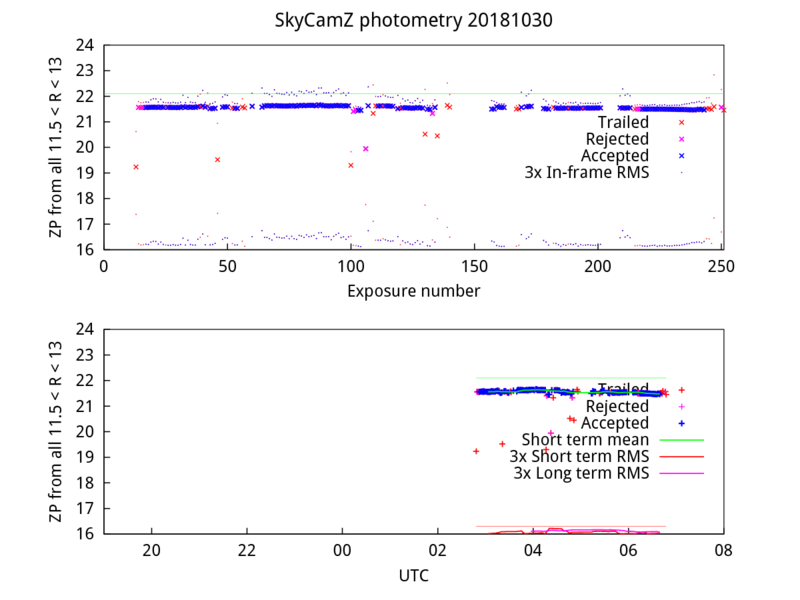 'A', 'T' and 'Z' in the SkyCam columns refer to the camera from which the data were acquired.